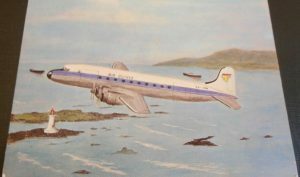 On 23 March 2019, an Air Guinee Douglas DC-4 postcard sold on eBay for 805 British pounds, equal to approximately U.S. $1,050. This is the highest sales price I have ever heard of for a single airline postcard. 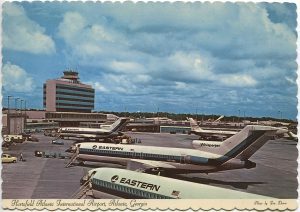 I checked with two other leading airline postcard collectors — Bill Baird and Doug Bastin. Bill said, “that is the highest price I’ve ever seen [for] an airline postcard so far”. Doug observed, “As regards whether it is the highest price, probably yes for a card with no postal history content. 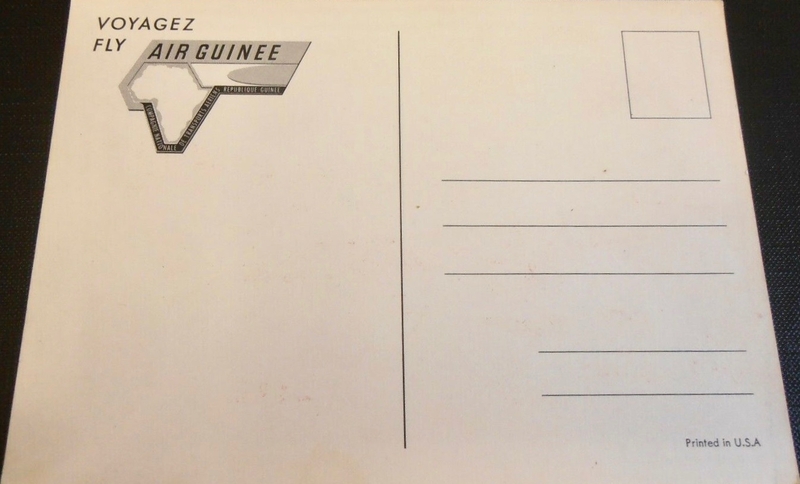 This raised my curiosity to find out what was so special about Air Guinee and this postcard in particular, and that led to my writing this brief article. From 1895 to 1960 a federation of eight French colonial territories, including ‘French Guinea’, existed in what was then known as ‘French West Africa’. Upon those territories gaining their separate independence in 1960, they considered forming, and several did establish, an airline consortium called ‘Air Afrique’. However, the governments of Guinee (the former French Guinea) and Mali decided not to participate, and they formed their respective own national airlines. Air Guinee was founded in 1960 by the Guinee government and existed until 2002. Initially Air Guinee operated with aircraft and assistance obtained from the Soviet Union. 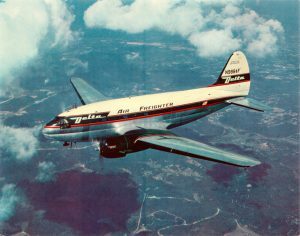 However, in mid-1963 Air Guinee purchased two Douglas DC-4s from Alaska Airlines, and that leads us to the airline postcard at hand. 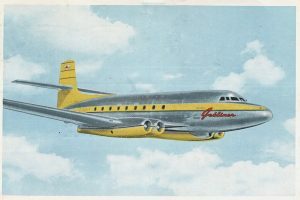 Air Guinee Douglas DC-4 Postcard, Airline Issue, probably 1963, sold on eBay for £805 (approximately $1,050), 23 March 2019. 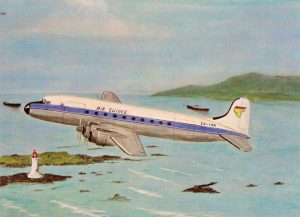 The aircraft on the postcard was described by the seller as a DC-6, but it appears to be an artist’s rendition of a DC-4. Moreover, according to several sources, including a detailed Air Guinee fleet list on the website ‘aerobernie.bplaced.net’ (tab ‘Africa’, subtab ‘Guinee’), Air Guinee never utilized DC-6s. That website does list the two DC-4s acquired by Air Guinee from Alaska Airlines in 1963, registered 3X-KRS and 3X-YUN, which were in Air Guinee’s fleet for three to four years. 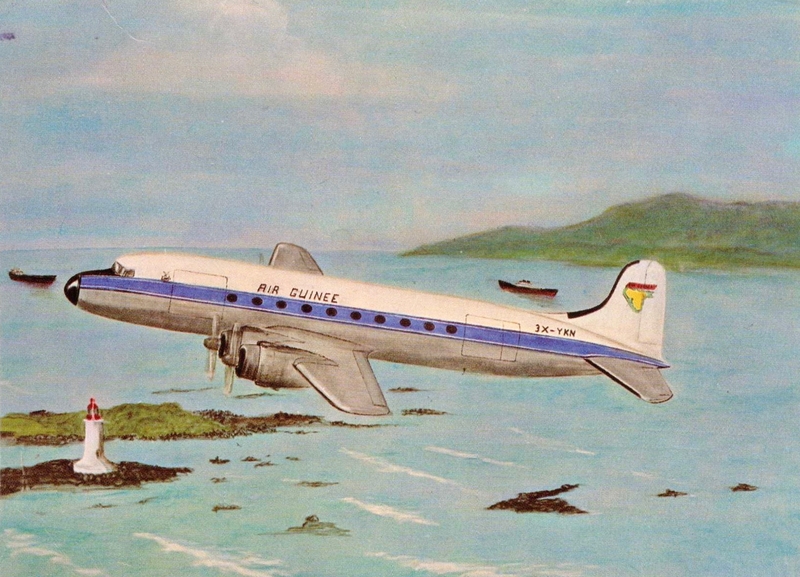 The DC-4 on the postcard bears registration 3X-YKN, but that registration does not appear on any actual Air Guinee aircraft. 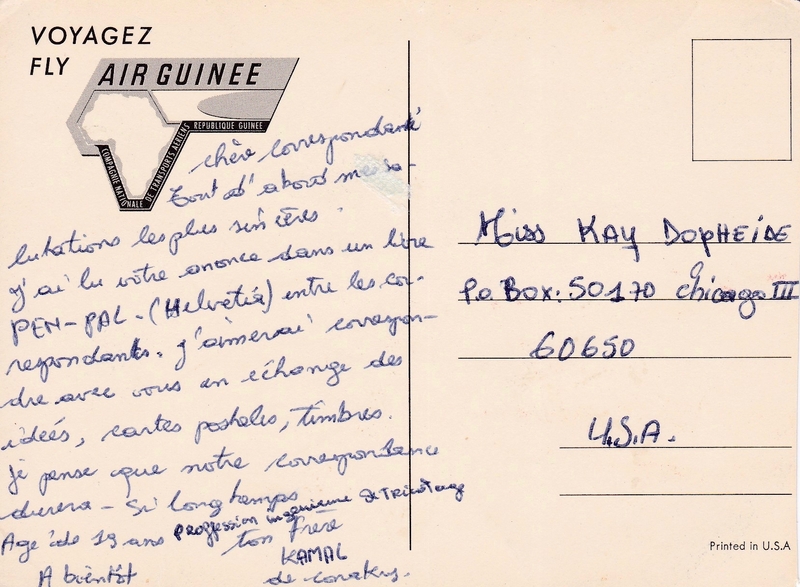 It is possible the postcard was produced before the aircraft was registered in Guinee and the number ultimately given to the aircraft was 3X-YUN rather than the ‘3X-YKN’ supplied to the artist of the postcard. In any event the eBay auction attracted 16 bids from 10 different bidders, and the £1 starting price soared to the ultimate £805 (about $1,050). It was Bill Baird who actually brought this postcard to my attention. He added that he actually has one of these cards in his own collection! He says he never thought much about it and doesn’t even remember how he acquired it. Here are scans of the front and back of Bill’s postcard. Air Guinee Douglas DC-4 Postcard, Airline Issue, probably 1963, William Baird collection. Air Guinee Douglas DC-4 Postcard, Back, Airline Issue, probably 1963, William Baird collection. Doug Bastin, who like me had never seen this postcard before, initially wondered whether the Air Guinee DC-4 postcard might possibly be a fake. He thought it strange that the postcard said ‘Printed in the U.S.A.’ whereas the airline in its early years was closely tied to Soviet assistance. But then he saw on the postcard listing that seller was selling numerous older airline postcards that he acquired from a London collector and that they all seemed to be legitimate. Moreover, I note that the U.S.A. reference isn’t so strange because Guinee’s initial relationship with the Soviets concluded in 1962-63, and Air Guinee acquired its two main DC-4s in 1963 from Alaska Airlines. 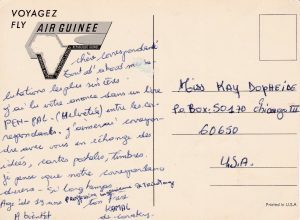 Also, the back of the same card in Bill Baird’s collection, shown above, has a handwritten greeting written in French by a person living in Conakry, the capital of Guinee. 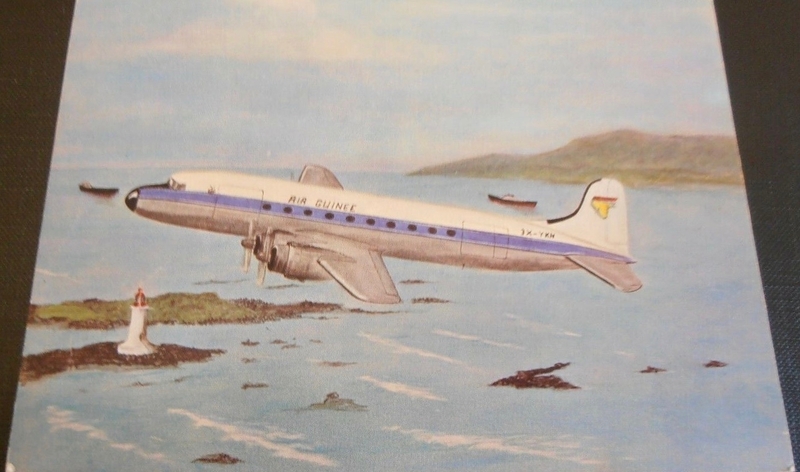 Seller’s March 2019 eBay listings included a different Air Guinee DC-4 postcard claimed to be from the same London collection and also never seen before by me, Doug Bastin or Bill Baird. This card shows the aircraft on the ground with the crew in front, and it sold on the same day for $550 — also an exceptionally high price, above or close to any previous high price for an airline postcard. 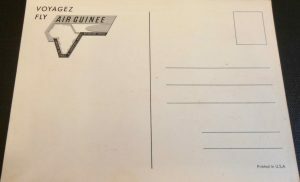 This other Air Guinee postcard attracted 14 bids from 11 different bidders, not all of whom were the same as those that bid on the top-selling card. The same person, however, identified by eBay only as ‘c***_’, was the top bidder on both cards. So what drove up the prices on these two Air Guinee DC-4 postcards? First, the cards appear to be very rare. They are airline issues from an African national airline that produced very few cards and no longer exists. The DC-4 is an old prop aircraft popular with collectors. The aircraft type served with the airline only 2-3 years. And, perhaps most importantly, there were many collectors bidding on the cards, including more than one in each case who was willing to pay an extremely high amount for the prize. As to the record-setting card, two different collectors bid over $1,000 (and a third collector bid nearly $300). 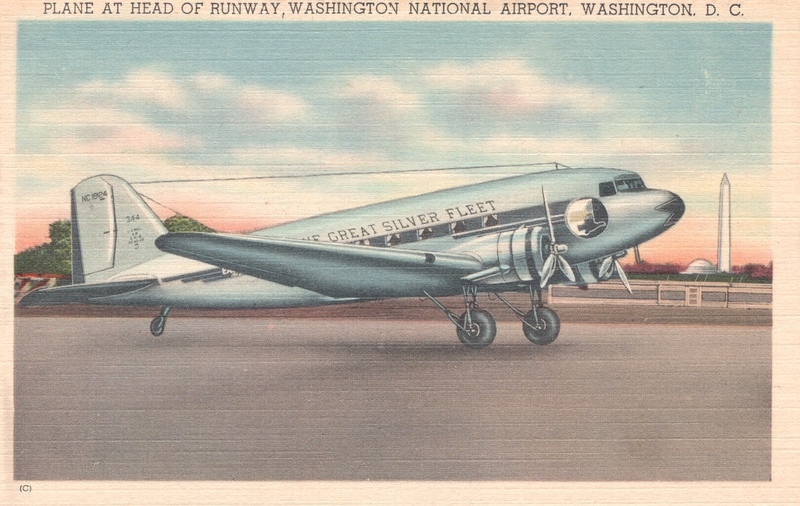 The second card, showing the DC-4 on the ground with crew, had two different collectors bid $550 each (the earlier bid won; and a third collector bid over $200). If you have any comments or more information about these two Air Guinee postcards or how they came to be sold for these top prices, I would be glad to hear from you. I may reached through the ‘Contact Us’ tab at the bottom of the World Airline Historical Society, Inc. website home page at wahsonline.com. Who knows? 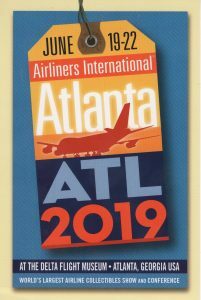 Maybe you will find one of these postcards at Airliners International 2019 Atlanta ! Written by Marvin G. Goldman. Atlanta, Georgia boasts the number one airport in the world measured by number of passengers. Over 100,000,000 travelers fly from and to Hartsfield-Jackson Atlanta International Airport (‘ATL’) each year. Nonstop flights operate from this hub to over 150 domestic and 70 international destinations. 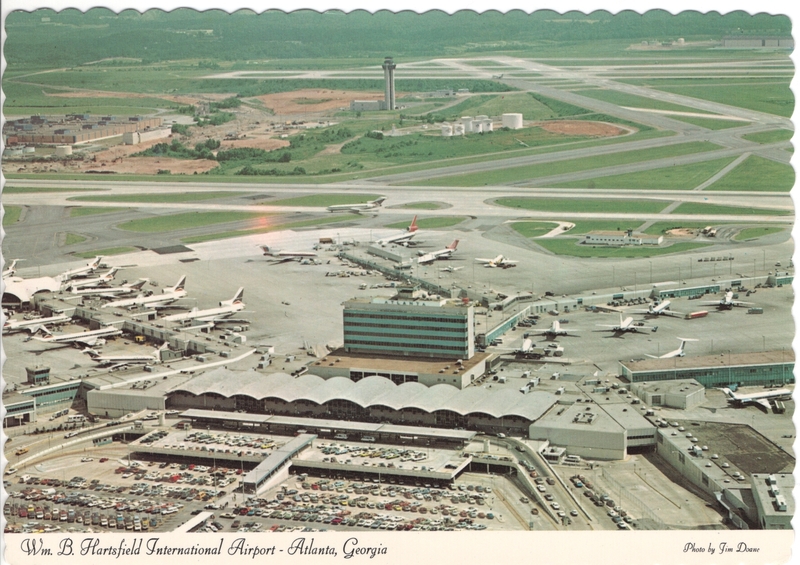 This article traces the development of Atlanta’s premier airport as shown on postcards. 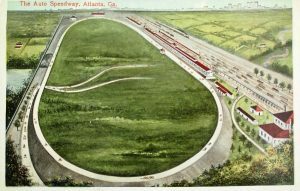 The original site of Atlanta International Airport was once an oval two-mile automobile and motorcycle race track or ‘speedway’, developed from farmland and swampy meadows in 1909 by Asa Candler, the founder of Coca-Cola and later a mayor of Atlanta. 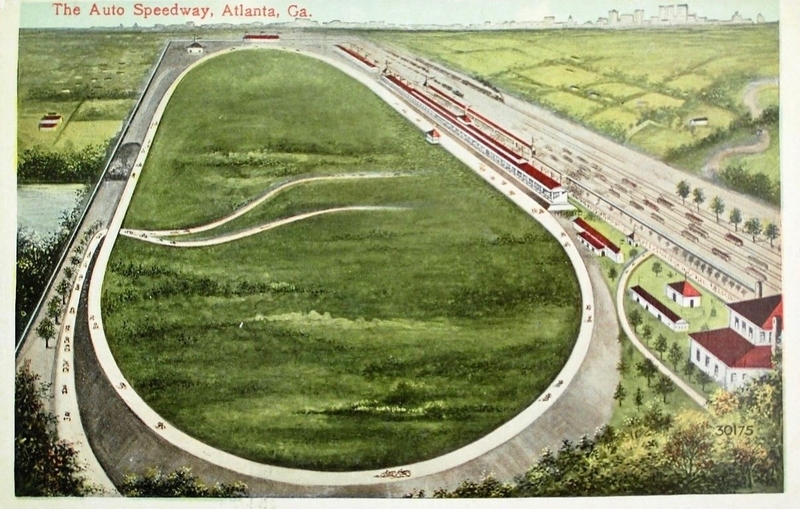 Postcard issued in 1909 showing the Atlanta ‘Auto Speedway’ which site in 1926 became the original location of Atlanta airport, first named Candler Field after the site’s developer, Asa Candler. The card is an artist’s rendition, and the grandstand was actually on the left side of the track while looking north towards the City in this view. Today the north portion of Atlanta International Airport, and the corporate office of Delta Air Lines and the Delta Flight Museum, occupy the area of what used to be that auto race track. The speedway was not financially successful, so Candler started air shows and air races to keep it alive, but by the end of 1910 the operation ceased and the race track was abandoned. The infield of the track, however, started to be used occasionally as an aircraft landing field. 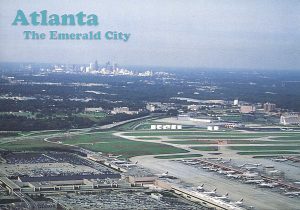 By the early 1920s the City of Atlanta recognized the need for a municipal airport and sought a suitable location. William Hartsfield, an Atlanta city official at the time and later Mayor, suggested the site of Candler’s track. Candler gave a five-year rent-free lease of the land to the City, and construction began in 1925. 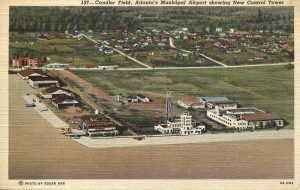 The first commercial flight into the new airport, named ‘Candler Field’, occurred on 15 September 1926, by Florida Airways delivering mail, but that airline ceased operations in 1927. Successful lasting scheduled air service in Atlanta started on 1 May 1928 by Pitcairn Aviation (later known as Eastern Air Lines). On 13 April 1929 the City purchased the airport’s 287 acres of land for $94,400 and changed its name to ‘Atlanta Municipal Airport’, although the name ‘Candler Field’ continued to be used until the mid-1940s. 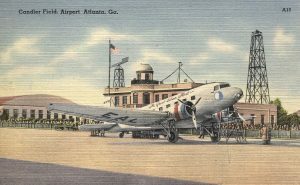 Delta Air Service (later known as Delta Air Lines) became the next airline to add regular service to Atlanta, starting 18 June 1930. Eastern and Delta then dominated air service in Atlanta for many years. On 7 May 1932 Atlanta airport opened a new administration and passenger terminal. 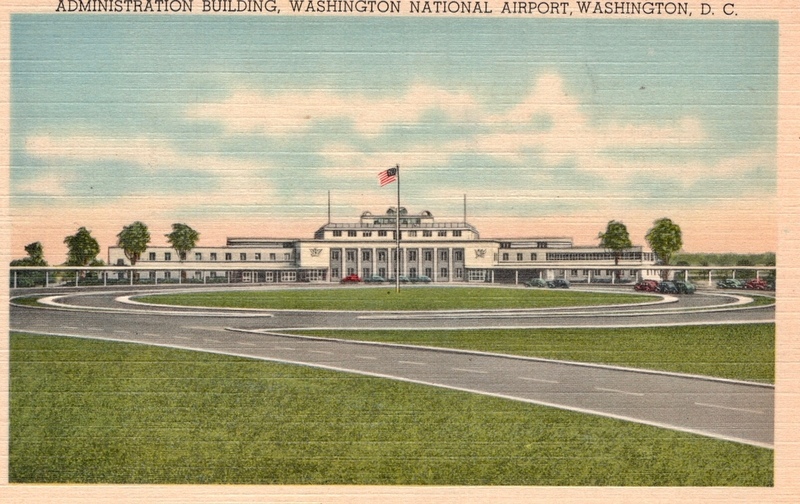 This terminal appears in the center of the following two postcards. 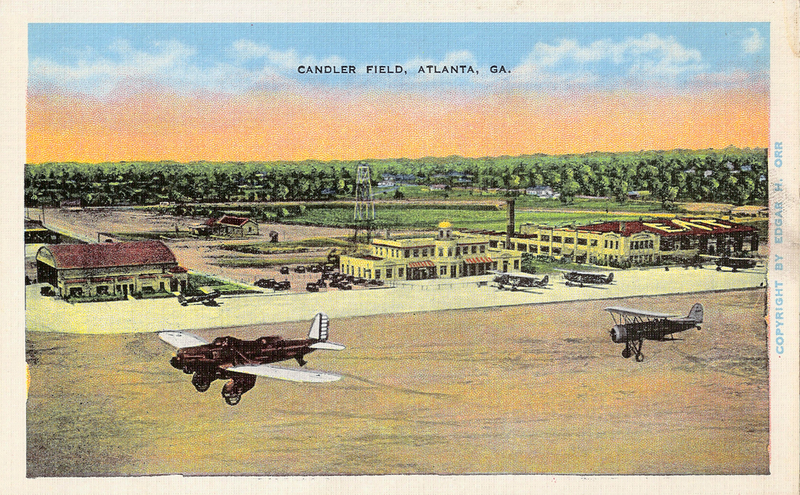 Candler Field, Atlanta, postcard, probably issued between 1932 and 1934, showing the airport’s new terminal in the center, which served from 1932 to 1948. 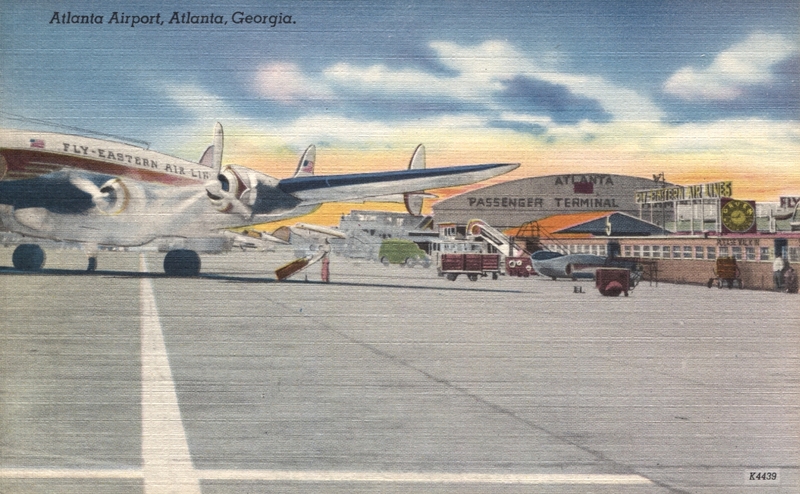 The building at the far right with the letters ‘E.A.T.’ (Eastern Air Transport, later known as Eastern Air Lines) previously served as Atlanta’s first airline terminal. The hangar on the left originally was utilized by American Airways (later known as American Airlines) which operated in Atlanta only for a few years until 1934. The three aircraft parked on the ramp are Stinson T Tri-Motors, a type utilized by American and acquired by Delta in 1934. In March 1939 Atlanta airport inaugurated its first control tower, erected atop the 1932 terminal building, seen in the center of the following postcard. 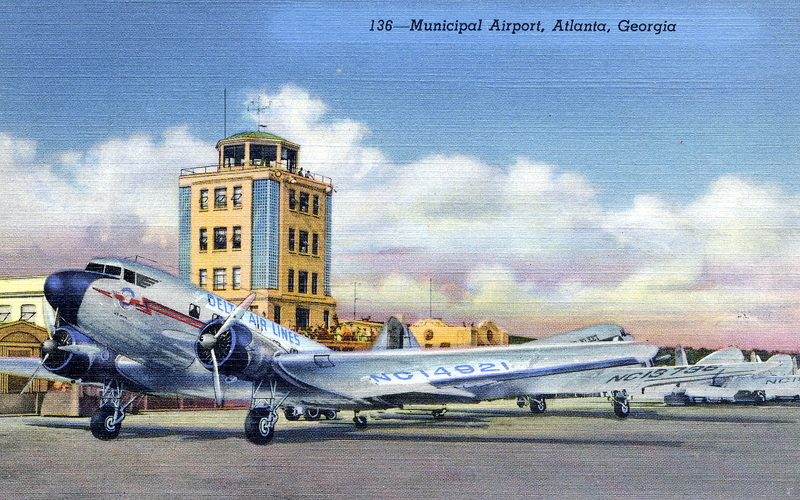 Candler Field (Atlanta Municipal Airport), showing its new 1939 control tower. (Pub’r R. & R. News, Atlanta, Curteich, Chicago, no. 9A-H83, issued 1939). The back of this postcard proudly claims ‘28’ daily airline arrivals and departures — up from the ‘26’ mentioned in the preceding card. Delta Douglas DC-2, NC14921, at Atlanta. (Pub’r R. & R. News, Curteich, nos. 136 and 0B-H1385, issued 1940). There are at least two versions of this card; this one refers to the ‘Merry-Go-Round’, as explained on the back: “Large crowds gather twice a day to view the arrival and departure, within a space of only a few minutes time, of seven large passenger ships; and this spectacular sight is known as the famous ‘Merry-Go-Round’”. 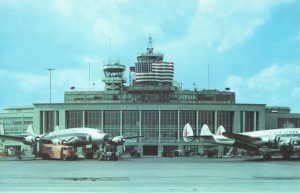 In October 1940 the U.S. Government designated Atlanta airport as a military base alongside the airport’s civil aviation role, and during World War II (1941-45) ATL doubled in size. Meanwhile, Delta in 1941 moved its headquarters from Monroe, Louisiana, to Atlanta, further adding to the airport’s prominence. 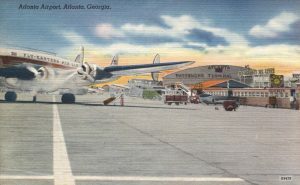 With military and civil airline expansion, ATL in 1942 experienced a record 1,700 takeoffs and landings in a single day, making it the busiest airport in the U.S.
Delta Air Lines built this hangar at Atlanta airport in 1941, coinciding with its headquarters move from Monroe, Louisiana, to Atlanta. 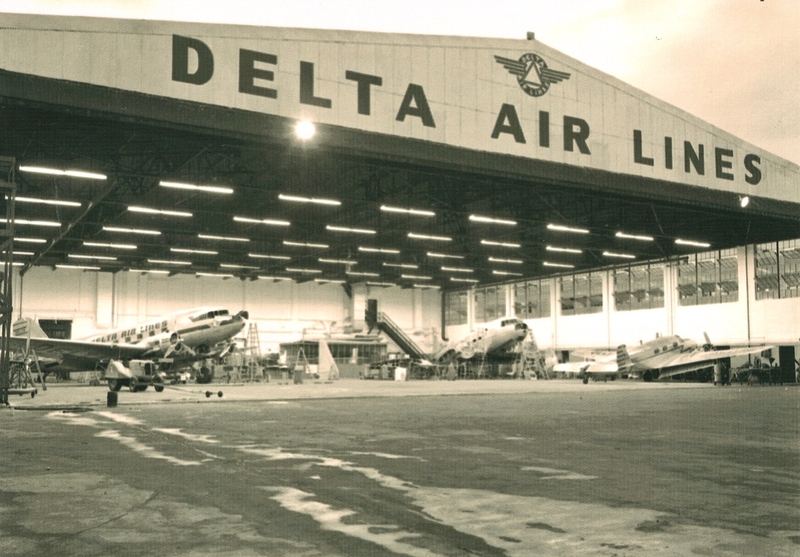 This postcard shows Delta Douglas DC-3s and a Lockheed L12A Electra Junior in Delta’s hangar during 1945-46. 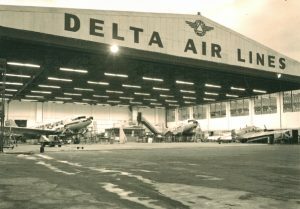 This hangar is now part of the Delta Flight Museum. 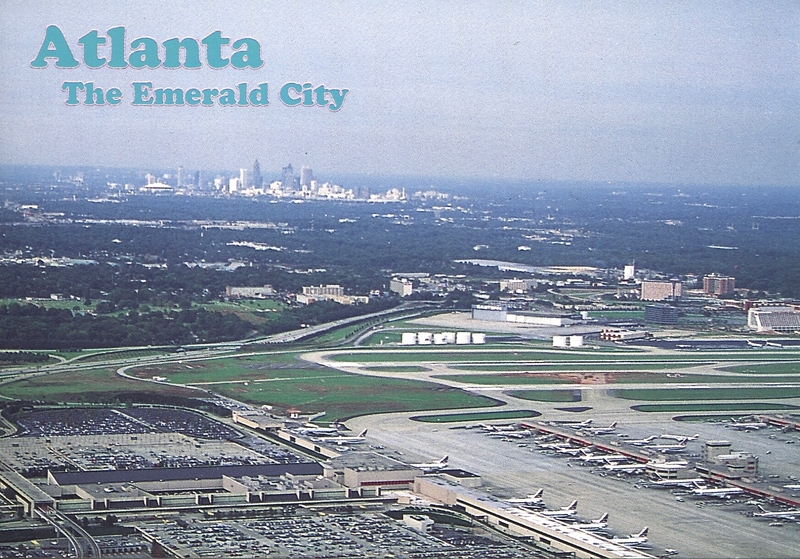 (Pub’r jjPostcards for Airliners International Atlanta 2015, card 2). Delta Air Lines Douglas DC-4, NC37475, at Atlanta, about 1946-47. 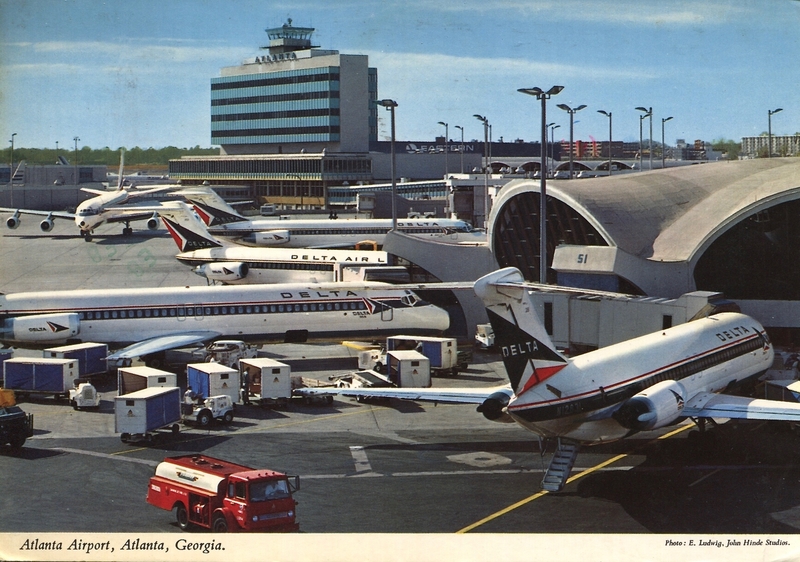 (Pub’r jjPostcards for Airliners International Atlanta 2015, card 5). By 1948 the Atlanta terminal built in 1939 could no longer handle the volume of passengers. More than 1 million passengers came through ATL that year. 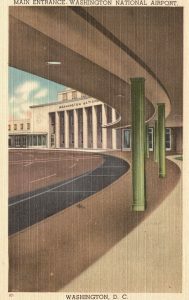 Airport officials worked on plans to build a much larger terminal, and on 9 May 1948 they moved ATL’s operations ‘temporarily’ into a war-surplus hangar, which became known as the ‘Temporary Passenger Terminal’. 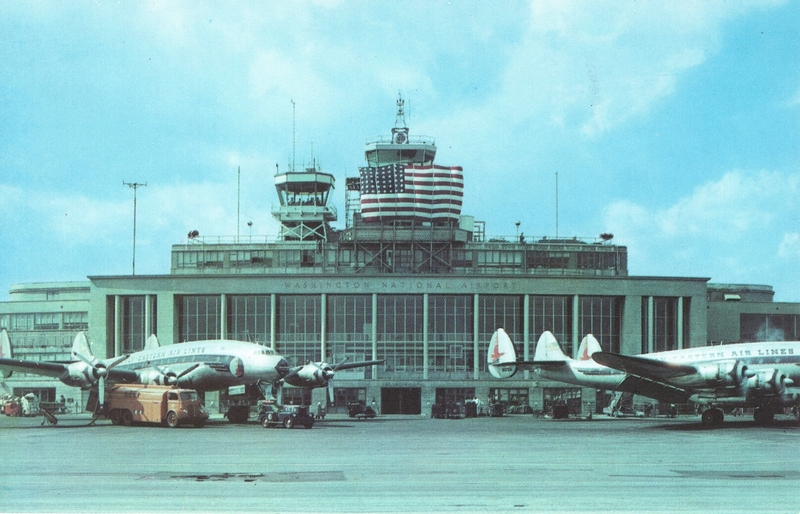 The control tower atop the 1939 terminal, however, remained in use until a new one opened in 1961. 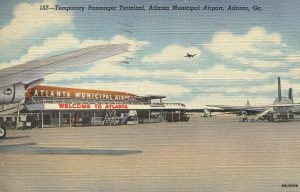 Atlanta Municipal Airport’s ‘Temporary Passenger Terminal’ established in a hangar in 1948, pending development of a new terminal. (Pub’r R. & R. News, Curteich, nos. 137 and 8B-H706, issued 1948). Delta Douglas DC-6, N1902M, and DC-3s of Delta and Capital Airlines at Atlanta Municipal Airport’s ‘Temporary Passenger Terminal’. (Pub’r Atlanta News Agency, Dexter Press no. 50317). Interior of the ‘Temporary Passenger Terminal’ at Atlanta Municipal Airport, 1948. In this view you can see ticket counters for Eastern, Delta and Capital Airlines. The back of the card says ‘The ticket counter, 200 feet in length, is the world’s longest’. (Pub’r R. & R. News, Curteich no. 8B-H1640). Eastern Air Lines Lockheed Constellation at the east side of Atlanta’s ‘Temporary Passenger Terminal’. (Pub’r Athens News Agency, Atlanta, Colourpicture, no. K443, photo by Carolyn Carter). Ex-Deke Billings Collection. 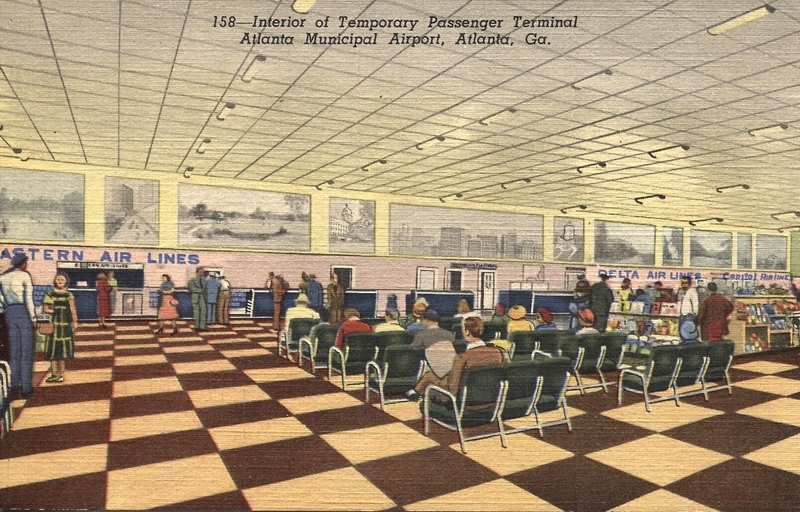 Atlanta’s ‘Temporary Passenger Terminal’ proved to be not so temporary. 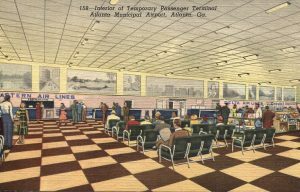 It remained in use from 1948 until May 1961 when, after nearly a decade of planning and construction, the Atlanta Municipal Airport finally opened its new ‘Jet Age’ terminal, publicizing it as the ‘largest single terminal’ in the U.S. The terminal was designed to accommodate 6 million passengers a year, but in its first year 9.5 million used it! Entrance ramp to the new terminal building of Atlanta Municipal Airport, with the administration building and new control tower rising in the back. (Pub’r Atlanta News Agency, Chamblee, Georgia, Colourpicture, Boston, no. P43445, issued about 1961). The new Atlanta airport terminal shortly before it opened in 1961, seen from the center concourse of the ‘temporary’ 1948 terminal. At this stage, aircraft were still parked in front of the new terminal. The tail of Eastern Lockheed L-188 Electra, N5509, is at left. (Pub’r Curteich no. 1DK-777, 1961). 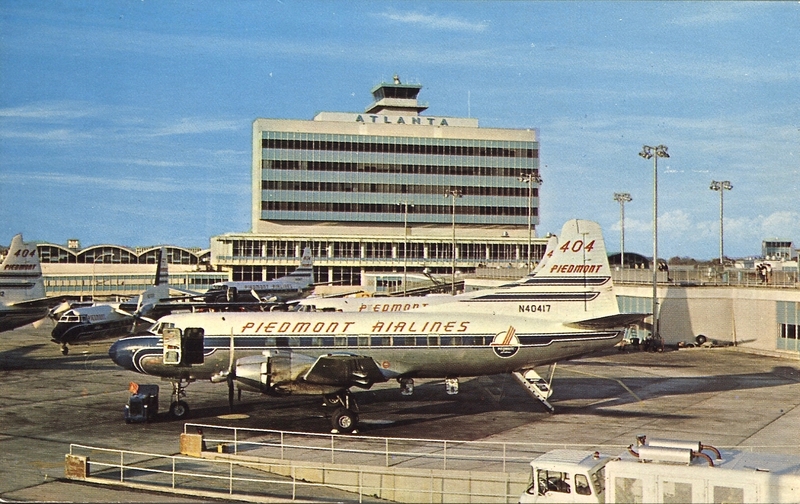 Crowded ramp space at Atlanta for Piedmont Airlines aircraft in the early to mid-1960s, with Piedmont Martin 404, N40417 in the foreground. Note also the observation deck at right atop Concourse C-D. (Pub’r Nelson Jones, Lakewood, Ohio). Delta Douglas DC-8, N801E, and passengers deplaning at Atlanta. 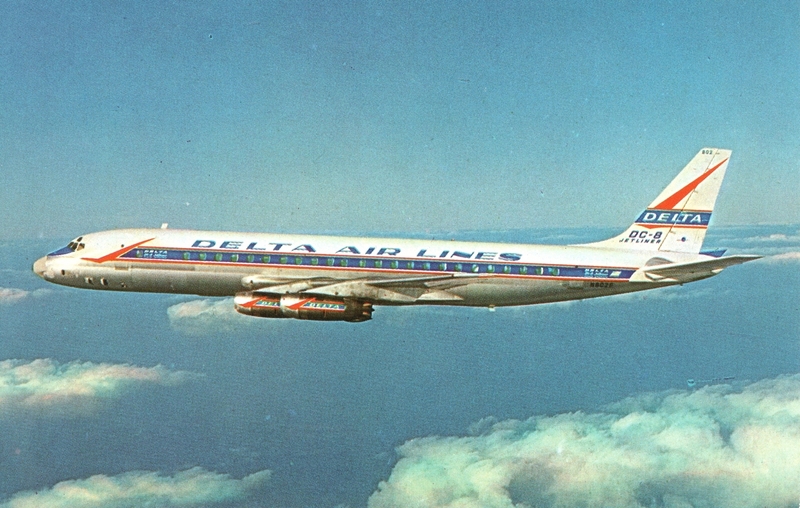 Delta was the launch customer for the DC-8, and this aircraft (originally a DC-8-11) was the first of the type delivered to Delta, on 22 July 1959. (Pub’r Delta Heritage Museum, 2002). Delta Douglas DC-9-14, N3309L, taking off from Atlanta, 1965. Delta was also the launch customer for the short-haul DC-9. It began scheduled service of the type on 8 December 1965. (Pub’r Delta Heritage Museum, 2002). 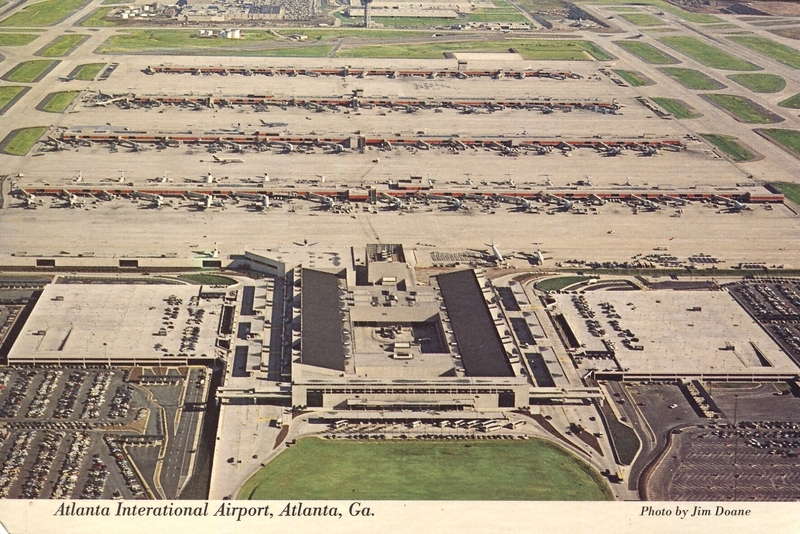 Aerial view of the Atlanta airport terminal area and concourses about 1965. At Concourses B and C in the foreground are an Eastern DC-7 with the blue and white ‘hockey-stick’ livery introduced in early 1965 and a Piedmont FH-227. Towards the top right are Concourses E and F almost entirely filled with a mix of Delta jet and prop aircraft. (Pub’r Atlanta News Agency, Chamblee, Georgia, Dexter Pres, no. 6255-C). Delta Air Lines aircraft at Atlanta airport showing rotundas and gates added to Concourses E and F in 1968. (Pub’r John Hinde, Dublin, no. 2GA13). On 22 February 1971 former Atlanta Mayor William Hartsfield died. 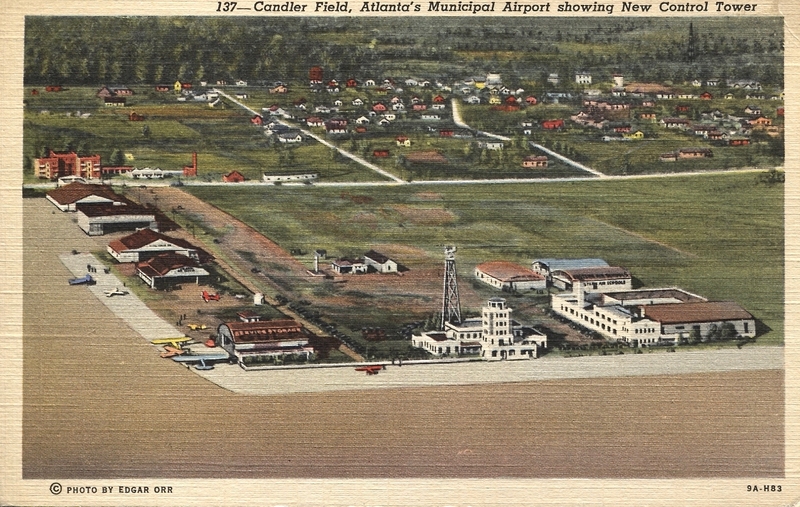 He was the person who, in the early 1920s while serving as an Atlanta alderman, suggested the site of Asa Calder’s former auto speedway to be the location of Atlanta’s main airport. On 28 February, what would have been his 81st birthday, the airport’s name was changed to William B. Hartsfield Atlanta Airport in his honor. 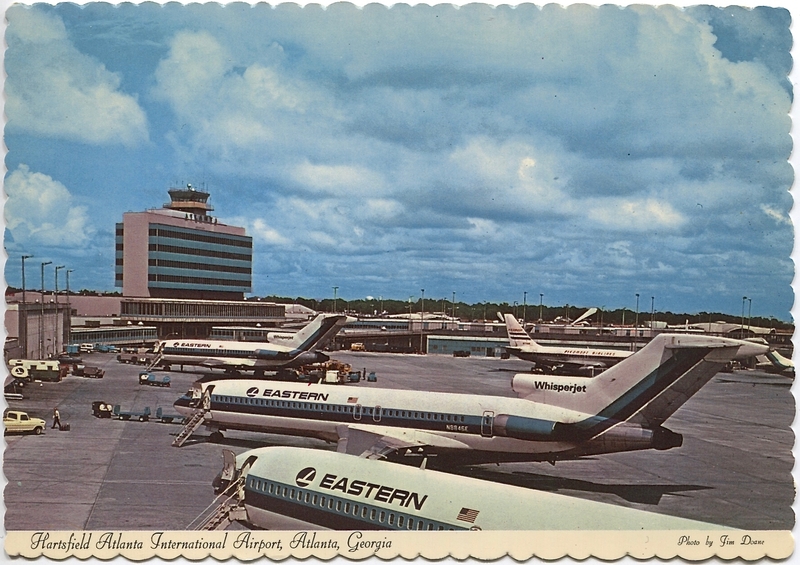 Four months later, on 1 July 1971, when Eastern Air Lines introduced the airport’s first international service (to Mexico and Jamaica), the airport’s name was again changed — to William B. Hartsfield Atlanta International Airport. The new name appears on the next two postcards. 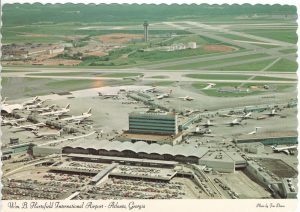 Aerial view of the Atlanta airport terminal area and concourses about 1976. Almost all the aircraft are now jets. The top shows the airport’s new tall control tower built in the mid-1970s. (Pub’r Atlanta News Agency, Atlanta/Dexter Press no. D-37335-D). Ex-Allan Van Wickler Collection. Eastern Air Lines Boeing 727s parked along Concourse B at Atlanta airport, about 1974-76. (Pub’r Atlanta News Agency, Dexter Press no. DT-82467-C). 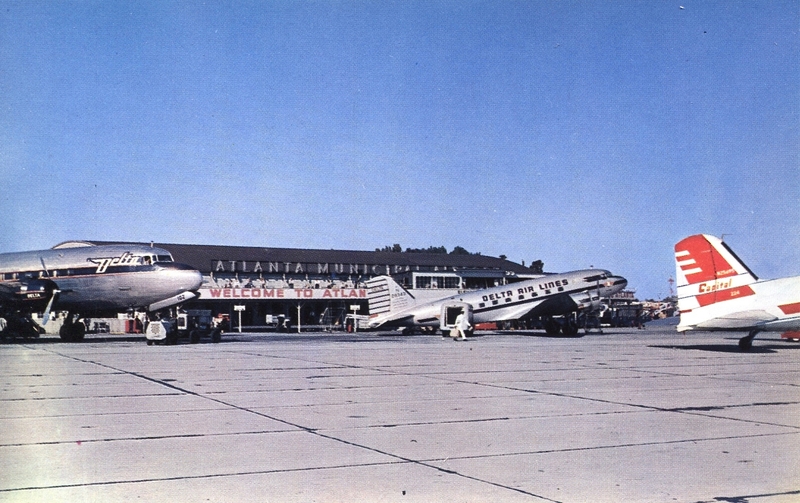 During the 1960s and 1970s passenger traffic at Atlanta continued to grow rapidly. 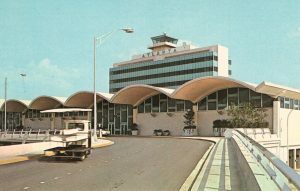 The designed capacity of the 1961 ‘Jet Age’ terminal proved to be insufficient from the time it opened. Further concourse and gate additions were made, but passenger growth continued to outpace the expanded facilities. 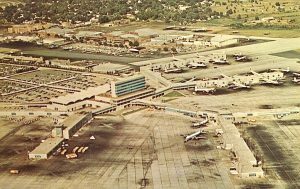 As early as 1964, formal planning studies recommended a completely new ‘Midfield’ terminal concept, in a central location between the runways. 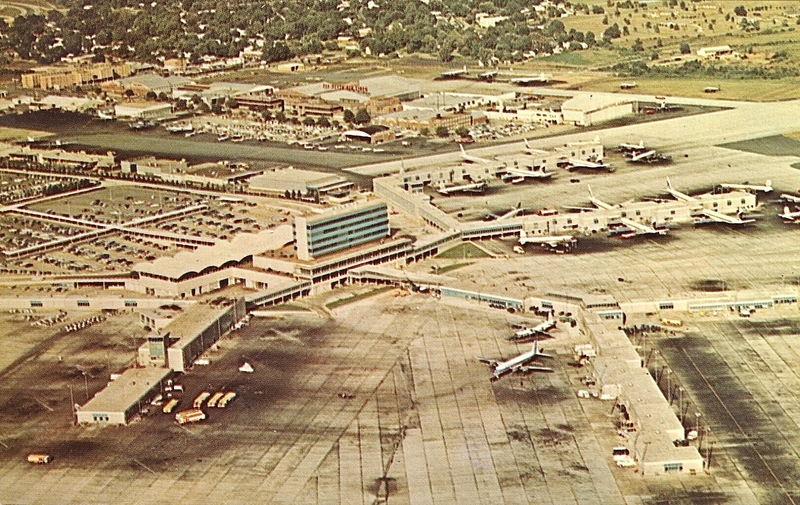 This concept was adopted, and after years of construction the new Midfield terminal opened on 21 September 1980. The ‘Midfield’ design included two symmetrical landside terminal sections. These were connected to four remote parallel concourses by an underground ‘transportation mall’ featuring moving sidewalks and a modern shuttle system. The design was modular, and this enabled the airport to extend the underground area and add more concourses as passenger traffic increased. The Midfield complex, with expansions over the years, is still in operation today. It is the largest passenger transfer hub in the world. 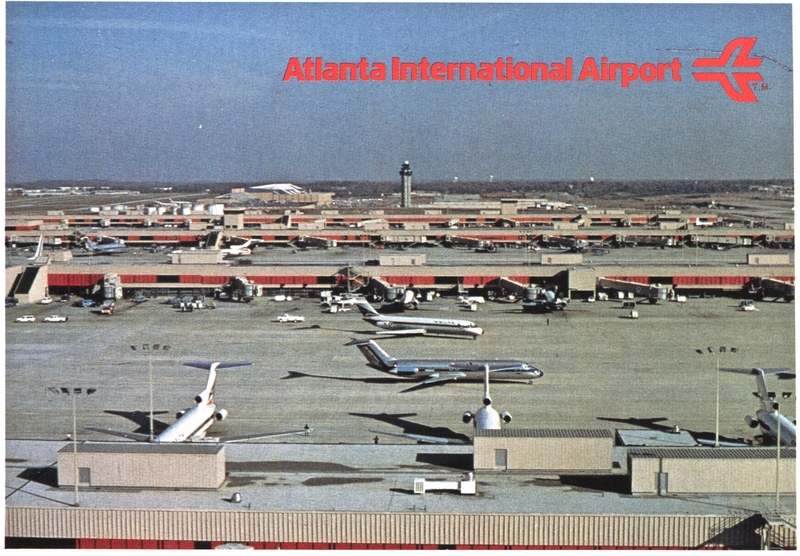 Atlanta International Airport view, about 1981, of the ‘Midfield’ Terminal that opened on 21 September 1980. (Pub’r Aerial Photography Services, Atlanta, Dexter Press 70990-D). Ex-Allan Van Wickler Collection. The main terminal is in the foreground, concourse T extends sideways from the terminal building, and concourses A through D are in four rows beyond that. The grassy area at the top center now contains Concourse E and, to the right of the control tower, the international terminal. Atlanta International Airport Midfield concourses, facing east with concourse A of Delta in the foreground, about 1980-81. (Pub’r Thomas Warren, Atlanta, no. A-154). ATL about 1991-93, looking north with downtown Atlanta in the distance. Concourse T in the center was still being used for international flights. (Pub’r Aerial Photography Services, Atlanta, no. MC3-2543, photo by Jim Doane). Atlanta International Airport, late 1990s. This view shows the north and south groups of runways and taxiways on both sides of the Midfield concourses. The main terminal is at the left, and one can see, from left to right, concourses T, A, B, C, D and a small portion of then new concourse E.
In October 2003, in honor of the late Atlanta Mayor Maynard Jackson, the airport was renamed ‘Hartsfield-Jackson Atlanta International Airport’. 2017 marked the 20th consecutive year that Atlanta International Airport has been recognized as the busiest airport in the world. 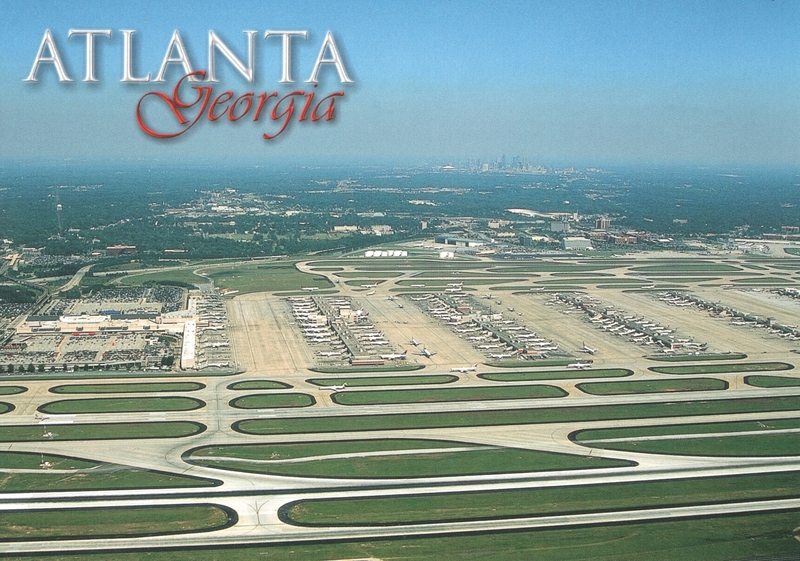 ATL is the only airport ever to reach the 100 million passenger mark in a single year. 2017, with nearly 104 million passengers, was the third consecutive year that ATL surpassed that milestone, and it is likely to have done so again in 2018. ATL also is number 1 in the world in aircraft movements, with 879,560 operations in 2017. 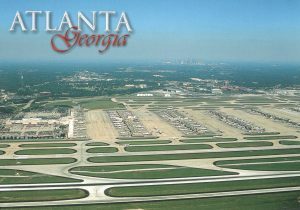 Atlanta International Airport is now expanding and modernizing further as its passenger volume continues to grow. It is implementing a 20-year master plan adopted in 2016 that includes modernization of the existing terminals, expansion of Concourses D and T, construction of a new international Concourse G, new parking and ground facilities, a new sixth runway, and many more features to enhance the flying experience. 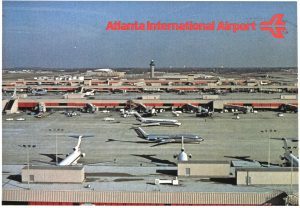 Official Airliners International ATL 2019 Postcard. Come see the amazing Hartsfield-Jackson Atlanta International Airport for yourself. The 2019 annual Airliners International show and convention will be held during 19-22 June 2019 at the Delta Flight Museum located at the airport. 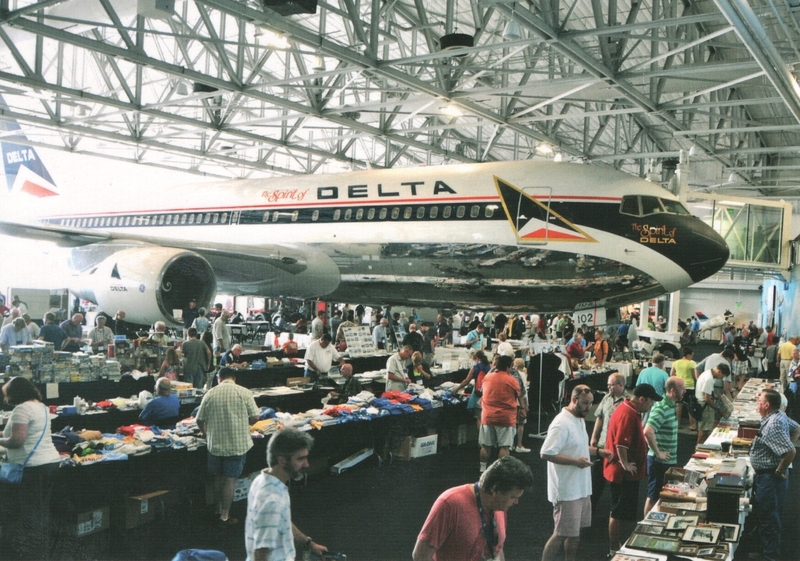 The following postcard shows the collecting scene at the previous (2015) Airliners International show in the Delta Flight Museum, with the Delta Boeing 767 ‘The Spirit of Delta’ right inside the show venue. View of the Airliners International ATL 2015 show in the Delta Flight Museum. 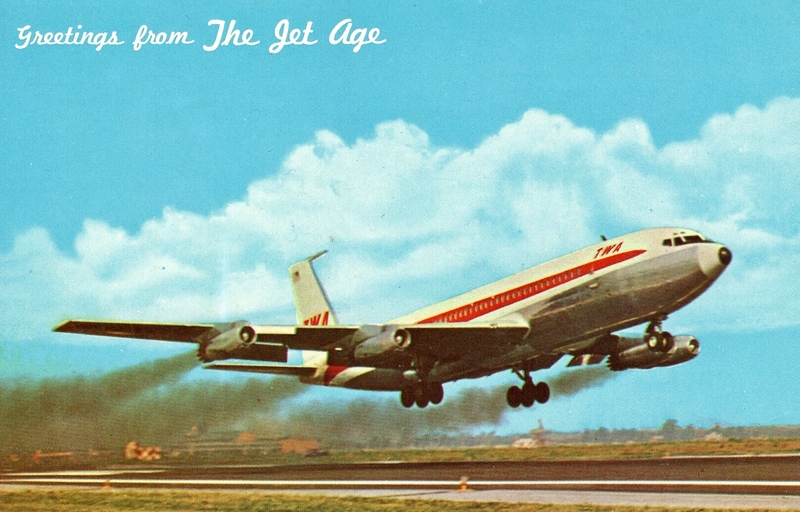 (Postcard issued by Airliners International 2015 and 2016, pub’r jjPostcards). 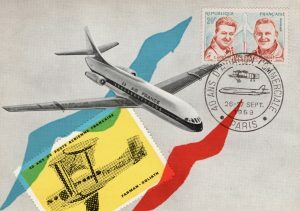 I also encourage all airline and airport postcard collectors who are members of the World Airline Historical Society to enter the Airliners International 2019 Postcard Contest in Atlanta, 19-22 June 2019. Postcard contest rules are on the show website, www.airlinersinternational.org. Whether you win or not, your entries stimulate others to start or expand airline memorabilia collecting, and it’s a great boost for all collectors. All postcards shown in this article (except for the first two which are internet images) are from the author’s collection. David Henderson website ‘sunshineskies.com’, tab ‘ATL History’. 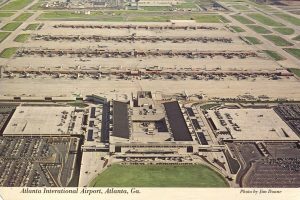 This is an outstanding site with a remarkable detailed pictorial history of Atlanta airport from 1909 through the 1990s. Hartsfield-Jackson Atlanta International Airport website, ‘atl.com’, tab ‘About ATL’, subtab ‘History of ATL’. Delta Flight Museum website, ‘deltamuseum.org’. Cearley, Jr., George W., A Pictorial History of Airline Service at Atlanta, 168 pp. (self published, 1991). Braden, Betsy & Hagan, Paul, A Dream Takes Flight: Hartsfield Atlanta International Airport and Aviation in Atlanta (Univ. of Georgia Press, 1989). Davies, R.E.G. (a) Delta: An Airline and Its Aircraft — The Illustrated History of a Major U.S. Airline and the People Who Made It, illustrated by Mike Machat. Paladwr Press (1990); and (b) Eastern: An Airline and Its Aircraft, illustrated by Mike Machat. Paladwr Press (2003). Until the next article, thank you for viewing, and Happy Collecting. Marvin. Delta ‘Welcome’ postcard in its ‘Keep Climbing’ series, issued by the airline about 2017. Delta Air Lines has a long and fascinating history, starting with a tiny operation in the mid-1920s. In its early years Delta was not favored with government-subsidized mail contracts and route awards to the extent enjoyed by American, Eastern, Pan Am, TWA and United, but Delta grew internally with good management, and eventually it also acquired several large airlines, including Chicago & Southern (1953), Northeast (1972), Western (1987) and Northwest (2009). By the end of 2017, Delta’s annual revenue totaled $41 billion (3d largest in the world, just after Lufthansa group and American Airlines group). It carried 186 million passengers in 2017 (2d only to American’s group) with over 850 aircraft, to more than 335 destinations. 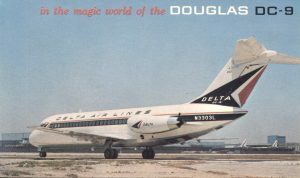 I devote about half of the postcard images in this article to Delta itself, and have selected one or two postcards for each of the more significant Delta predecessors. I have also included certain dates of airline acquisitions, service periods and liveries to aid in assigning a time frame to postcards of Delta and its predecessors. 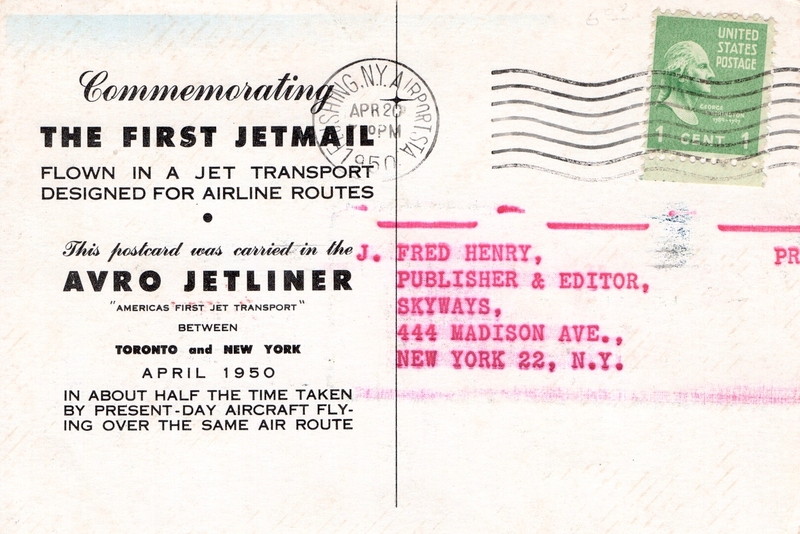 Compared to the other major U.S. airlines (such as American, Eastern, Pan Am, TWA and United), Delta in the pre-internet era distributed relatively fewer ‘airline-issued’ postcards. 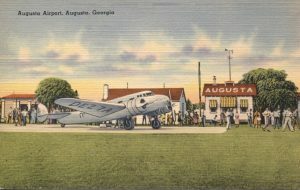 However, in recent years the Delta Flight Museum in Atlanta (also known as the Delta Air Transport Heritage Museum) has been issuing several modern postcards showing Delta aircraft or reproductions of historic Delta posters that are available for purchase at the museum or on its website “deltamuseum.org”. 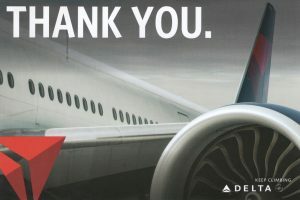 In addition, Delta has been issuing in the U.S. and from local offices in Europe some modern ‘advertising’ or ‘destination’-type postcards. 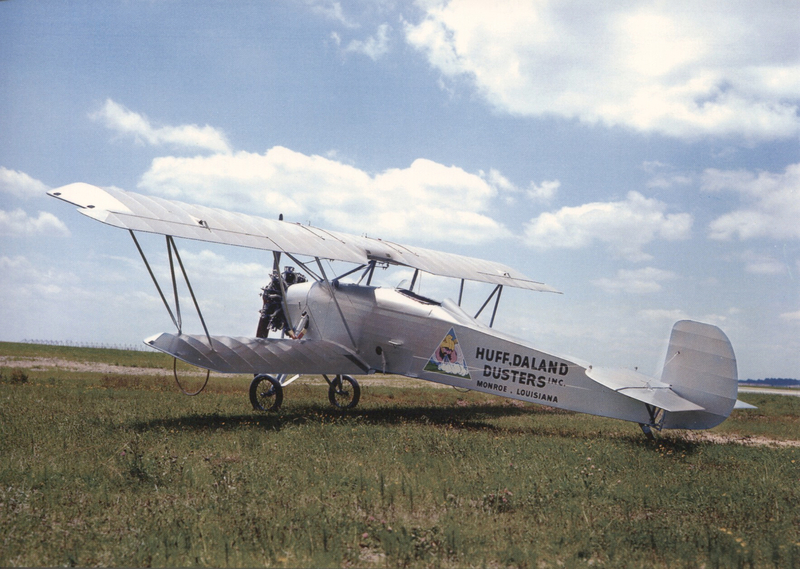 Huff-Daland Duster (Petrel 31) crop duster. Modern postcard of one of the company’s original aircraft, beautifully restored by Delta employees. Aircraft donated to the National Air and Space Museum in 1966, and on loan to the Delta Flight Museum, Atlanta, Georgia. Postcard published in 2002 by the Delta Flight Museum. In late 1928 C. E. Woolman and a group of investors in Monroe, Louisiana, acquired the assets of Huff-Daland Dusters and formed Delta Air Service. This new company continued crop-dusting and, with two newly acquired Travel Air Model S-6000-Bs, started scheduled passenger service on 17 June 1929. C. E. Woolman went on to serve Delta in leading executive positions for 38 years. Curtiss-Wright 6B Sedan, restored and painted to represent Delta’s 1929 Travel Air S-6000B, and now on exhibit at the Delta Flight Museum. 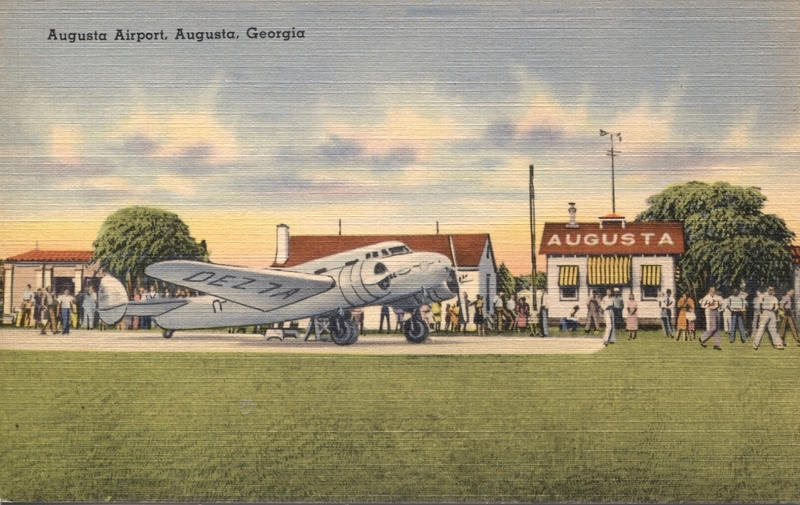 Modern postcard issued by the Delta Flight Museum. 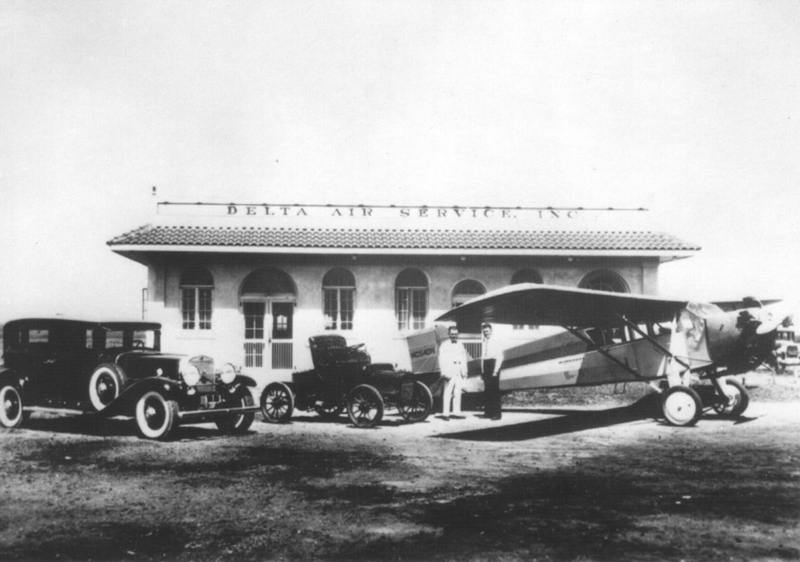 Delta’s original headquarters at Monroe, Louisiana, about 1930, with a Curtiss Robin J-1 at right. Issued by Airliners International 2015 Atlanta, photo courtesy of Delta Flight Museum, published by jjPostcards, Bassersdorf, Switzerland. From 1930 to 1934 Delta barely survived, as it could not obtain any useful airmail route from the U.S. Government in order to be profitable. However, when the mail routes were rebid in 1934, Delta managed to land new Route 24 between Dallas/Ft. Worth, Texas and Charleston, South Carolina, via Monroe, Louisiana; Birmingham, Alabama; and Atlanta and Augusta, Georgia. Initially it used Stinson aircraft on the route, but at the end of 1935 Delta acquired the first of five Lockheed 10 Electras that served as its main aircraft during the last half of the 1930s. Delta Lockheed 10 Electra at Augusta, Georgia. ‘Linen’ finish. Pub’r: John J. Miller Co., no. 67788; printed by Tichnor Bros., Boston. 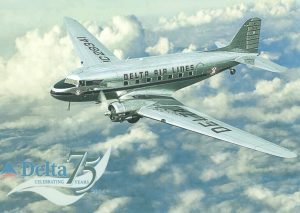 In 1940 Delta acquired Douglas DC-2 and DC-3 aircraft, starting a long close relationship with Douglas airliners, followed by DC-4s in 1946, DC-6s in 1948, and DC-7s in 1956. Delta Douglas DC-2, NC14921, its first of the type, at Atlanta, Georgia. ‘Linen’ finish. Pub’r: R. & R. News Co., Atlanta; printed by Curteich-Chicago, no. 0B-H1385, 1940. 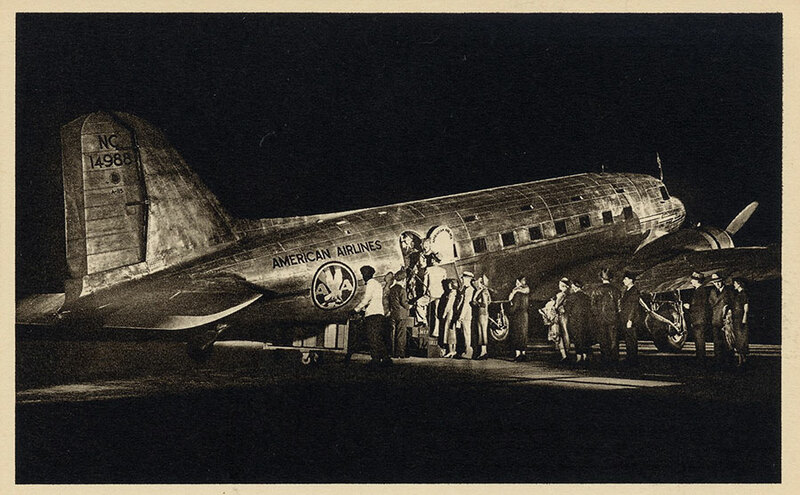 This aircraft was purchased from American Airlines and in service with Delta from February 1940 to January 1941. There are at least three varieties of this postcard, with different text on the front and back. Delta Douglas DC-3, NC28341, ‘Ship 41’. 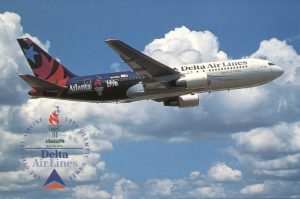 Airline Issue (‘A/I’) in 2004 to commemorate the 75th anniversary of Delta’s passenger service. Published by the Delta Flight Museum. This aircraft flew Delta’s first DC-3 passenger service, 24 December 1940, and DC-3s remained in Delta’s fleet until 1960. Ship 41 is on display at the Delta Flight Museum. 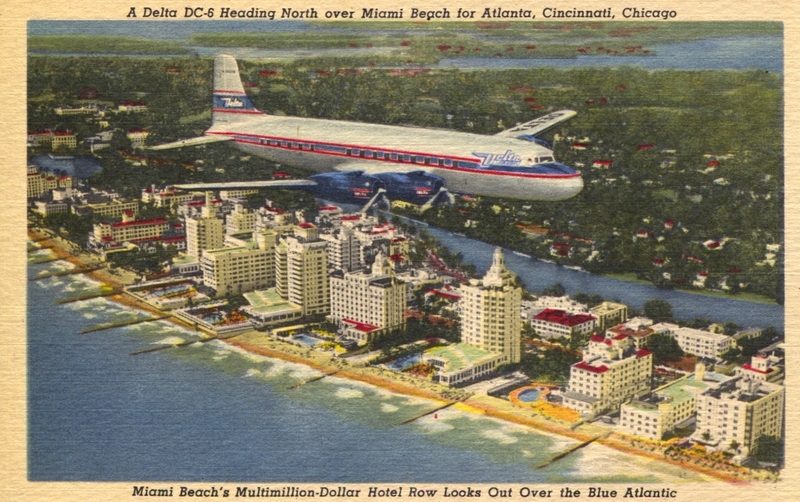 Delta Douglas DC-6 Over Miami Beach, Florida. ‘Linen’ finish postcard. Pub’r Curteich, no. 2C-N704, 1952. Delta operated DC-6s from October 1948 to December 1968. Delta-C&S Douglas DC-7, N4871C. A/I, no. T106. 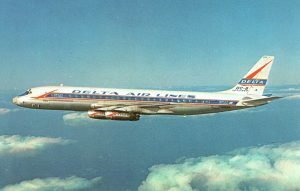 This aircraft is shown in its original delivery color scheme and was the first one delivered to Delta, in March 1954, soon after the May 1953 merger of Chicago & Southern (C&S) into Delta. The image on this card was utilized on two other Delta-issued postcards, with slight modifications. 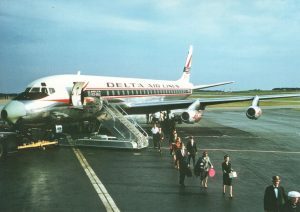 First, the card was reprinted with the tail marking changed to show a ‘Golden Crown’, reflecting an enhanced service, still with the Delta-C&S name which was retained by the airline from the time of the merger until September 1955. Then, the card was reprinted a second time with the Delta-C&S name on the front changed to “Delta” and with other stylistic livery changes. The wording on the back of each version differs. Yet all three versions carry the same airline issue number. 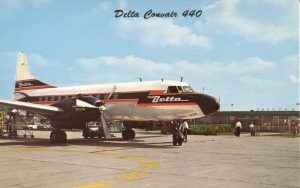 For shorter-haul routes during the 1950s, Delta modernized its fleet with Convair 340s starting in 1953 and 440s starting in 1956. 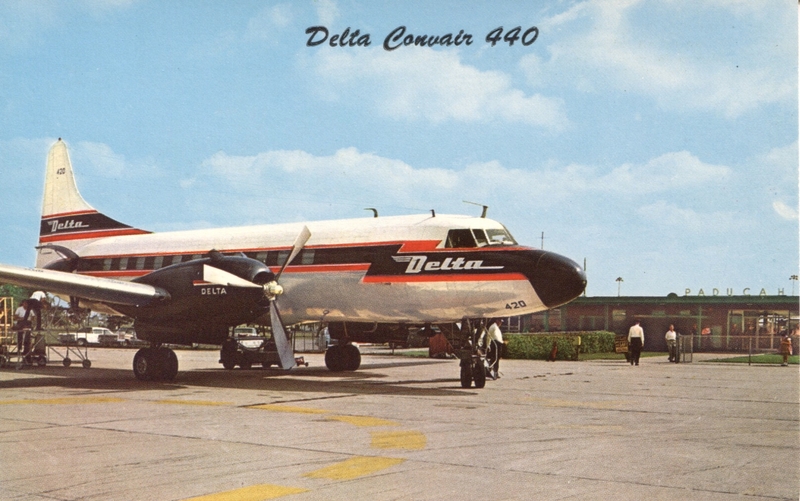 Delta Convair 440, N4820C, at Paducah, Kentucky. This aircraft was originally a model 340 acquired in 1954 that was modified to the 440 standard after 1956. Pub’r: Curteich no. 1DK-665; distributed by Wilson’s Book and Stationery, Paducah, 1961. In 1957 Delta acquired five Curtiss C-46s from Civil Air Transport of Taiwan for air freight services. These aircraft served until about 1967. Delta Curtiss C-46 ‘Air Freighter’, N9884F. A/I, probably 1957. Oversize card. Peter Fu Collection. 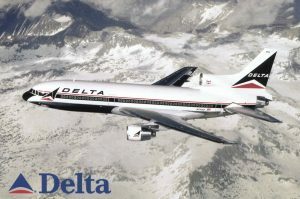 Delta joined the jet age on 18 September 1959 by launching the first scheduled service of the Douglas DC-8 pure jet (New York to Atlanta route). 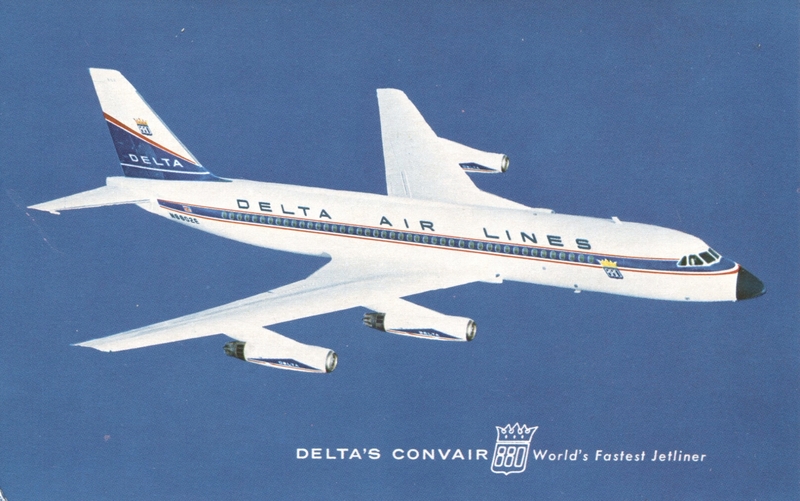 Just eight months later, Delta became the first to launch service of the Convair 880. For short-haul routes, Delta introduced the DC-9 in 1965. 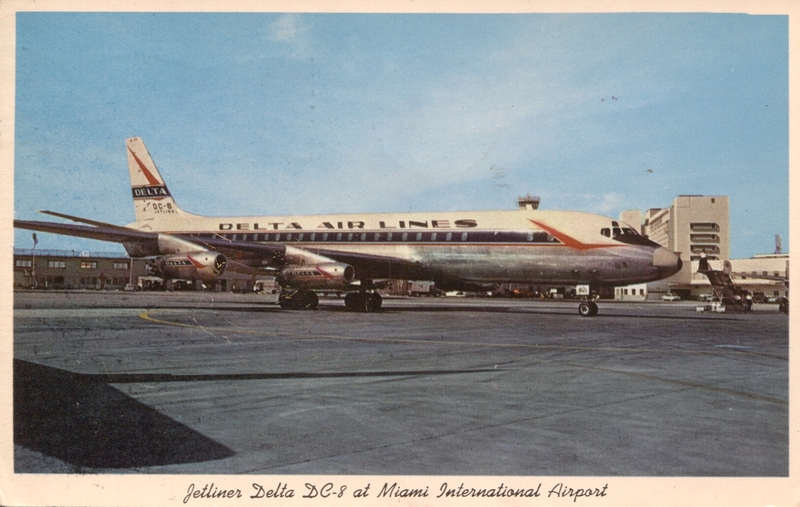 DC-8-11, N804E, at Miami. This was one of Delta’s first DC-8s, received in October 1959. 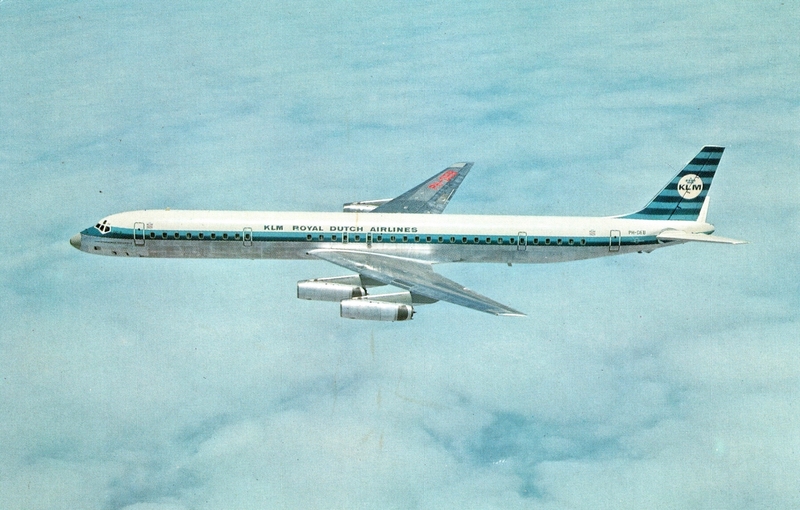 It was subsequently upgraded to a DC-8-12 and then DC-8-51 standard. Pub’r: Curteich no. 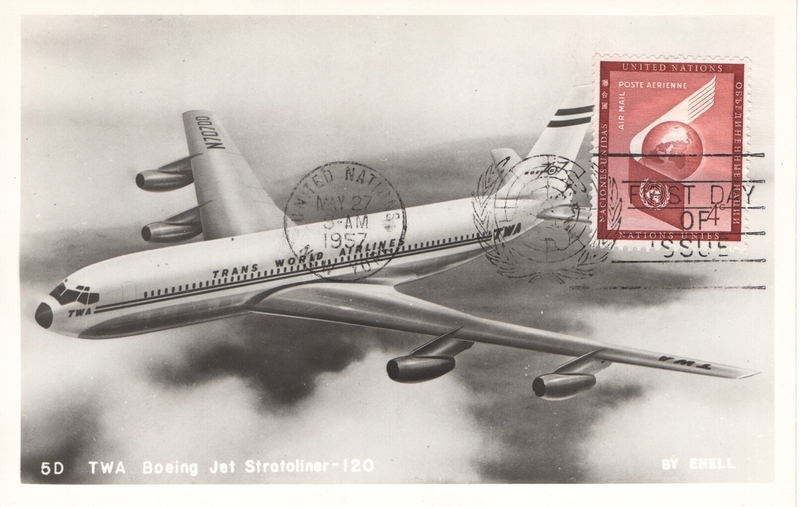 G.519; distributed by Gulf Stream Card, Miami. My card is postmarked 15 November 1961. Convair 880, N8802E, Delta’s second 880, received February 1960. Delta initially called the 880 the “Aristocrat of Jets”, as stated on the reverse of this card and emphasized by the crown over the 880 on the front. A/I, no. T-315, also with an apparent Curteich number 0DK-606 indicating a 1960 issue date. This card was later reprinted by Delta (bearing the same postcard numbers) with the text on the front removed and different text on the reverse. The ‘Aristocrat’ wording was dropped and, in a preview of things to come, the number of passengers noted was increased from 84 to 92. Douglas DC-9-14, N3303L. 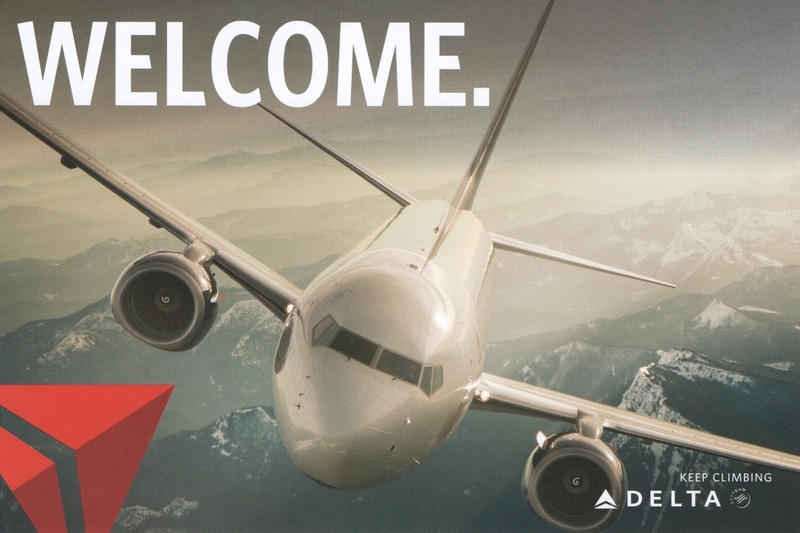 This is an unusual ‘pop-up’ postcard issued by Delta. When opened up, the inside has an interior view on the left and a ‘pop-up’ view of the DC-9 with a sky background, giving a 3-D effect. The 1970s saw the introduction of several wide-body jet aircraft. Delta operated a handful of Boeing 747s and DC-10-10s in the early 1970s, but found them not the best suited for its route system. Instead it turned to the Lockheed L-1011 Tristar 1 and later the Tristar 500, operating more than 50 L-1011s. Lockheed L-1011 TriStar 500, N751DA, the first model 500 operated by Delta, introduced in 1979 particularly for long-range routes. A/I in 2000 as an historical postcard. This card shows the classic Delta ‘widget’ livery in use on Delta aircraft from 1962 to 1997. Hartsfield International Airport in Atlanta, Georgia has served as Delta’s main hub for several decades. The dominance of Delta at this airport is amazing. 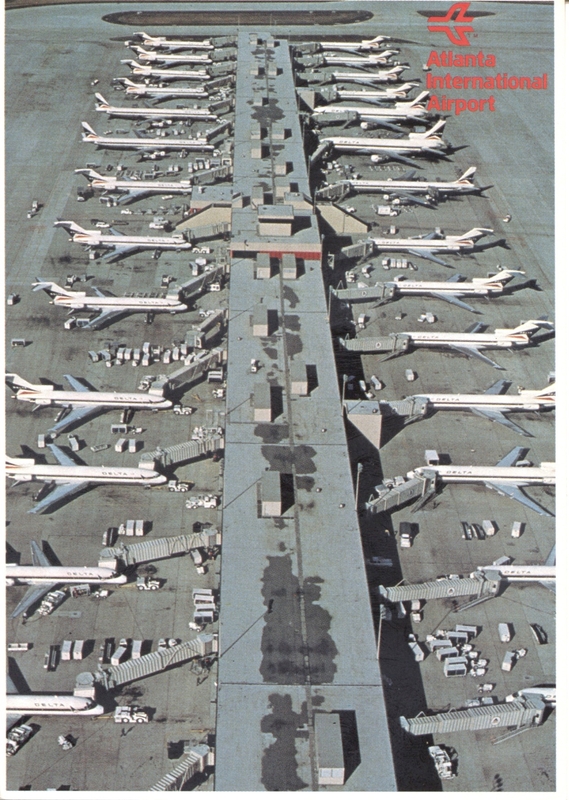 Just like today, the following airport scene in the 1980s featured row after row of Delta aircraft. Delta aircraft, including Boeing 727s, L-1011s and DC-8s, taking on passengers at multiple rows of gates, Hartsfield-Jackson Atlanta International Airport, Atlanta, Georgia. Pub’r: Thomas Warren Enterprises, Atlanta, nos. 561109 and A-153. Delta Boeing 767-200, N102DA, its first 767, with a special livery symbolizing Delta’s role as the Official Airline of the 1996 Olympic Games in Atlanta. A/I, no. P98303. There is another variation of this card, A/I no. P97977, with the aircraft closer up and lower, and with the Delta Olympic logo smaller. 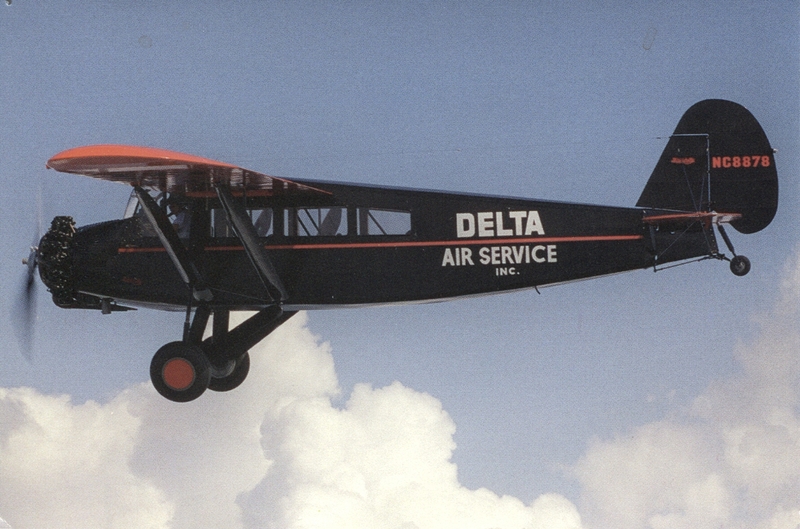 Named ‘The Spirit of Delta’, the funds to acquire this aircraft were raised by Delta’s employees through payroll deductions. The aircraft is now on display at the Delta Flight Museum, as seen in the next postcard image. Delta Boeing 777-200, with Delta’s ‘Colors in Motion’ tail livery (also called ‘Flowing Fabric’), its main tail livery from 2000 to 2007. Delta introduced the 777 in May 1995. A/I, 2000. Delta Boeing 757-200, N717TW, in SkyTeam logo, at LAX, 19 January 2009. Duane Young photo. Issued by Airliners International 2014 LAX. Pub’r jj Postcards. 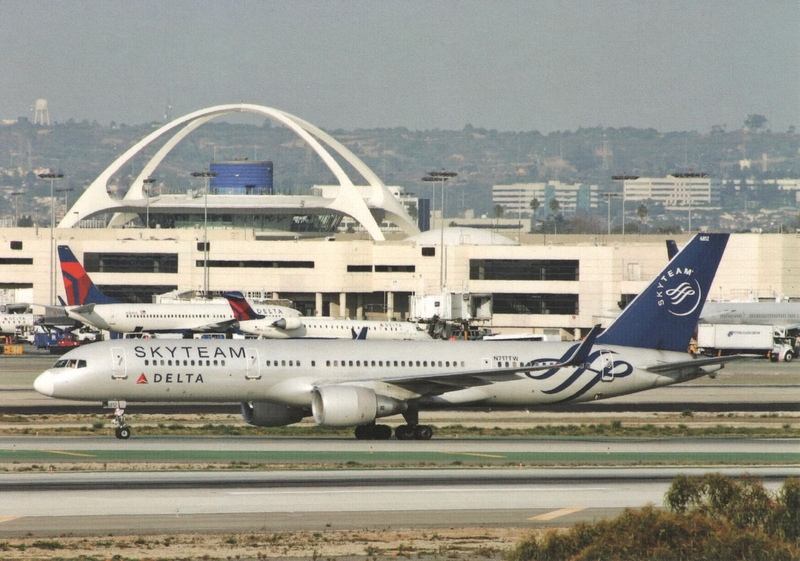 Delta is a founding member of the SkyTeam airline alliance. Delta Airbus A350-900, N502DN, in Delta’s ‘Onward and Upward’ livery adopted 30 April 2007 and still current. This livery re-introduced the Delta ‘widget’ logo, in updated form. It took four years to complete the livery changeover on all its aircraft. 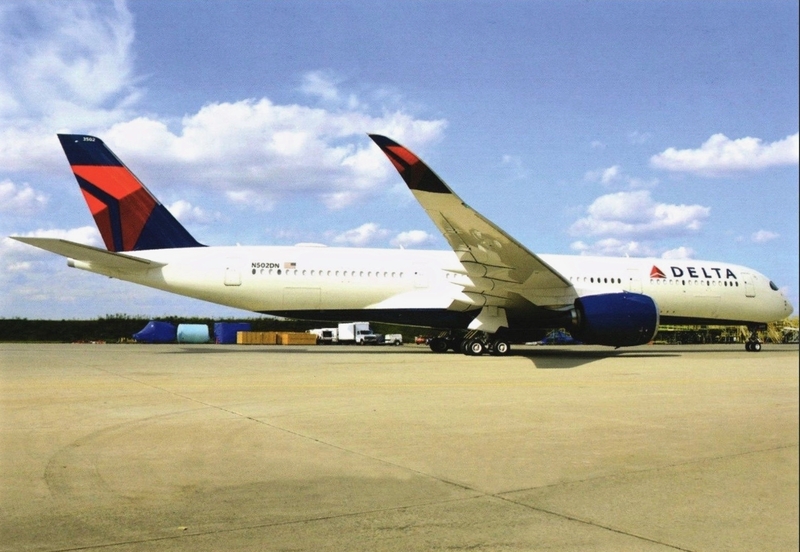 The A350 is the latest addition to Delta’s fleet. Pub’r Flying Photos Magazine. Photo by Agustin Anaya, Atlanta. 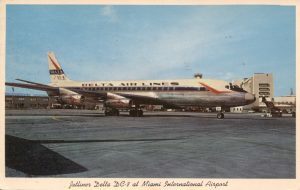 Turning to more significant airlines that merged into the Delta system over the years, I have selected one or two postcards of each, generally showing an aircraft and color scheme in use at the time of the acquisition concerned. Let’s start with the first major acquisition by Delta — Chicago & Southern Air Lines on 1 May 1953. 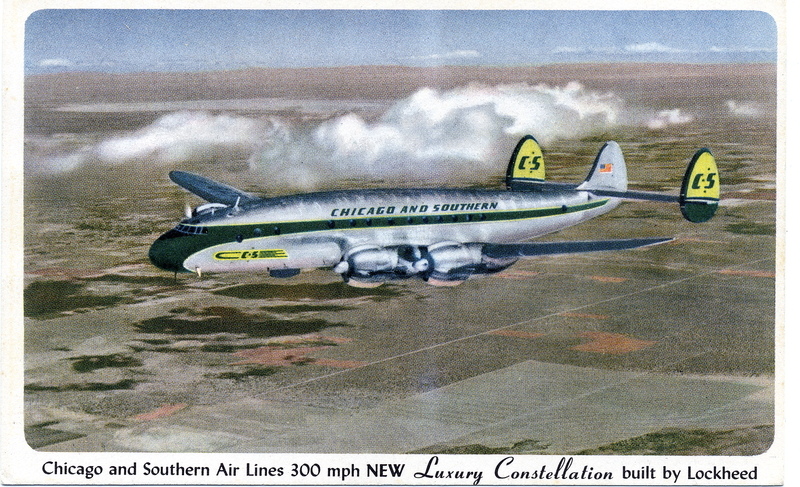 Chicago & Southern Lockheed Constellation 749. A/I, Nov. 1951. This aircraft type became a Delta-C&S aircraft upon the 1953 merger of C&S into Delta. Delta’s next acquisition was Northeast Airlines (known as Boston-Maine Airways prior to 19 November 1940). This acquisition occurred on 1 August 1972. 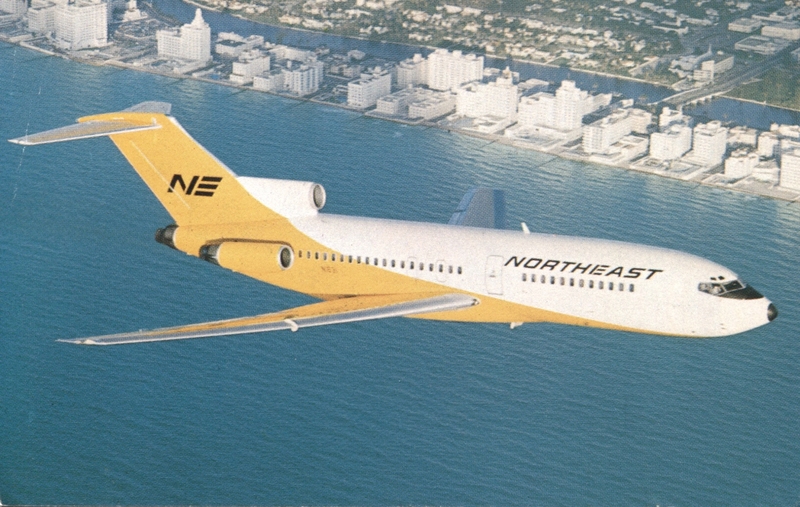 Northeast 727-95 in the famous ‘Yellowbird’ livery introduced in 1966, over the Miami Beach ‘Gold Coast’, Florida. A/I, 1966. In 1967 Northeast started to acquire the larger Boeing 727-200, and on 14 December 1967 it operated the first scheduled flight of that type, in ‘Yellowbird’ livery from Miami to New York (Kennedy). Northeast’s 727s were all taken over by Delta upon their 1972 merger. In December 1986 Delta acquired Western Air Lines, their operations being merged on 1 April 1987. 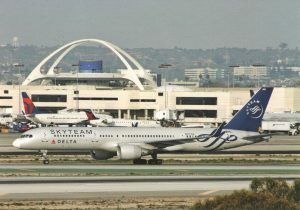 This added numerous western U.S. routes to Delta’s system and made it the fourth largest airline in the U.S. at the time. 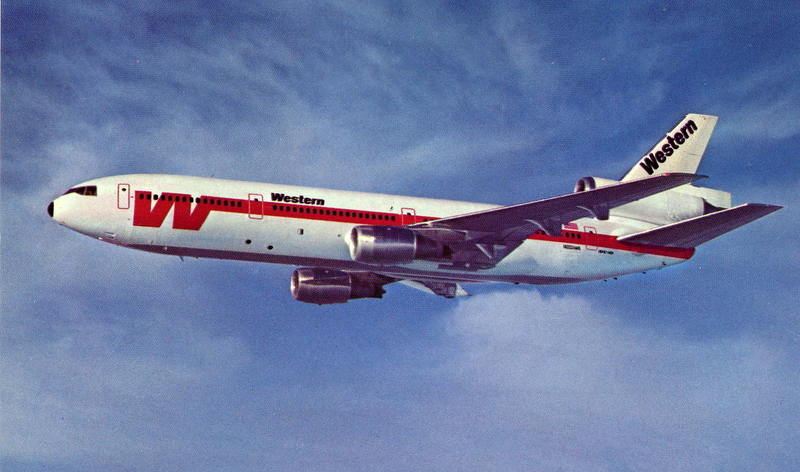 Western Air Lines McDonnell Douglas DC-10-10, referred to by Western as the ‘Magnificent Queen of Western’s jet fleet’ and the ‘DC-10 Spaceship’. A/I. There are two versions of this card, with different text on the reverse and a different destinations list. 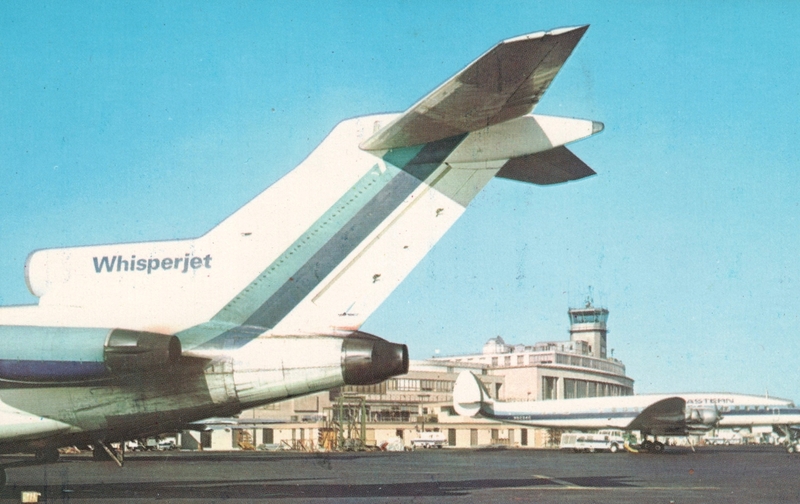 Western operated this type from 1973 until its 1987 merger with Delta. Pacific Northern Airlines Boeing 720, taking off from Seattle-Tacoma International Airport. A/I, no. P42365, issued late 1961 or early 1962. Artist card. 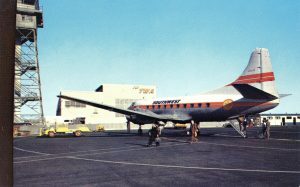 Originally founded as Woodley Airways, the airline adopted the Pacific Northern name in 1945 and, in 1967, it merged into Western Air Lines which later merged into Delta. On 1 October 2009 Delta made its largest acquisition ever — Northwest Airlines. This resulted in Delta becoming, by some measures, the largest airline in the world. Northwest itself had absorbed several other airlines over the years. Here are some postcard examples of more significant ones, funneling into Northwest and then ultimately into Delta. 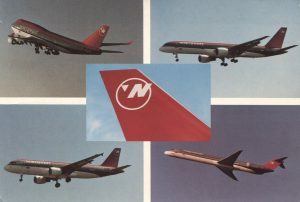 Northwest Airlines four-view postcard showing a Boeing 747-400 and 757, Airbus A320, and MD-80 in the color scheme featuring a logo on the tail having an ‘N’ and circle with a triangle pointing northwest. Probably an A/I, no. 23285-E. Postmarked 8 January 1994. Northwest merged into Delta on 1 October 2009. 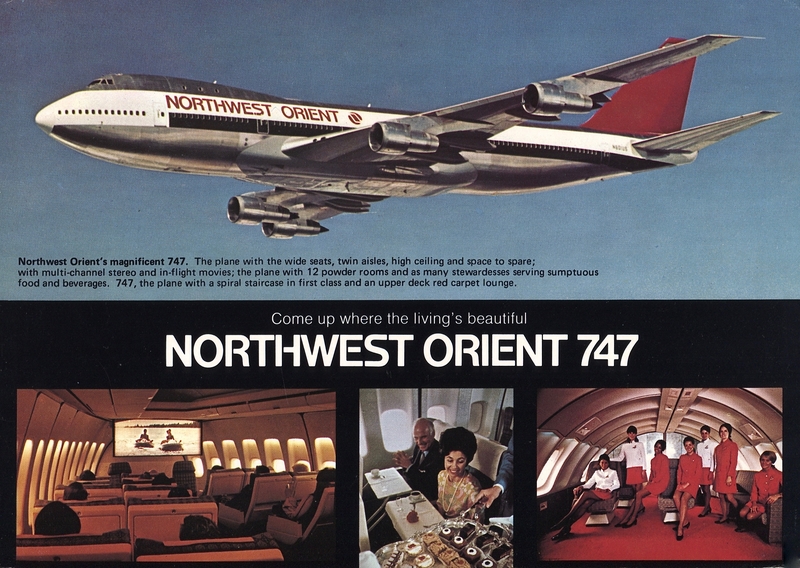 Northwest Orient Airlines 747-100 tri-view card also showing two interior scenes. A/I, about 1970. Oversize, 6 x 8.5” (15.2 x 21.5cm.). 747 timetable on portion of back. 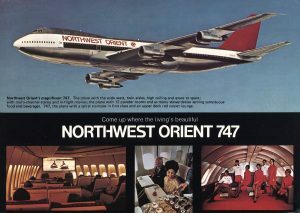 Northwest dropped ‘Orient’ from its brand name upon its 1986 acquisition of Republic. Republic Airlines Boeing 727-200, N715RC. A/I, no. 0-04 10-3-1186. Oversize, 3.75 x 8.5” (9.5 x 21.7cm.). 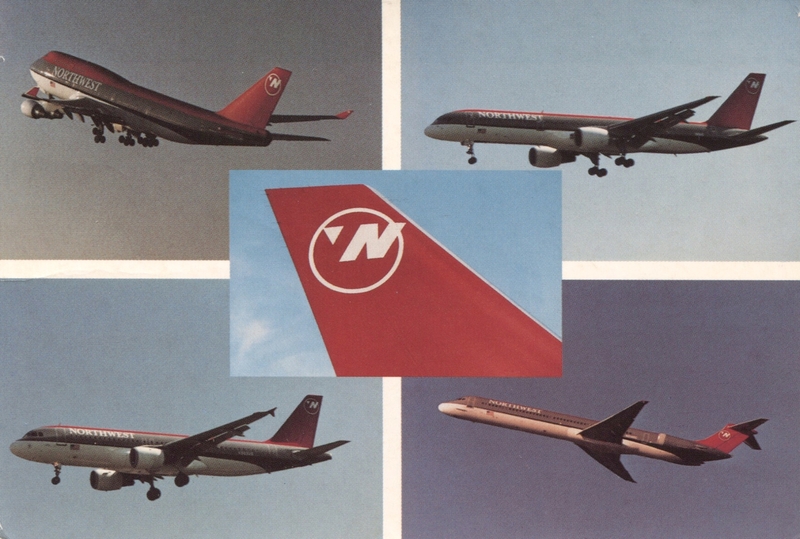 Republic merged into Northwest Airlines on 1 October 1986. 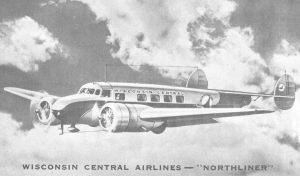 Wisconsin Central Airlines Lockheed Electra L-10A. A/I. Wisconsin Central started operating L-10As on 25 February 1948, and this postcard probably dates from that year. 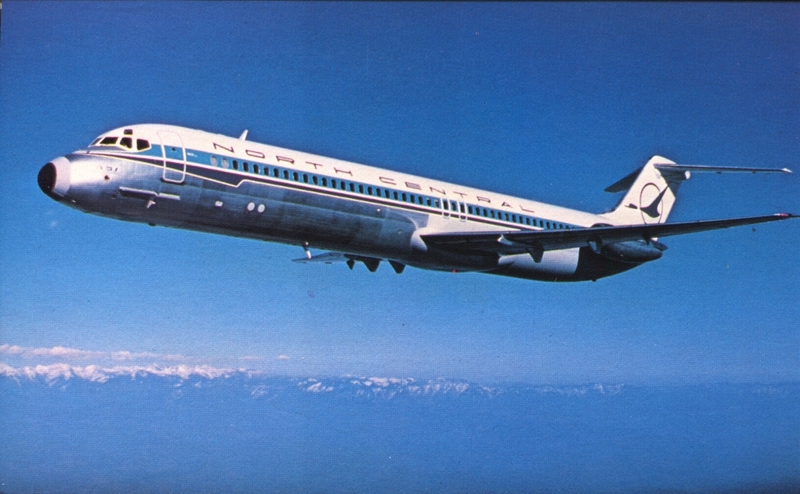 North Central Airlines Douglas DC-9. A/I, printed by Cartwheel, Afton, Minnesota, no. 121383, issued about 1977. A variant of this card has North Central’s Philadelphia office phone numbers on the reverse. North Central was known as Wisconsin Central from 1944 to 15 December 1952. On 13 July 1979 North Central merged with Southern Airways to form Republic Airlines. Southern Airways DC-9-31, N908H. A/I. Oversize, 4 x 7” (10.2 x 17.7cm). Southern merged with North Central Airlines on 13 July 1979 to form Republic Airlines. Republic Airlines acquired Hughes Airwest (previously known as Air West) on 1 October 1980. Air West in turn was a combination of three airlines. 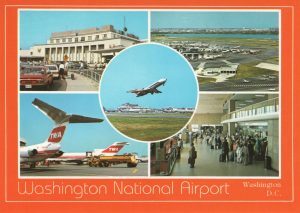 Here is a selection of postcards from this group of airlines that eventually, through Northwest, melded into Delta. Hughes Airwest DC-9-15, N9349, at Reno, Nevada. ‘Stippled’ edges. Pub’r: Smith Novelty, Carson City, Nevada; printed by Colourpicture, Boston, no. P305136. Air West DC-9-31, N9344. ‘Stippled’ edges. Pub’r: Ellis Post Card Co., Arlington, Washington, no. 116593. 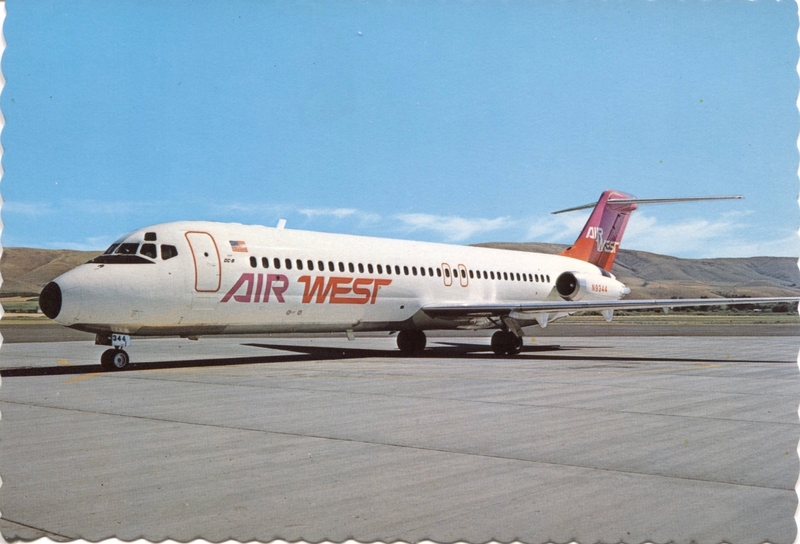 Air West was formed on 17 April 1968 as a combination of three airlines — West Coast, Bonanza, and Pacific. It was renamed ‘Hughes Airwest’ in July 1970. This aircraft went on to serve in the colors of Hughes Airwest, Republic and Northwest. 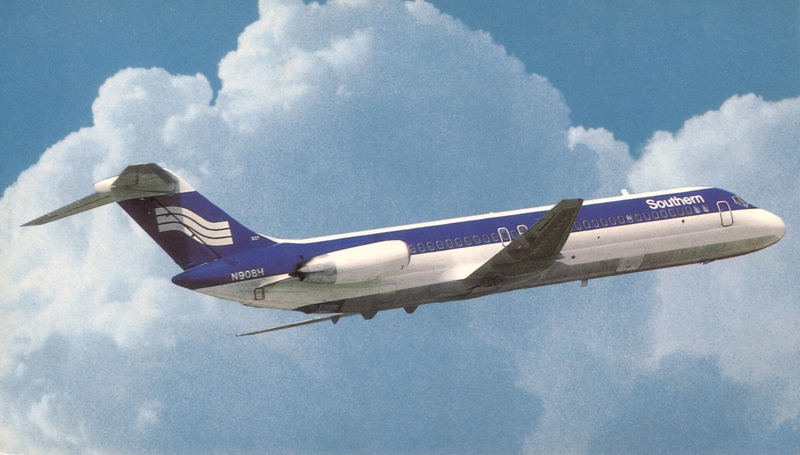 West Coast Airlines DC-9. 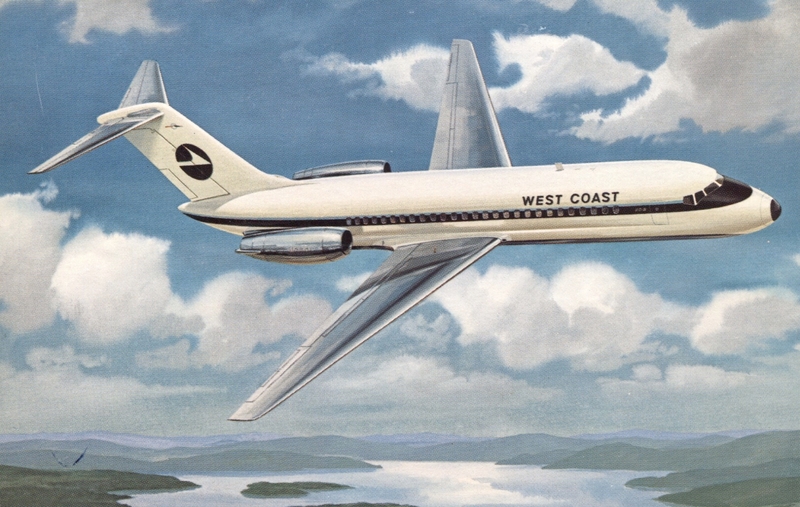 A/I, probably in 1966 when West Coast first acquired DC-9s. Artist postcard. 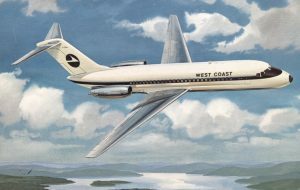 West Coast was founded on 5 December 1946 and became a significant regional airline in the Pacific Northwest. Bonanza Air Lines Fairchild F-27A ‘Silver Dart’, N149L, over Hoover Dam, Nevada. A/I. Oversize, 4 x 8.5” (10.1 x 21.5cm.). 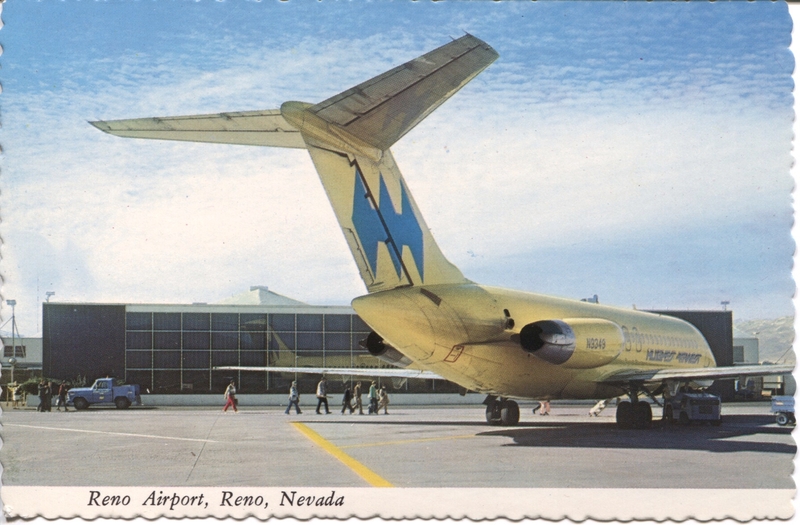 This card was issued attached to another Bonanza postcard showing a DC-9. Bonanza was founded 5 August 1946 and served major cities in Arizona, California, Nevada and Utah. 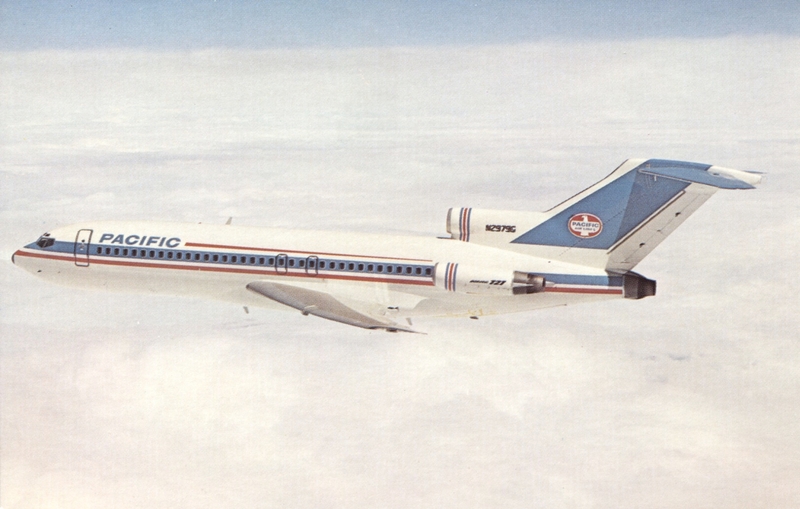 Pacific Air Lines Boeing 727-100, N2979G. Pub’r: Aviation World, nos. B-025, 77842-D. Pacific was founded in 1941 under the original name of Southwest Airways, the name being changed to Pacific on 6 March 1958. It was mainly a feeder airline serving southwestern U.S. cities. Southwest Airways Martin 2-0-2, N93049, at Los Angeles International Airport, probably between 1952 and 1958. Published as an airport card by H. S. Crocker Co., Los Angeles, no. LA-1098; distributed by Souvenir Color Card Co. Southwest Airways was formed in 1941. To summarize how the world of airline mergers remarkably led Southwest Airways into the Delta family, (a) Southwest’s name was changed to Pacific Air Lines in 1958; (b) Pacific combined with West Coast and Bonanza to form Air West in 1968; (c) Air West’s name changed to Hughes Airwest in 1970; (d) Hughes Airwest merged into Republic (formed by the 1978 combination of North Central and Southern) in 1980; (e) Republic merged into Northwest in 1986; and (f) Northwest merged into Delta in 2009. Quite a voyage! Lastly, at various times between 1984 and 2012 Delta owned some regional airlines and operated them as ‘Delta Connection’ carriers. These included Atlantic Southeast Airlines, Ransome, Comair and Mesaba/Northwest Airlink. Today, Delta’s policy is to operate ‘Delta Connection’ services utilizing aircraft owned by other companies. Atlantic Southeast Airlines (ASA) ‘Delta Connection’ ATR-72-210. A/I, 2002. ASA was founded in 1979 and became a Delta Connection carrier in 1984. 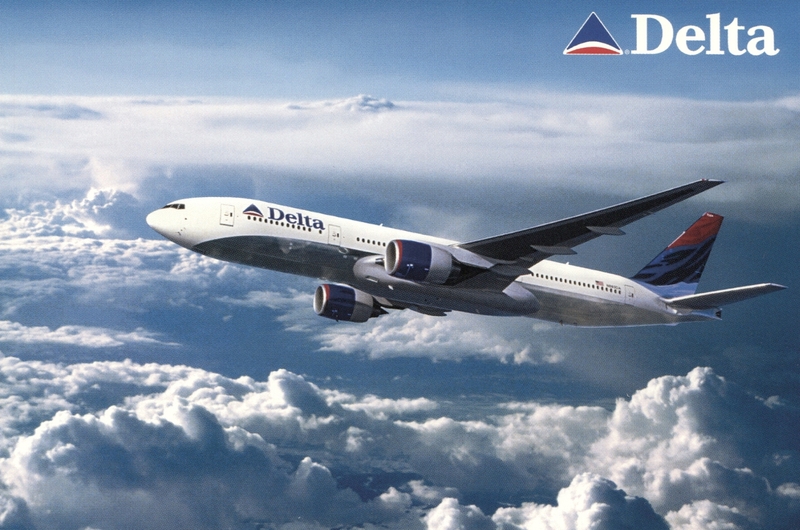 From 1999 to 2005 it was wholly-owned by Delta. 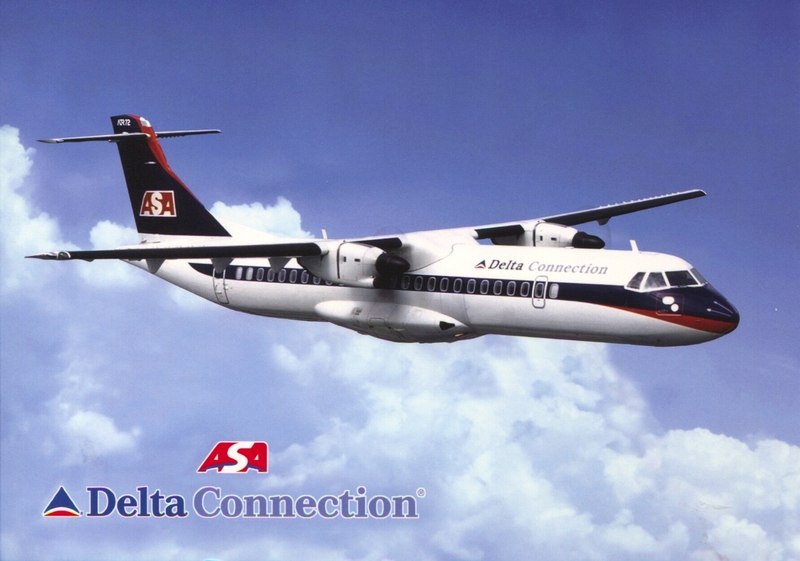 In 2011 ASA merged with ExpressJet, and ExpressJet is now one of the ‘Delta Connection’ carriers. ASA operated ATR-72 turboprops from 1993 to 2008. Notes: The original postcards of those shown are published, except as noted, in standard or continental size. All postcards shown are from the author’s collection, except the Delta C-46 card. I estimate their rarity as — Rare: the Delta L-10 and C-46 cards, Wisconsin Central L-10A and Southwest Airways at LAX cards; Uncommon: the Delta DC-6, Convair 440, DC-8, Convair 880, and DC-9 ‘pop-up’; C&S Constellation; Northeast 727, Boston-Maine L-10; Pacific Northern 720; Northwest 4-view and 3-view cards; Hughes Airwest DC-9; and West Coast DC-9 cards. The rest are fairly common. This article is a revision and update of a similar article by the author published in The Captain’s Log of the World Airline Historical Society, Fall 2012 issue. (a) “Delta: An Airline and Its Aircraft — The Illustrated History of a Major U.S. Airline and the People Who Made It”, Paladwr Press (1990). (b) “Airlines of the United States since 1914”, Smithsonian Institution Press (1972). (c) “A History of Airlines in the Jet Age”, Smithsonian National Air and Space Museum (2011). Delta Flight Museum Website – deltamuseum.org. Cearley, George W. (author and publisher), ‘The Delta Family History’, 160 pages (1985). 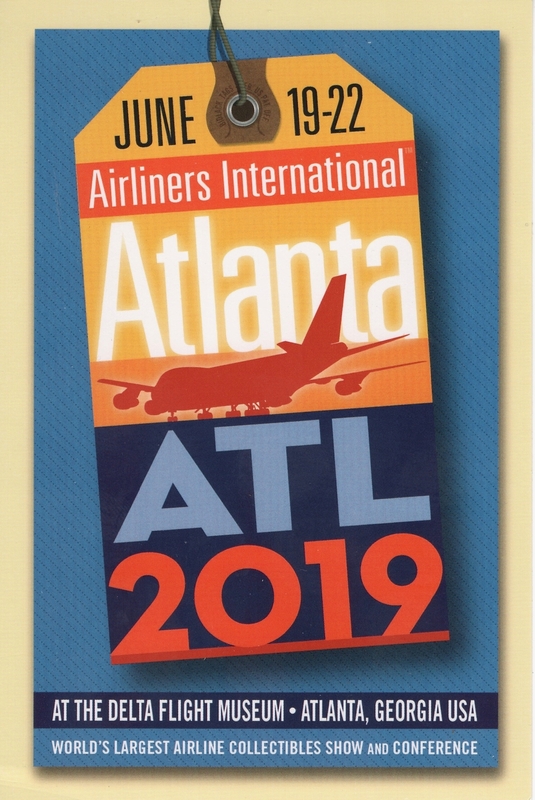 The annual Airliners International show and convention will be held in 2019 during 19-22 June at the Delta Flight Museum located at Hartsfield-Jackson Atlanta International Airport. 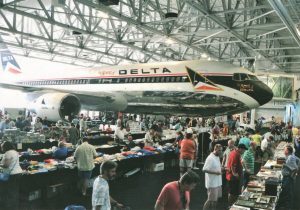 Here is a postcard showing the collecting scene at the previous (2015) Airliners International show in the Delta Flight Museum, with the Delta Boeing 767 ‘The Spirit of Delta’ right inside the show venue. Airliners International 2015 Atlanta convention in the Delta Flight Museum. Postcard issued by Airliners International 2015 and 2016. Pub’r jjPostcards. 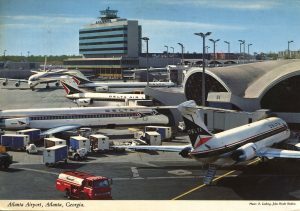 I encourage all airline and airport postcard collectors who are members of the World Airline Historical Society to enter the Airliners International 2019 Postcard Contest in Atlanta, 19-22 June 2019. Postcard contest rules are on the show website, www.airlinersinternational.org. Whether you win or not, your entries stimulate others to start or expand airline memorabilia collecting, and it’s a great boost for all collectors. 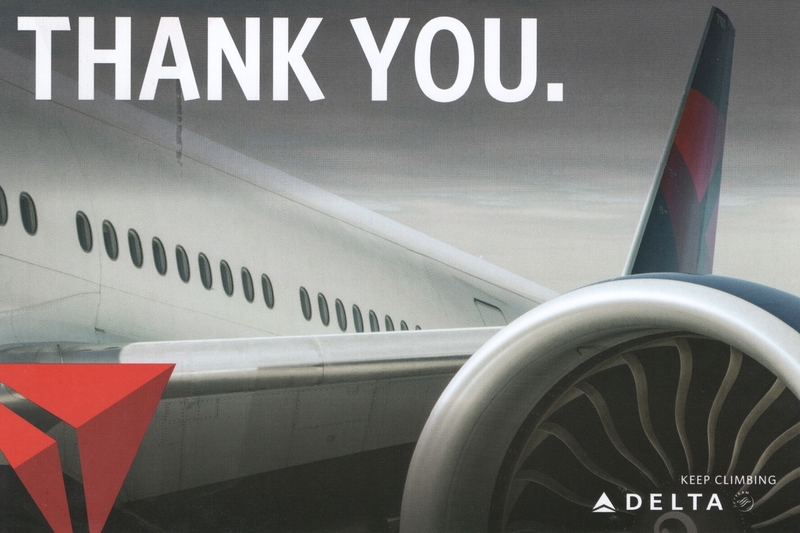 Delta Air Lines ‘Thank You’ postcard in its ‘Keep Climbing’ series, a Delta slogan introduced in 2010. Issued by the airline about 2017. There are at least seven different cards with this view, each saying ‘Thank You’ in a different language — English, Spanish, Portuguese, German, Italian, Chinese and Japanese. Until the next article, thank you for reading, and Happy Collecting. Marvin. 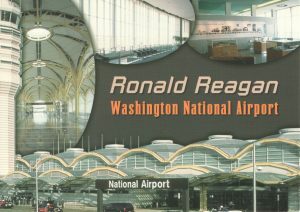 Ronald Reagan Washington National Airport (code ‘DCA’) is the closest airport to Washington, D.C. (District of Columbia), the U.S. capital. Although located only four miles (7 km.) from the heart of the capital district, the airport actually lies just across the Potomac River near the Crystal City urban neighborhood of Arlington County, Virginia. 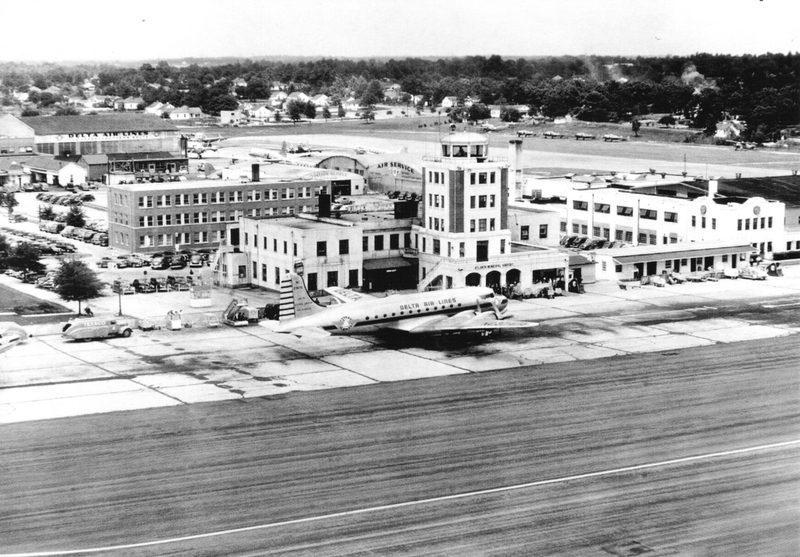 The first significant air field and terminal in the National Capital area was privately owned Hoover Field. 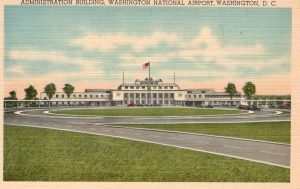 Officially opened on 16 July 1926, it was located on the Virginia side of the Potomac River just north of the present DCA, on a site now occupied by the Pentagon. 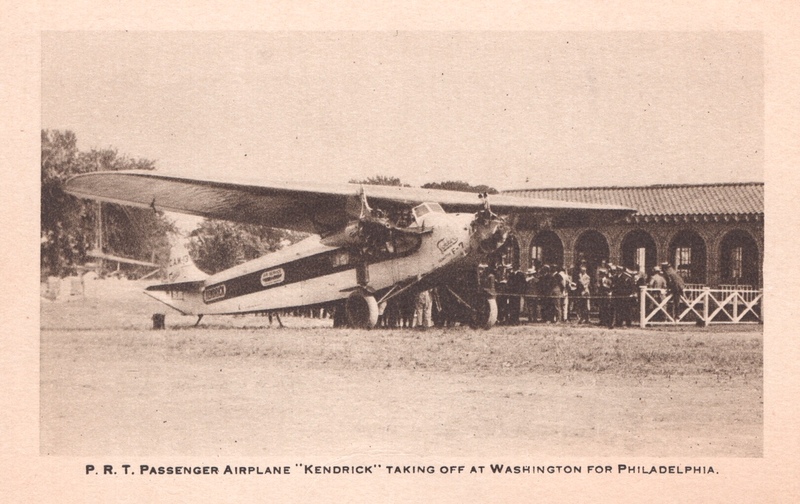 The first airline to operate there was Philadelphia Rapid Transit Air Service (‘PRT’) which started passenger and mail flights between Philadelphia and Hoover Field. Philadelphia Rapid Transit Air Service (‘PRT’) Fokker F-VIIa-3m, ‘Kendrick’, at Hoover Field, Arlington County, Virginia, serving on the Washington-Philadelphia route, July-November 1926. Airline Issue. 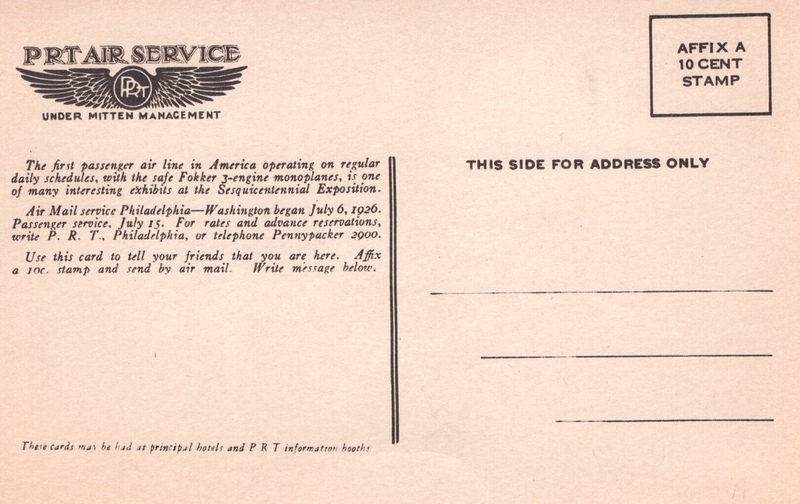 Back of preceding Philadelphia Rapid Transit Air Service postcard. The route from Hoover Field to Philadelphia proved uneconomical for the Philadelphia Rapid Transit airline. Also, the field itself was not well suited for airline operations. So PRT pulled out of Hoover Field after five months. Potomac Flying Service then started operating at Hoover Field, but with only mixed success. Just one year later, In 1927, a competing private field called ‘Washington Airport’ opened adjacent to Hoover Field. 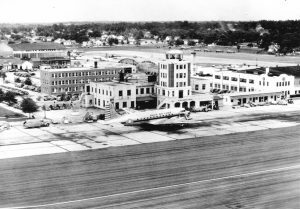 However, faced with small sites that were often flooded, flight path obstacles, and financial difficulties, the two fields merged in September 1930 to form ‘Washington-Hoover Airport’. 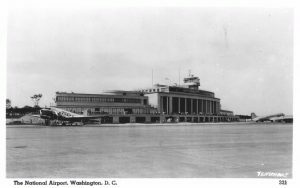 This did not sufficiently help the situation, as the combined site was still not worthy of serving as the principal airport for the Nation’s capital city. Postcard issued in late 1928 or early 1929 showing ‘Washington Airport’ (later part of ‘Washington-Hoover Airport’) within the upper left circle on the far side of the Potomac River. 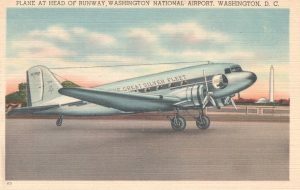 The card advertises scenic flights over Washington operated by a Ryan Brougham aircraft and was probably issued by the owner-operator of those flights, Herbert Fahy who was a co-founder of ‘Washington Airport’. 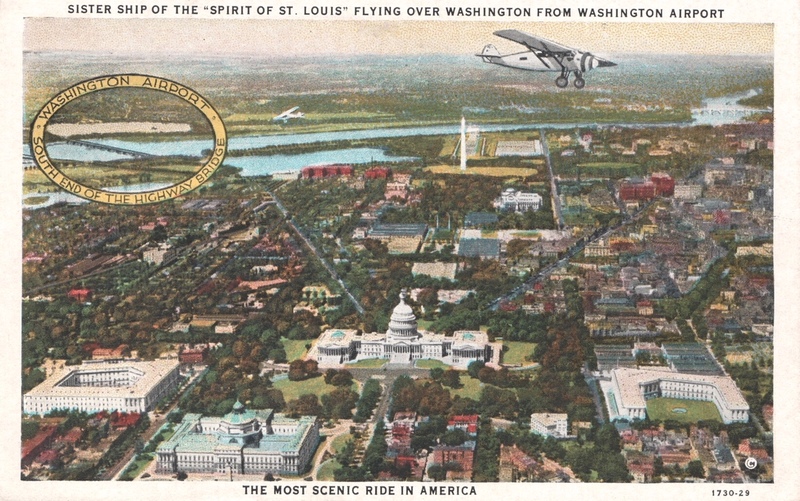 There are three versions of this card: two have a “Safety 1928’ ‘United States Air Transport’ insignia on the back (with the front of one version being less colorized), and the back of the third has a message promoting the scenic flights. 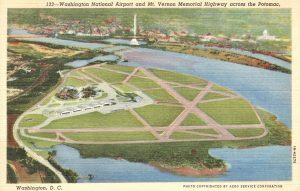 Following the failure of Congress to agree on a new site for the development of a suitable airport for the national capital, in fall 1938 President Franklin D. Roosevelt selected a site for a totally new U.S. government-owned airport to be built just south of Washington-Hoover Airport on mudflats at Gravelly Point, by the Potomac River. Construction involved a tremendous amount of earth moving, reclaiming land from the marshes and river. 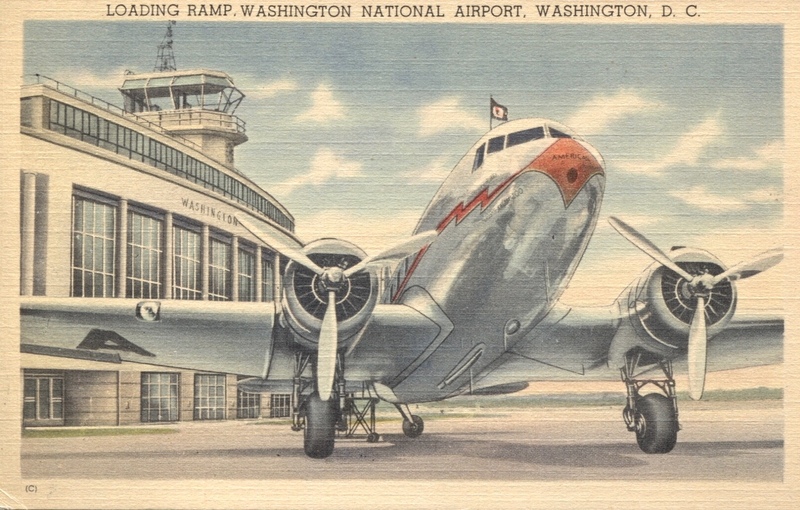 The new airport, named ‘Washington National Airport’, opened for commercial flights on 16 June 1941. It was considered one of the finest of its day, with innovations in building design, plane handling, air and field traffic control, lighting, and facilities for public convenience. 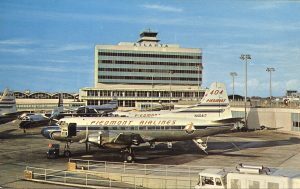 The first three airlines to operate there were American Airlines, Eastern Air Lines, and Pennsylvania Central Airlines (‘PCA’). 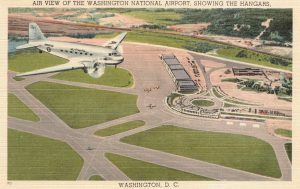 During the first few years of the new airport, a legal controversy existed as to whether the airport was in fact located in Virginia or was part of the federal District of Columbia. In 1945 Congress passed a law stating the airport site was indeed in Virginia, but that the airport was under exclusive federal jurisdiction. Aerial view of new Washington National Airport showing its four runways, Curteich no. 1B-H2275; 1941, the year of its inauguration. The deactivated Washington-Hoover Airport field can be seen at the empty land just northwest of the new airport. 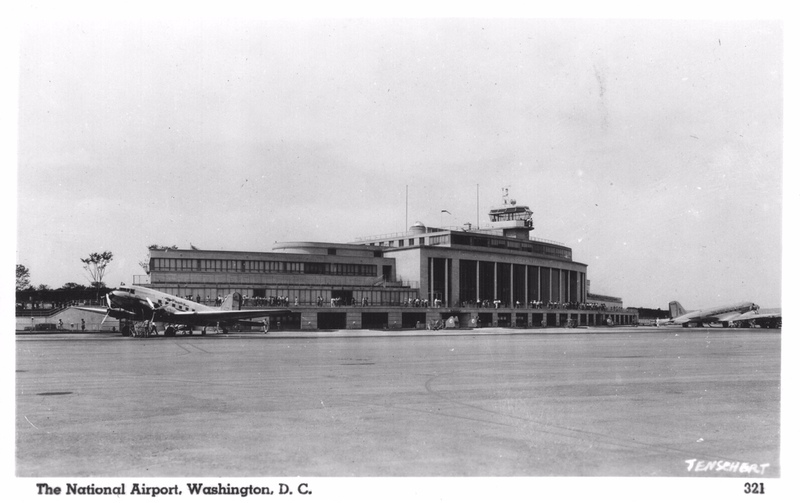 The terminal and administration building of Washington National Airport, early 1940s. Real photo postcard by Tenschert, no. 321. An American Airlines Douglas DC-3 is at left, and an Eastern Air Lines DC-3 at right. 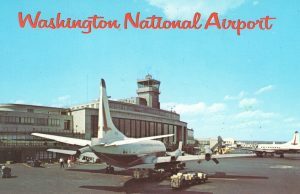 After Washington National Airport opened, a nice set of 18 different colorized ‘linen’ finish postcards about the airport was published, likely between 1942 and 1945, by Capitol Souvenir Company (‘Capsco’) of Washington D.C., along with a souvenir folder of non-postcard photos of those 18 views. So-called ‘linen’ postcards derived their name from the surface pattern of the card that resembled the crosshatched surface of linen fabric. They were popular mainly from 1930 to 1945, at which time postcards with a ‘chrome’ finish and more realistic photos became the dominant form of postcard. Here are nine of those Capsco ‘linen’ postcards selected from the set. 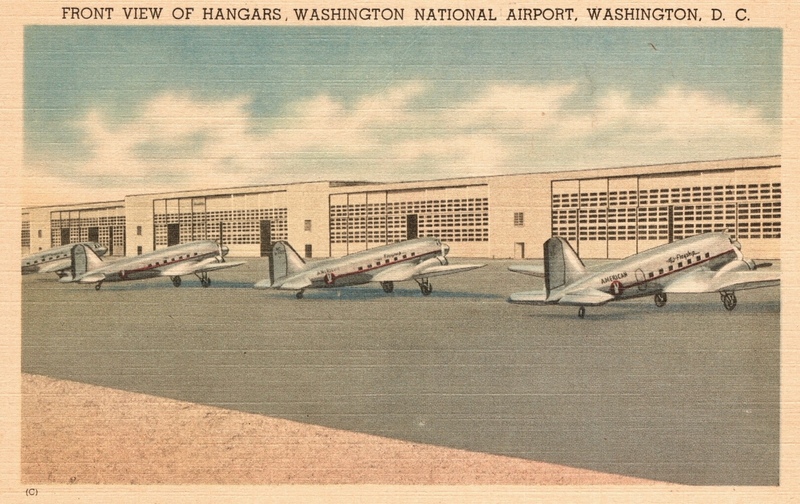 The first hangar built at Washington National Airport. In front are Douglas DC-3s of the first three airlines serving the airport — American, Eastern and Pennsylvania Central. 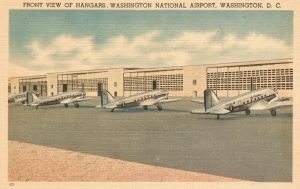 American DC-3s in front of the row of more modern hangars built at Washington National Airport soon after its opening. American Airlines DC-3 on the ramp with the administration/terminal building in the background. Eastern Air Lines DC-3, with Jefferson Memorial and Washington Monument seen across the Potomac River. 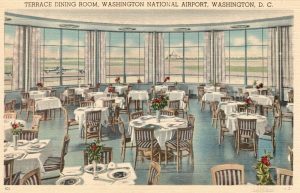 From the dining room and through the panoramic glass of the terminal waiting room, passengers could look out towards the aircraft activity and also see, as here, the Washington Monument and U.S. Capitol building on the other side of the Potomac River. Several ‘chrome’ finish postcards depict the original Washington National Airport (which had added in 1950 an extension to the main terminal at its south end). 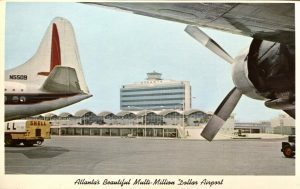 Here is a selection of five postcards that show aircraft on the ramp with the administration/terminal building in the background. 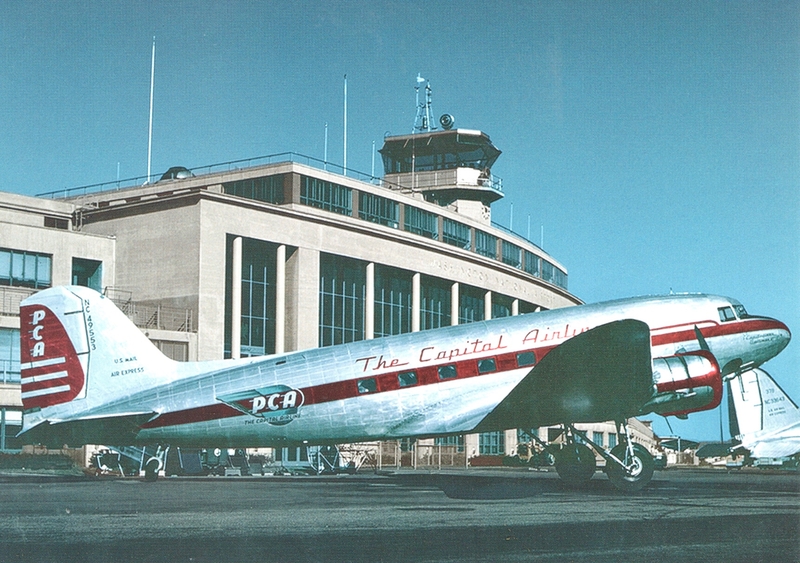 Pennsylvania Central Airlines (‘PCA’) Douglas DC-3, NC49553, at Washington National Airport between 1945 and 1948, issued for Airliners International 2006 Washington. Pub’r j.j.postcards, Bassersdorf, Switzerland. This aircraft joined PCA’s fleet in March 1945, and PCA changed its name to Capital Airlines in April 1948. Eastern Air Lines Lockheed Constellations at Washington National Airport. Dexter Press no. 51413, Pub’r Racon Wholesale, Washington D.C. Eastern was a large operator of Constellations, with 79 of different types serving during the period 1945 to 1968. On 30 April 1961 Eastern inaugurated its iconic ‘Air-Shuttle’ service between Washington National and New York-LaGuardia and Boston-Logan, with L1049 Constellation aircraft. Capital Airlines Vickers Viscount turboprop at Washington Airport. Airline issue. 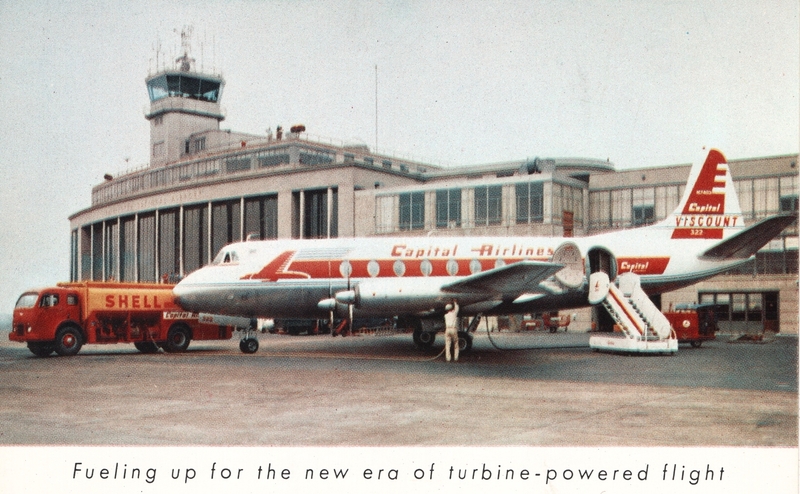 In 1955 Capital became the first U.S. operator of the Viscount. Eastern Air Lines Lockheed 188 Electra at Washington National Airport. Pub’r Capsco, Washington D.C., no. P61914. Eastern started adding Electra turboprops to its fleet in late 1958, and introduced them on its Air-Shuttle service in 1965. 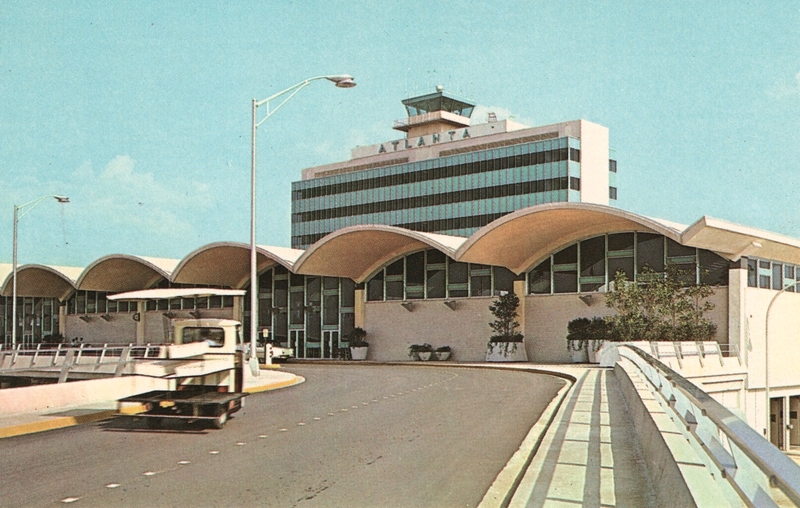 Also in 1958 the airport’s infrastructure expanded with the opening of its ‘North Terminal’. Eastern Air Lines Boeing 727 and Lockheed Constellation at Washington National Airport. Pub’r: Capsco, no. P72871. 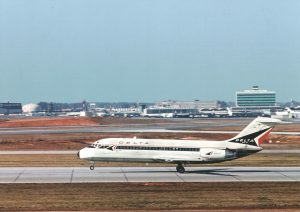 Eastern was the launch airline for the 727 and placed it in service on the Philadelphia-Washington-Miami route on 1 February 1964. 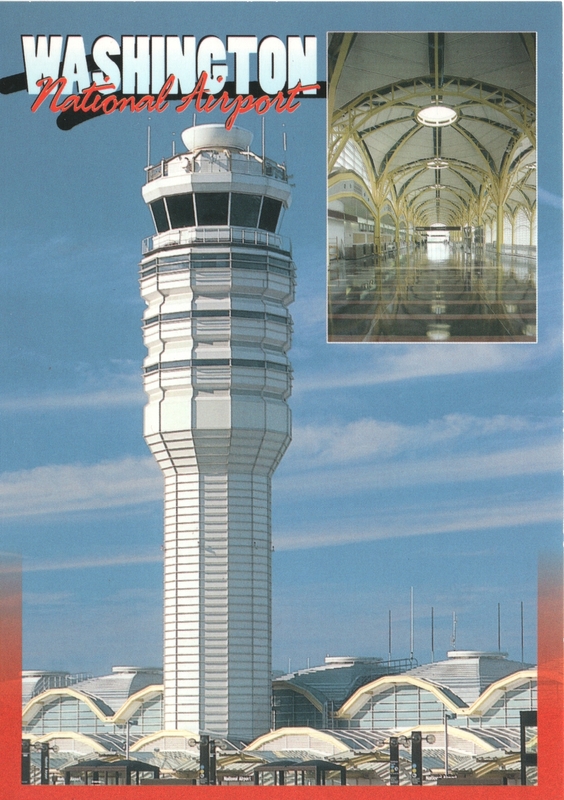 Washington National Airport (‘DCA’) 5-View Card. Printed by John Hinde Curteich, Distr. L. B. Prince, Fairfax VA, D. Noble Photos, probably issued in the 1970s or 1980s. In 1970 facilities for TWA and Northwest airlines opened at Washington National. Examples of their aircraft appear in the lower left and center views respectively in this postcard. 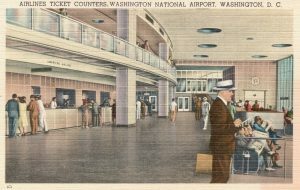 Delta, Pan Am, United, US Air and other airlines also started serving DCA. 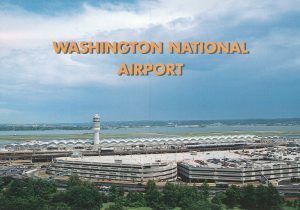 In 1987 U.S. federal control of Washington National Airport (along with Dulles, the more distant Washington airport that mainly serves longer-haul flights) was transferred to the Metropolitan Washington Airports Authority, an independent interstate agency created by legislation of the State of Virginia and the District of Columbia, with the consent of Congress. 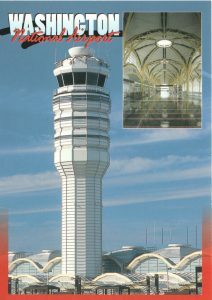 On 12 May 1997 a new modern and taller airport traffic control tower at Washington National was commissioned by the Federal Aviation Administration, and on 27 July 1997 the airport was transformed by the official opening of an entirely new modern north terminal (called Terminals B and C), featuring three levels, 35 aircraft gates and a beautiful ‘National Hall’ concourse with numerous shops and restaurants. Aerial view of Washington National Airport and its new terminal, issued by the Metropolitan Washington Airports Authority, Alexandria VA. Oversize card, 12.4 x 17.7 cms. Control Tower and Interior at Washington National Airport. Distr. L. B. Prince Co., Fairfax VA, no. K25434, E. David Luna Photo. 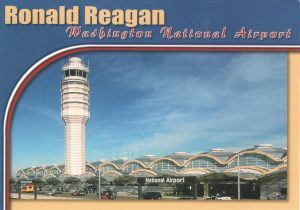 On 6 February 1998 the airport name was changed from ‘Washington National’ to ‘Ronald Reagan Washington National Airport’, in honor of the 40th President of the U.S., who served from 1981 to 1989. The airport code ‘DCA’ remained the same. Front View of Ronald Reagan Washington National Airport, with Control Tower. Pub’r Shin Sung Souvenir Co., Washington D.C., no. 02642, E. David Luna Photo. 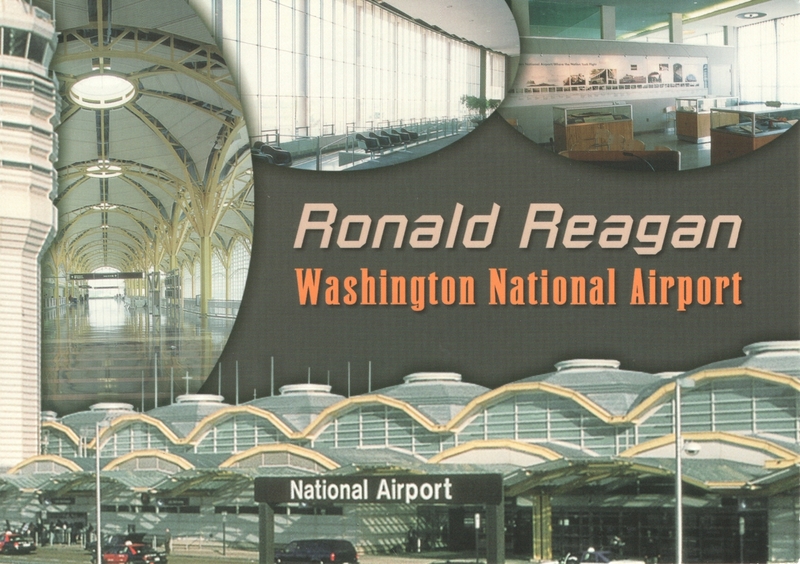 Four View Postcard of Ronald Reagan Washington National Airport. Pub’r Shin Sung Souvenir Co., Washington D.C., no. 02638, E. David Luna Photo. 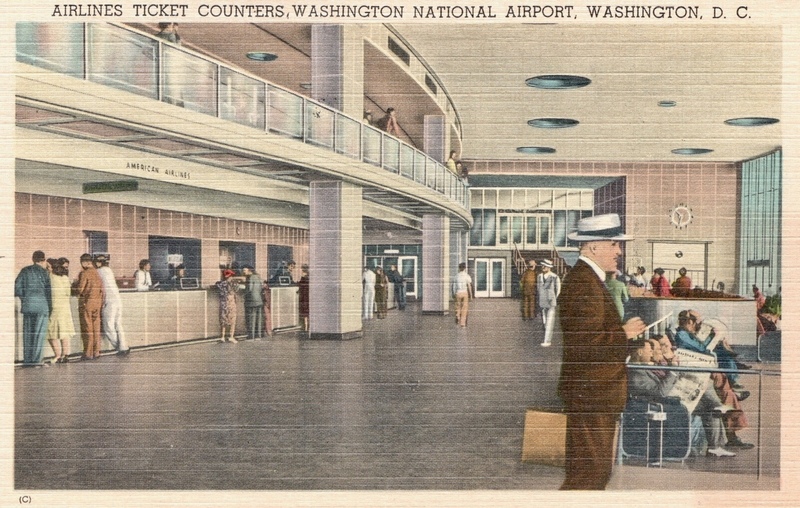 The original terminal at National Airport is now known as ‘Historic Terminal A’. Not only does it still exist, it has been restored during a period of over ten years, with renovation being completed in 2014. It is now used by three airlines, and it also has an area for historical displays. 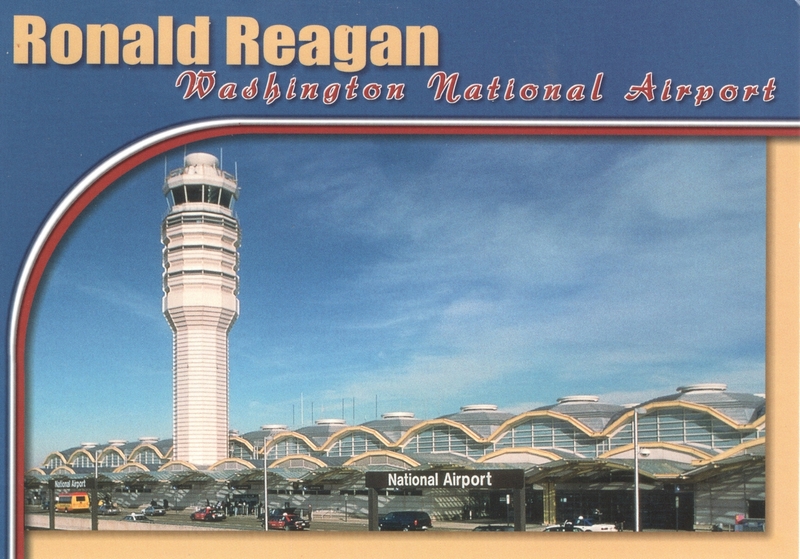 Today Reagan Washington National Airport is served by eight airlines: American and jetBlue (in Terminals B and C), Alaska, Delta and United (Terminal B), and Air Canada, Frontier and Southwest (Historic Terminal A). 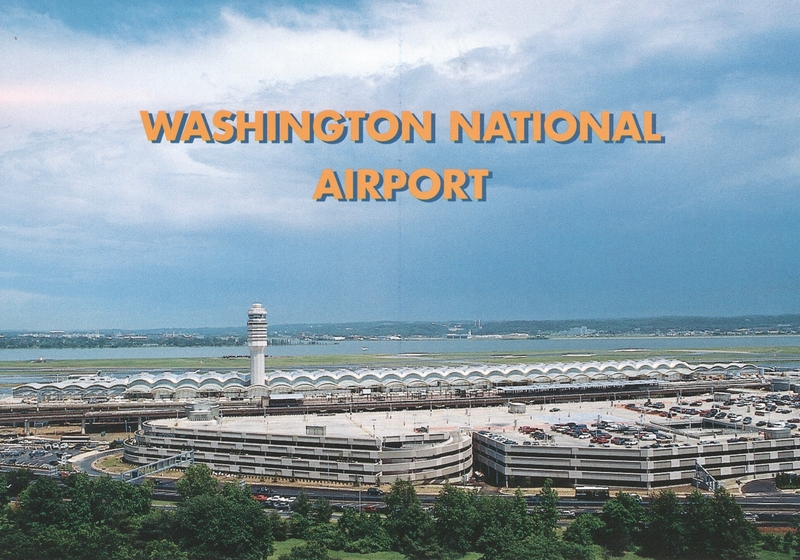 The airport mainly operates as a ‘short-haul’ airport, with flights to destinations no further than 1,250 miles from Washington D.C. per a federally-instituted ‘Perimeter Rule’; however, exceptions to this rule have been granted by the federal government allowing flights to several major cities beyond the perimeter. Also, the largest aircraft types do not operate out of Reagan National because, due to its limited land area, the airport runways are relatively short, the longest being 6,869 ft. (2,094m). Lastly, Reagan National is also subject to the ‘slot rule’ created by the Federal Aviation Administration at certain high-density airports to reduce congestion; this limits the number of landings and takeoffs per hour. In 2014 American Airlines, in order to obtain government approval for its merger with US Airways, was forced to sell 104 takeoff and landing slots at Reagan National. Almost all of those slots were acquired by Southwest and jetBlue Airlines. Despite the limitations on number and distance of flights and size of aircraft, Reagan Washington National Airport today is one of the busiest in the U.S. In 2019 it served nearly 24 million passengers. 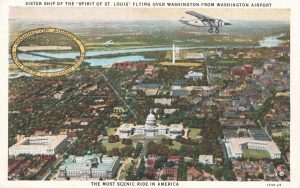 As documented by postcards, the closest airport to the heart of the nation’s capital has come a long way from the sod airstrip at Hoover Field to the modern facility at Reagan National. All postcards shown are in the author’s collection. 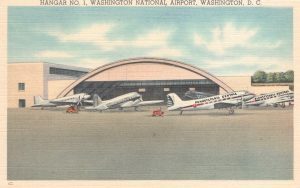 I estimate their rarity as follows: Rare: the Philadelphia Rapid Transit Air Service card; Uncommon: the scenic flights over Washington card, first two Washington National Airport cards, all cards in the 1940s ‘linen’ set, the card with two Eastern Constellations, the Capital Viscount card, and the oversize aerial view of the new terminal. The rest of the postcards are fairly common. Be sure to attend Airliners International DCA 2018, where the convention and show will be held virtually next door to Reagan Washington National Airport. See you there ! Metropolitan Washington Airports Authority, Reagan National, website ‘flyreagan.com’. In the top search box, type ‘about the airport’ and in the list that appears click on the first item ‘About Reagan National Airport’. Website: airfields-freeman.com, tab ‘Abandoned & Little-Known Airfields: Virginia: Arlington County’, by Paul Freeman (revised 18 Feb. 2018). Website: http://famgus.se/Vykort/APC-WNA.html. This site shows all 18 of the early 1940’s Capsco ‘linen’ postcard set of Washington National Airport. Szurvoy, Geza. 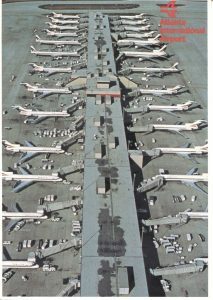 ‘The American Airport’ (MBI Publishing Co., 2003). 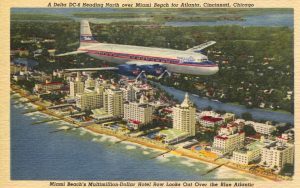 This article covers the earliest pure jet (turbojet) aircraft operated by airlines — the de Havilland Comet, Tupolev Tu-104, Boeing 707, Douglas DC-8, Sud Aviation SE-210 Caravelle, and Convair 880 — all as portrayed on postcards. The de Havilland Comet 1 was the world’s first pure jet aircraft to enter scheduled airline service. It first flew on 27 July 1949 and made its first scheduled airline flight with British Overseas Airways Corporation (B.O.A.C. ), on the London to Johannesburg route, on 2 May 1952. The aircraft represented a revolution in airline travel, in terms of speed, comfort and lower maintenance costs. 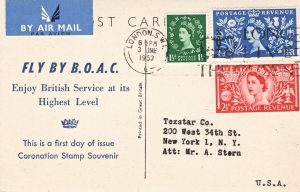 British Overseas Airways Corporation (B.O.A.C.) de Havilland 106 Comet 1. Airline Issue, 1953. Back of preceding postcard. B.O.A.C. 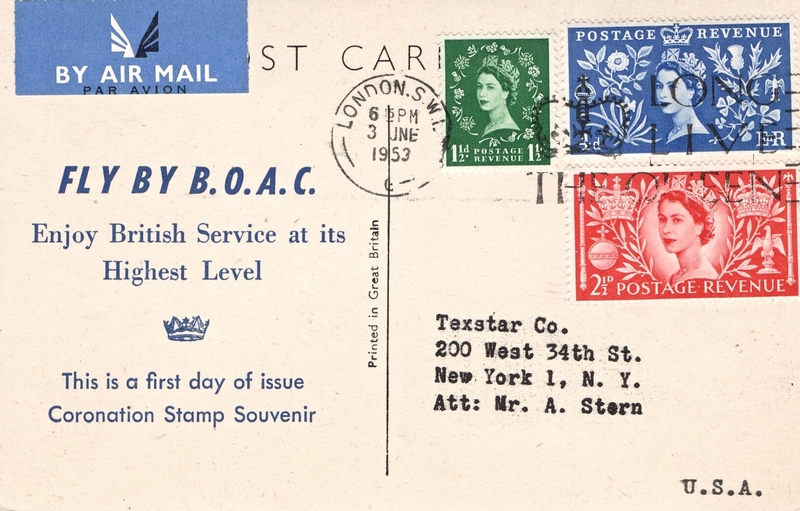 issued this card on 3 June 1953, with postage stamps commemorating the coronation the day before of Queen Elizabeth II of England. The postmark says ‘Long Live the Queen’. Indeed the Queen is still living, well over 60 years later. Jubilation at the introduction of the Comet jetliner, however, soon turned to tragic disappointment, as a series of disastrous fatal crashes of the Comet 1 from October 1952 through April 1954 led to the permanent grounding of the type. Extensive salvage and testing determined that metal fatigue leading to structural failure was the main cause of most of the accidents. 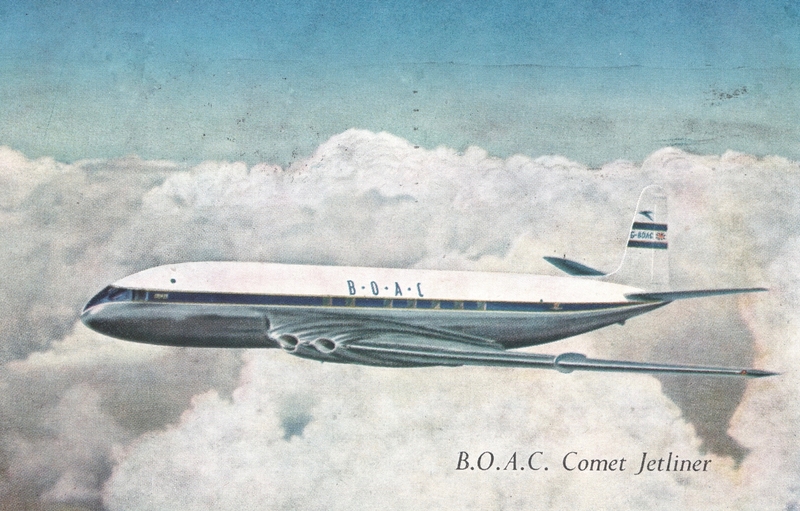 Major changes to the Comet design were made, leading to the ‘Comet 4’, which featured rounded (rather than square) windows and numerous improvements. 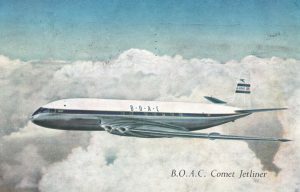 The Comet 4 entered commercial jet service when B.O.A.C. operated the first trans-Atlantic jet flight, London to New York, on 4 October 1958. 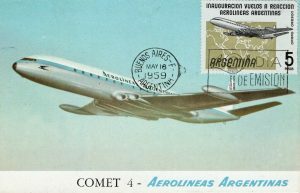 The Comet 4 type was also exported to several other airlines outside the U.K., of which Aerolineas Argentinas was the first purchaser. Amidst the development of the successful first generation jetliners covered in this article, there is one pioneer type worth mentioning even though only one flying example was produced. Starting in 1945 Avro Canada, with some initial collaboration by Trans-Canada Airlines (TCA), worked on developing a medium-range regional pure jet. This resulted in the Avro C102 Jetliner, which first flew in 1949 just a few days after the first flight of the Comet 1. 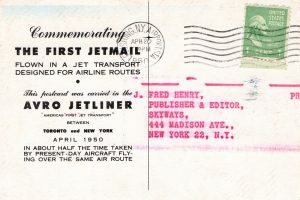 In April 1950 the sole Avro prototype flew the world’s first jet airmail, from Toronto to New York, in 58 minutes, and the crew received a ticker tape parade in Manhattan. Nevertheless, by then TCA had withdrawn from the project, and other sales prospects did not materialize. Avro Canada C102 Jetliner, postcard issued by the manufacturer and carried on the world’s first airmail jet service, from Toronto to New York, April 1950. Back of the preceding card. Meanwhile, at the beginning of the 1950s the Soviet Union started development of its own first pure jet commercial aircraft. This resulted in the Tupolev Tu-104 two-engine medium-range turbojet. 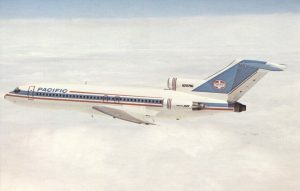 The Tu-104, operated by Aeroflot, was the second jetliner (after the Comet 1) to enter scheduled passenger service, from Moscow to Irkutsk in Siberia, on 15 September 1956. 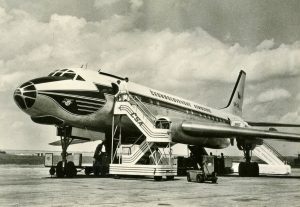 Moreover, as noted aviation historian Ron Davies has pointed out, the Tu-104 provided the first ‘sustained’ commercial jet airliner service, because the Comet was grounded starting in 1954 due to accidents and only resumed passenger service in October 1958 in the form of the new Comet 4. Aeroflot Tupolev Tu-104A, Airline Issue, probably late 1950s. Artist card designed to show the speed and drama of this pioneering jet aircraft. CSA Czechoslovak Airlines Tupolev Tu-104A, OK-LDA, probably late 1950s. Pub’r Orbis. Paul Roza collection. Note the unusual two-story stairway at the front door. CSA was the only export customer for the Tu-104 and utilized them on routes from Prague to Brussels, Paris and Moscow. 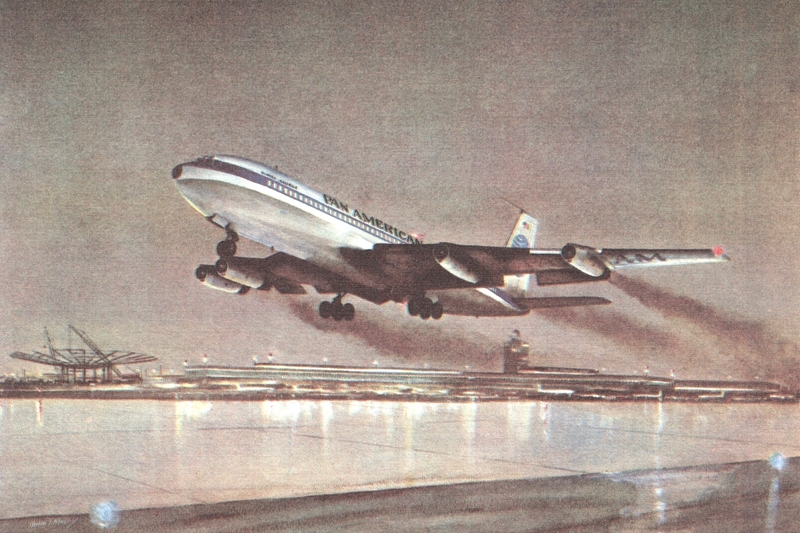 Pan American Boeing 707-100 taking off from New York Idlewild (now JFK) International Airport on the evening of 26 October 1958, on the world’s first 707 commercial flight, trans-Atlantic New York to Paris. Airline issue as part of a historical series of artist paintings on postcards by John T. McCloy. On the left side of this postcard you can see the Pan Am Worldport terminal under construction. Pan Am was the second airline to start trans-Atlantic jet service, just 22 days after B.O.A.C. did so with the Comet 4. Other airlines raced to join the new jet age revolution. TWA’s controlling shareowner, Howard Hughes, ordered 707s in February 1956. New York aviation photographer and publisher George Enell even issued the following postcard in 1957 with an artist’s concept of what a TWA 707 might look like. Artist’s concept of what a Trans World Airlines (TWA) Boeing 707 might look like. Postmarked 27 May 1957. Pub’r Enell, no. 5D. For domestic U.S. pure jet passenger service, the major U.S. airlines tried to outdo one another in being the first to provide it — either with Boeing 707s or with Douglas DC-8s which were being developed simultaneously. This included American, Delta, Eastern, National and TWA. While American and TWA were in line for 707s, Delta, Eastern and National awaited DC-8s which unfortunately were delayed in production. National, upstaging the other airlines and gaining valuable publicity, leased a 707 from Pan American, and on 10 December 1958 it provided the first domestic U.S. commercial jet service, New York – Miami. The first domestic U.S. jet service with an aircraft owned by the airline was provided by American Airlines on 25 January 1959. It was transcontinental, New York-Los Angeles, and it was dramatic. American Airlines Boeing 707 ‘Flying Hi’. Pub’r Colourpicture, Boston MA, no. P31749. 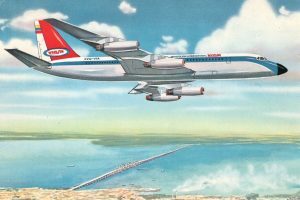 TWA quickly followed, introducing the Boeing 707 on the New York-San Francisco transcontinental route on 20 March 1959. 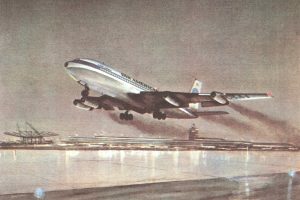 It also was the second airline, after Pan Am, to utilize the 707 on trans-Atlantic service, starting 21 November 1959. TWA Boeing 707-100 takeoff. Pub’r H. S. Crocker Co., San Francisco. You can feel the roar of the engines and see the trail of dark smoke on takeoff, caused by water injection to provide sufficient thrust, that characterized the earliest 707s. 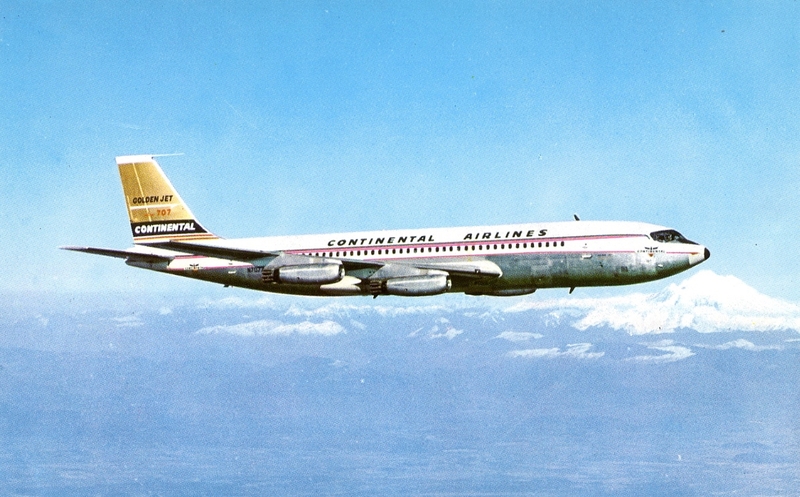 A third early entrant on U.S. domestic 707 service was Continental Airlines. With 707s it initiated Chicago-Los Angeles nonstop service on 8 June 1959. 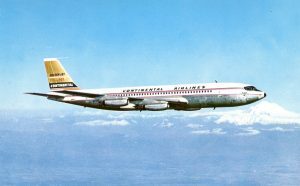 My own first airline flight was on a Continental 707, Los Angeles-Denver-Chicago, 17 December 1959. Here is the postcard obtained from the seat pocket on that flight. 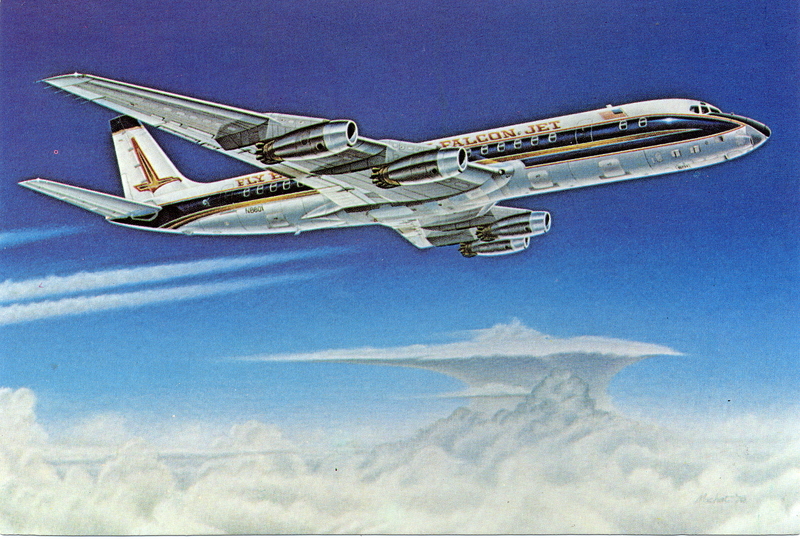 Continental Airlines Boeing 707-100 ‘Golden Jet’, with Mt. Rainier, Washington, in the background, on Boeing pre-delivery flight. Airline Issue, 1959. 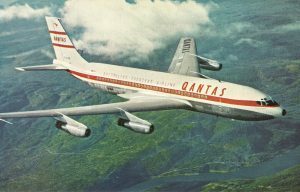 The first non-U.S. airline to operate the 707 was Australia’s QANTAS, on 29 July 1959, on the Sydney-Nadi-Honolulu-San Francisco route. This was also the first pure jet service across the Pacific Ocean. 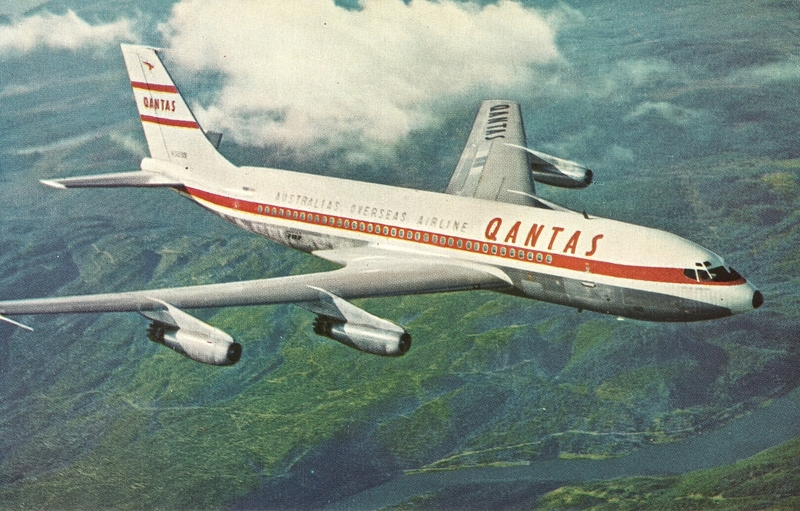 QANTAS Boeing 707-138. Airline Issue, 1959. The earliest 707s of QANTAS were a shorter-bodied type specifically built for it. The first one of that type, originally VH-EBA, was restored to airworthiness in 2006 and is now based at the Qantas Founders Outback Museum in Longreach, Australia. 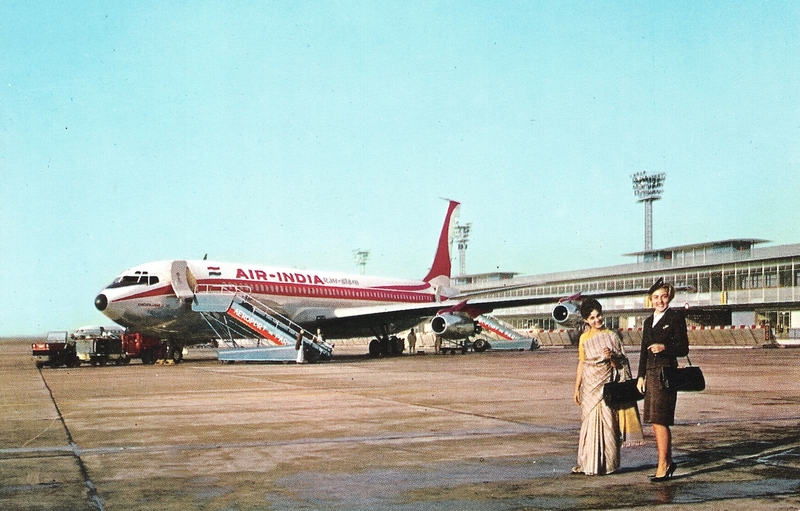 During the first three months of 1960, three European airlines — SABENA, Air France and Lufthansa — introduced Boeing 707s on their trans-Atlantic routes, and Air India became the first Asian airline to operate 707s. Here are postcard examples of these airlines. SABENA Boeing 707-400. 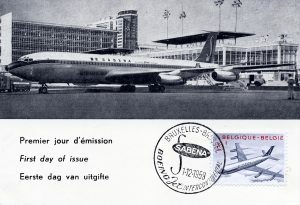 Airline Issue, postmarked 1 December 1959, the first day of issue of a Belgian postage stamp honoring a SABENA 707. 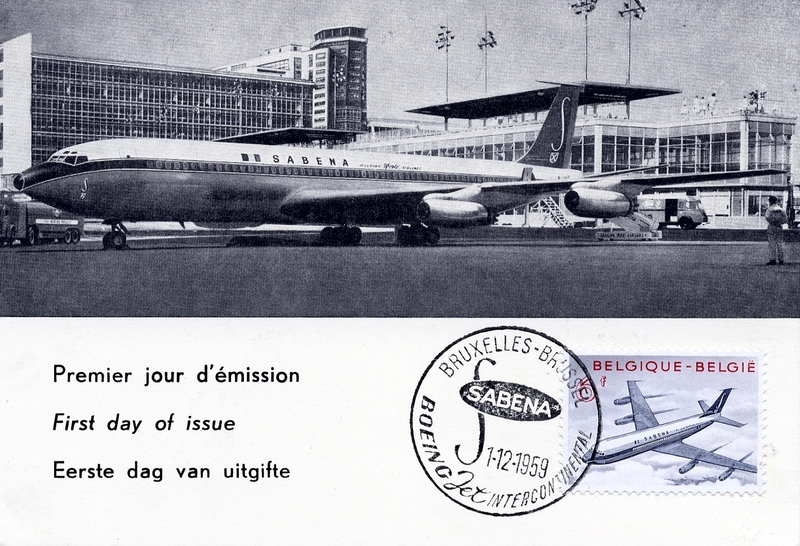 SABENA was the first European airline to introduce 707 trans-Atlantic service, on 23 January 1960. 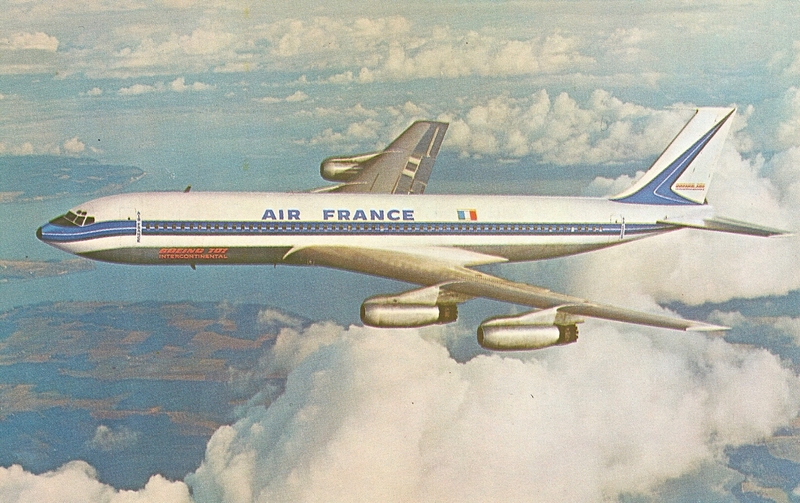 Air France Boeing 707-400. Airline Issue no. S25980. Ex Deke Billings collection. 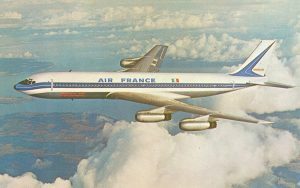 Air France introduced 707 trans-Atlantic service on 2 February 1960. Lufthansa Boeing 707-400 Flight Deck. Airline Issue. Lufthansa introduced trans-Atlantic 707 service on 17 March 1960. Lufthansa Boeing 707-400 Interior and Meal Service. Airline Issue. Air India 707-400 VT-DMN ‘Kanchenjunga’ at Paris-Orly. Editions P.I., Paris, no. 158. The publisher also reprinted this postcard as no. 200. 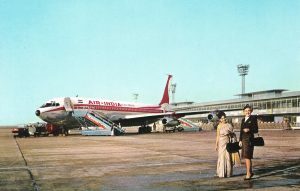 Air India became the first Asian airline to operate pure jet aircraft. 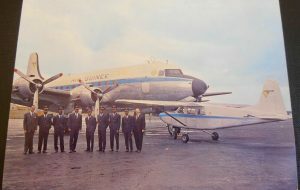 On 14 May 1960 it inaugurated 707 intercontinental service, Bombay-New York with intermediate stops in Beirut and London. 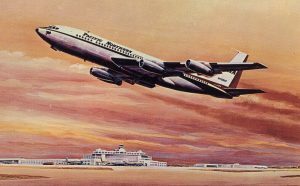 At the same time that Boeing was developing the 707, Douglas Aircraft was working on its first jetliner, which became known as the ‘DC-8’. Unfortunately for Douglas, the 707 entered airline service first, garnering orders from many airlines that wanted to be among the first to offer pure jet service. Several airlines, however, preferred to stick with Douglas aircraft and awaited their first deliveries of DC-8s, which occurred in 1959 and 1960. These included six airlines — Delta, United, Eastern, National, Trans-Canada (TCA) and KLM — who were among the first seven operators of DC-8s (the seventh being Pan Am that also utilized 707s). Here are DC-8 postcards of those six airlines. Delta Air Lines Douglas DC-8-11, N802. Airline Issue, nos. T-312 and 0DK-174. Delta operated the world’s first scheduled DC-8 jet service, New York-Atlanta, on 18 September 1959. United Airlines Douglas DC-8-11. Pub’r Colourpicture, Boston MA, no. P31751; Dist’r Mitock & Sons, Sherman Oaks CA. Eastern, National, Trans-Canada and KLM followed successively in 1960 with their initial DC-8 service. Eastern Air Lines Douglas DC-8-21. Mike Machat artist, 1978. Pub’r Aviation World, Bethel CT nos. AACS-1 and 63188-D. Eastern commenced DC-8 service on 20 January 1960 on its main route New York-Miami. Trans-Canada Air Lines (TCA) Douglas DC-8 at Seawell, Barbados. Pub’r Dexter Press, West Nyack NY no. 63766-B; photo by H. Frisch. Ex Tadd Kotick collection. 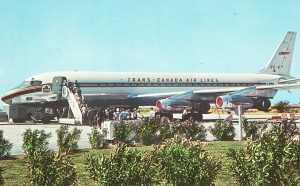 TCA started DC-8 service on 1 April 1960 on route Montreal-Toronto-Vancouver. KLM Royal Dutch Airlines Douglas DC-8-63. Airline Issue. 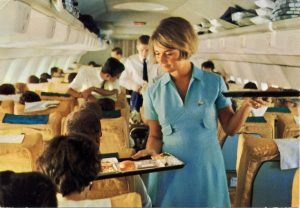 KLM launched DC-8 service on 16 April 1960 on the Amsterdam-New York route. This postcard shows the later and larger DC-8-63 model, which was first flown by KLM. While the British aviation industry and Boeing and Douglas in the U.S. initially focused on four-engine medium to long-range pure jet aircraft, the French aviation industry started in the early 1950s to develop a short to medium-range regional two-engine pure jet aircraft. This resulted in the new rear twin-engine design of what became the Sud Aviation SE-210 Caravelle. Air France Sud Aviation SE-210 Caravelle. Airline Issue, 26-27 September 1959, with postmark commemorating 40 years of commercial aviation in France. 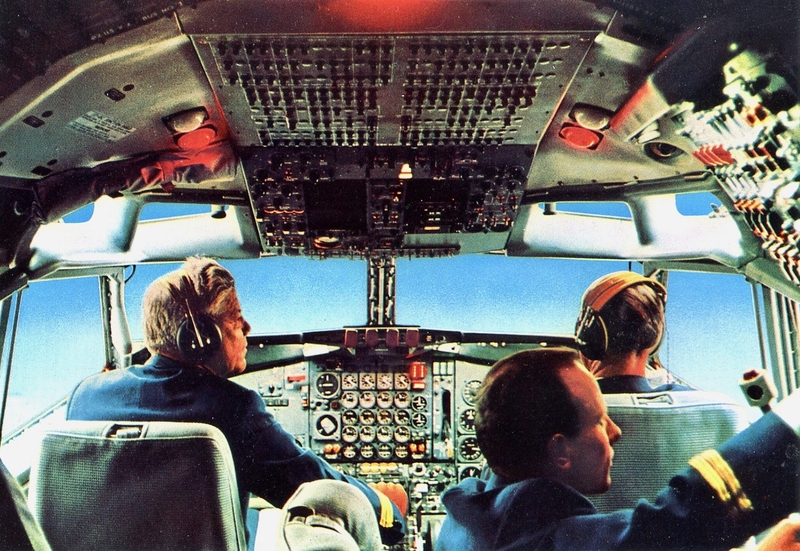 Air France was the first Caravelle operator. It started an experimental Caravelle freight service as early as 21 June 1956, and initiated scheduled passenger Caravelle service on 6 May 1959, Paris-Rome-Istanbul. 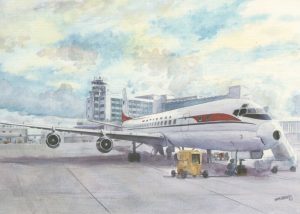 The Caravelle proved to be very popular, and soon several airlines outside France were purchasing the aircraft for their shorter routes. 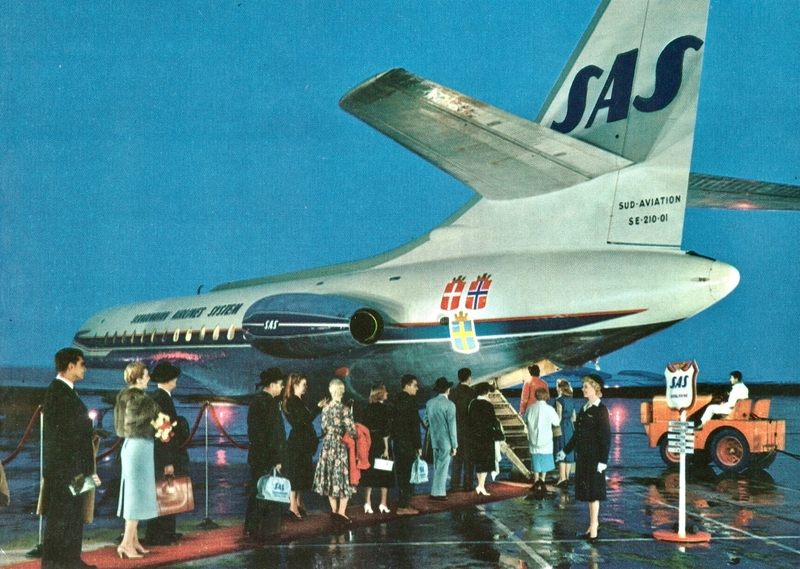 Scandinavian Airlines System – SAS Sud Aviation SE-210 Caravelle boarding passengers. Airline Issue. 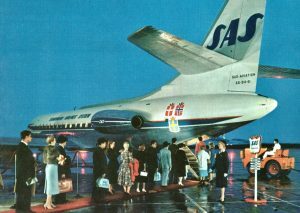 SAS was the second airline to place the Caravelle in revenue service, on 15 May 1959 — just nine days after Air France. It was also the second largest operator of the type after Air France. 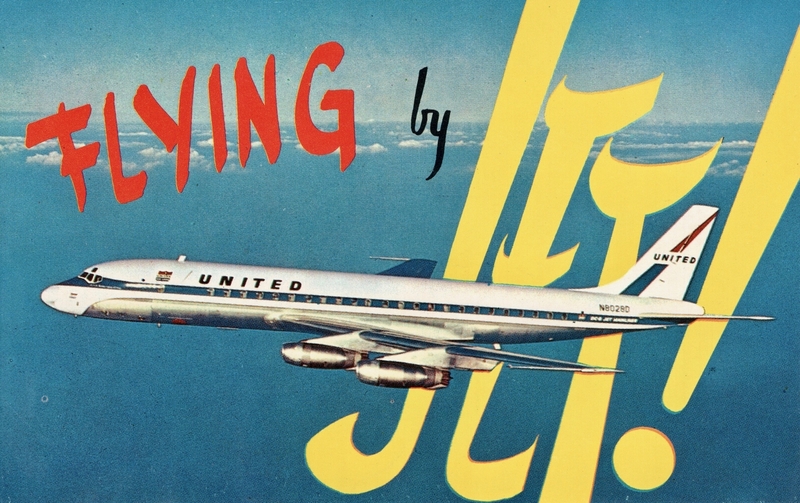 The popularity of the Caravelle was such that United Air Lines surprised the U.S. aviation industry by ordering 20 Caravelle jets in 1960 and placing them in service starting in 1961. United Air Lines Sud Aviation SE-210 Caravelle, N1014U, at Cleveland Hopkins International Airport. Pub’r Curteich no. 7DK-1671, 1967, Dist’r George E. Klein News, Cleveland. Ex Deke Billings collection. 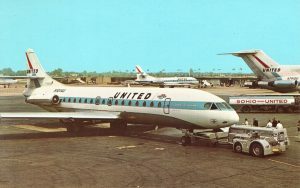 United’s first Caravelle flight was on 14 July 1961, New York-Chicago. In addition to Boeing and Douglas, one more U.S. aircraft manufacturer pursued development of a pure jet in the 1950s — Convair. 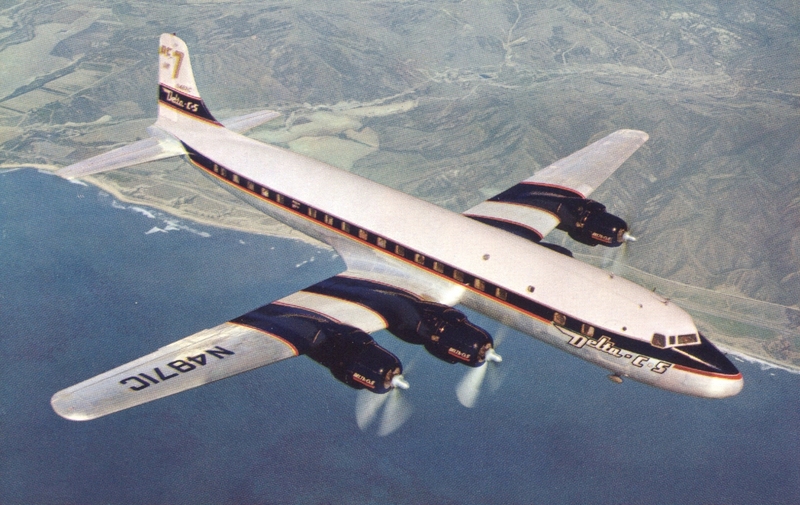 This resulted in the Convair 880, an aircraft famed for its speed. 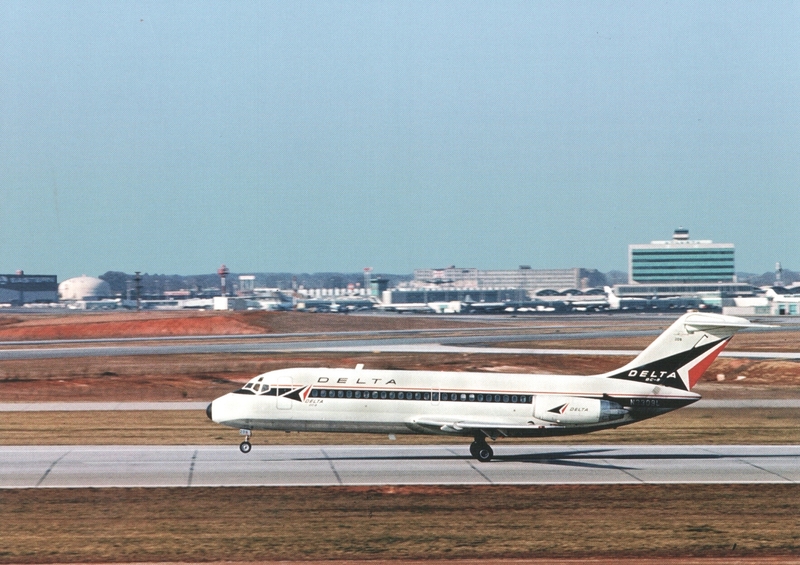 Delta Air Lines Convair 880 taking off from Atlanta. Issued by the Delta Air Lines Heritage Museum, 2002. Delta was the first operator of the Convair 880, placing it on the Houston-New York route on 15 May 1960. VIASA Convair 880, YV-C-VIA. Airline Issue. Vicente Sanchez artist. VIASA was the first Latin American operator of the Convair 880, introducing it in scheduled service on 8 August 1961. I had the pleasure of flying on a VIASA Convair 880 on 10 September 1967, Aruba to New York JFK. I hope you enjoyed this postcard look at the first generation of pure jet aircraft, spanning the 1950s through 1961. If you have any comments on any of my articles, you can contact me through the World Airline Historical Society. Notes: All postcards shown are from the author’s collection, except as noted. 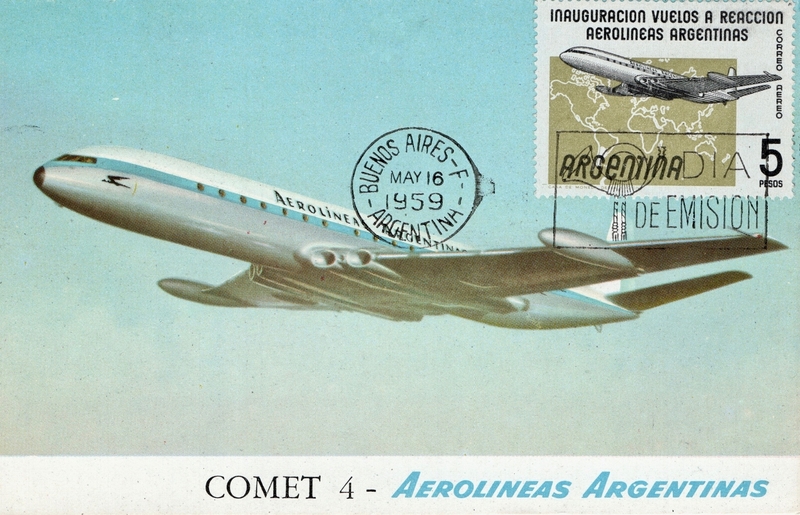 I estimate that all of these are uncommon, except this article’s postcards showing Continental, Delta (both), Eastern, KLM, Pan Am and QANTAS aircraft, which are fairly common. Proctor, Jon; Machat, Mike; and Kodera, Craig. From Props to Jets: Commercial Aviation’s Transition to the Jet Age 1952-1962 (Specialty Press, 2010). Breffort, Dominique. Boeing 707 (Historie et Collections, Paris, 2008). Davies, R.E.G. Individual books on the de Havilland Comet, Aeroflot, Delta, Eastern, Pan American and TWA (Paladwr Press, various dates). Davies, R.E.G., Airlines of the Jet Age (Smithsonian, 2011). Kennedy, Charles. ‘The Douglas DC-8’, Parts I and II, Airways Magazine (Jan.-Feb. 2016). Proctor, Jon. Convair 880 & 990. Great Airliners Series Vol. One (World Transport Press 1996). Waddington, Terry. Douglas DC-8. Great Airliners Series Vol. Two (World Transport Press 1996). Wegg, John. Caravelle: The Complete Story (Airways International 2005). In March 1929 a group of airline investors formed a holding company called The Aviation Corporation (‘AVCO’) which proceeded to acquire and combine over 80 small airlines launched between 1926 and early 1929. In January 1930, AVCO’s airline subsidiaries were reorganized and incorporated into ‘American Airways’, and in April 1934 American Airways became transformed into American Airlines, Inc.
Postcards of individual airline predecessors of ‘American Airways’ range from uncommon to rare to nonexistent. One of these predecessors, which did issue a few postcards, was Colonial Air Transport. Founded in 1926, Colonial began passenger service between New York and Boston in April 1927. Ford Trimotors entered its fleet in early 1929, and that year Colonial became one of the component airlines of AVCO which in turn became American Airways in 1930. In 1933 American Airways introduced the Curtiss T-32 Condor aircraft, and following the April 1934 transformation into ‘American Airlines’, the latter started utilizing the Condors for the first sleeper service in the U.S. 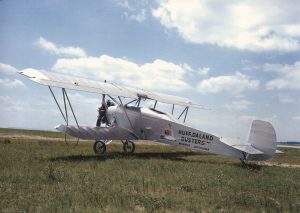 The Condor was also the last biplane built in the U.S. for commercial airline service. Also in 1934, American Airlines introduced the Vultee V-1 aircraft. American used the Vultee on routes from the Great Lakes to Texas. According to noted airline historian Ron Davies, the Vultee V-1s were the fastest commercial airliners of their day, but they also symbolized the end of the single-engine era. American Airlines Vultee V-1, NC13767. A/I, probably in 1934. The postcard back claims that American Airlines is ‘Largest in the United States’ and that ‘American’s fleet of fast Vultees is making air travel history’. 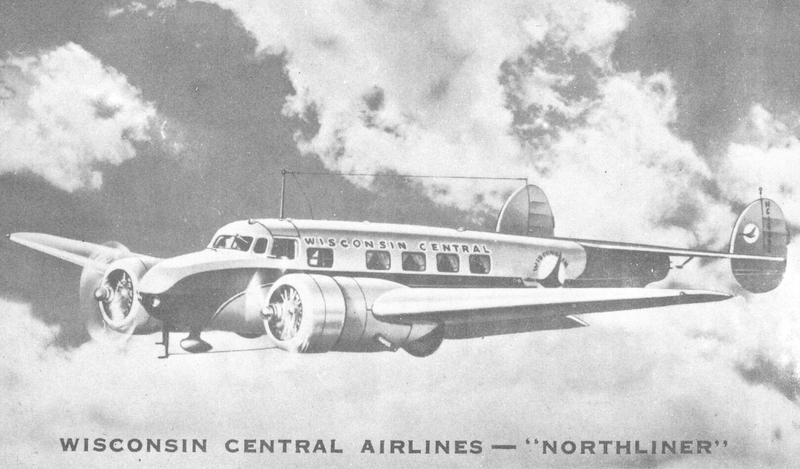 In December 1934 American introduced to its fleet the more modern Douglas DC-2 (which had first flown on scheduled service with TWA the previous May). 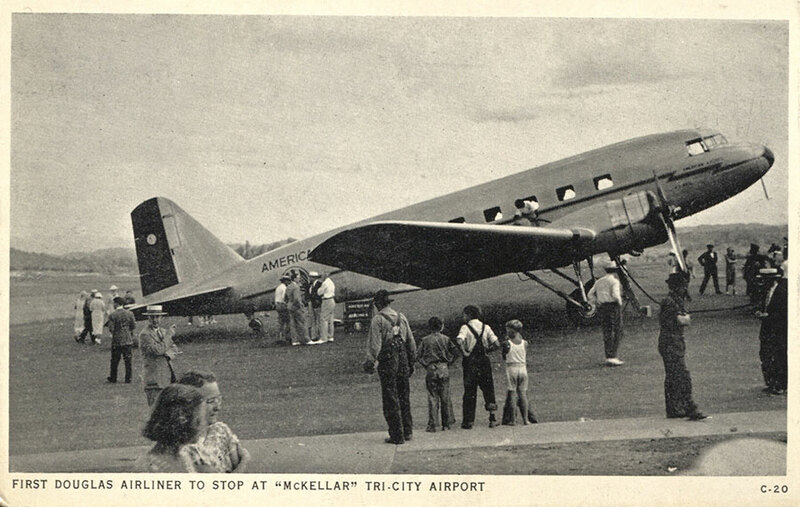 American Airlines Douglas DC-2 at McKellar Tri-City Airport (now Tri-Cities Regional Airport), Tennessee. Airport card no. C-20, printed by Fort Wayne Printing Co., Fort Wayne, Indiana. I love the country folk viewing the ‘modern’ aircraft in this postcard. I acquired two copies of this rare card at a local postcard show about 25 years ago, kept one, and traded the other to Allan Van Wickler. I presume that trader eventually went to the Smithsonian National Air and Space Museum along with the rest of Van’s postcard collection that he donated to them. At the initiative of legendary American Airlines president C. R. Smith, Douglas Aircraft developed the famous classic DC-3 aircraft as a successor to the DC-2. American placed the first order for the DC-3, with half of them being the Douglas Sleeper Transport (‘DST’) variant, and American was the first to operate the DC-3 in commercial passenger service — on 25 June 1936. With the DC-3 American started calling its airliners ‘Flagships’. 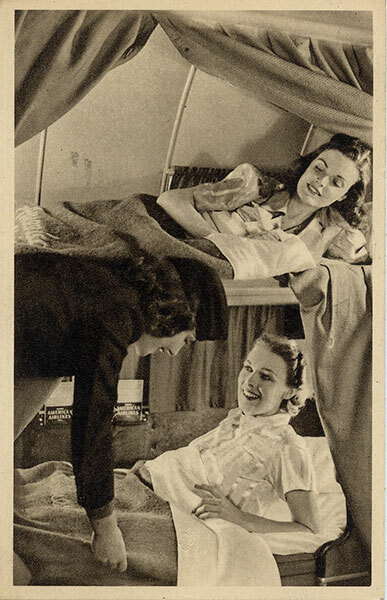 American Airlines Douglas DC-3, DST, Interior Sleeping Berths. A/I, no. A-245-F. Written messages on postcard backs are often informative and can enhance the value of particular cards. Here is the back of the preceding DC-3 sleeper transport card, written in March 1939 during a New York to Los Angeles transcontinental stop in Dallas, Texas, which even back then was a primary American Airlines hub. 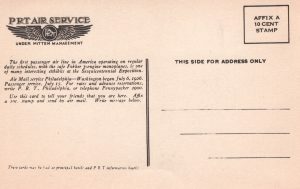 Postcard Back of American Airlines DC-3 DST Sleeper Berth card no. A-245-F. American called this transcontinental flight its ‘favorable Southern All-Year Route’, flying overnight from New York, coast-to-coast service with ‘only 3 stops’ and no change of planes, arriving in Los Angeles in the early morning. During the 1930s American (as well as Eastern and United) issued map postcards publicizing their routes. The following one issued by American and distributed on board encouraged passengers to mark their route in pencil and mail it to relatives and friends. American Airlines Route Map Postcard, A/I, no. A-245-C, issued about 1939. There are at least two variants of this card showing slight route changes. American Airlines Douglas DC-3 at Washington National Airport. Pub’r Air Terminal Services, Washington National Airport; Printer Capsco, Card ‘C’. ‘Linen’ finish. Starting in 1946, following the end of World War II, American introduced to its fleet four-engine Douglas DC-4s followed successively by DC-6s (1947) and DC-7s (1953). It also placed in service two-engine Convairs, being the first airline to order the model 240. Many postcards feature these propeller types. Here are a few. American Airlines Douglas DC-6 over Manhattan. Real photo postcard by Enell, no. 4. American was the first operator of the pressurized DC-6. American Airlines Douglas DC-7, N334AA ‘Flagship Vermont’, at Los Angeles International Airport. Photo by Bill Eccles. Pub’r H. S. Crocker Co., Los Angeles, no. LA-1095. This aircraft was with American from 1956 to 1962. The nose of this DC-7 is on display at the Smithsonian National Air and Space Museum, Washington DC. 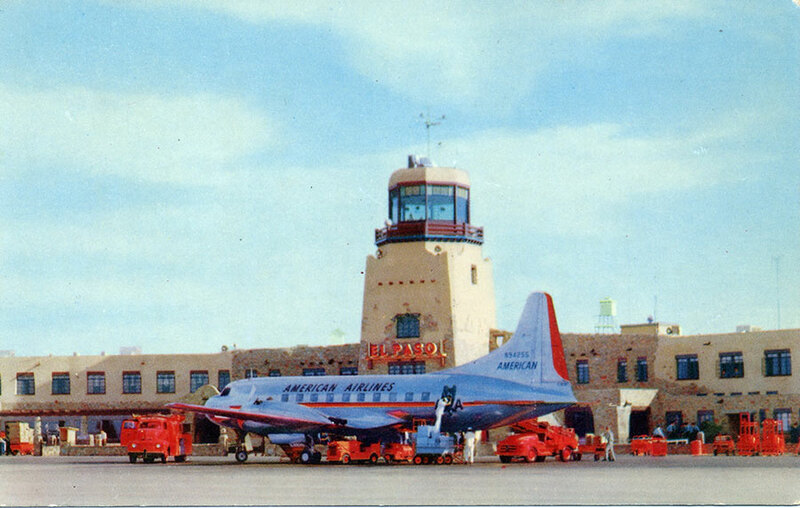 American Airlines Convair 240, N94255, in fleet 1948-1953, at El Paso International Airport, Texas. Pub’r Petley Studios, El Paso, no. 653. American became the first airline to order the turboprop Lockheed Electra, and the type entered service with American in January 1959, just a few days after Eastern. American Airlines Lockheed L-188 Electra, L6125A, at Little Rock Municipal Airport, Arkansas. Pub’r Siebert News, Little Rock, Colourpicture no. P61020 L-7. Ex Deke Billings collection. American entered the jet age with the Boeing 707. On 25 January 1959 American became the first airline to start domestic pure jet service in the U.S. with its own aircraft, its first 707 route being the prestigious nonstop transcontinental route between New York and Los Angeles. My own first flight with American was in May 1965 on one of their Boeing 707s, when I moved from Los Angeles to New York. This was the first of over 230 flights I’ve had on American. 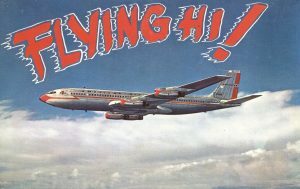 It was a great feeling to fly on American’s 707s, and this postcard tells it all. American Airlines Boeing 707 ‘Flying Hi’. Pub’r Colourpicture, Boston Mass. no. P31749. 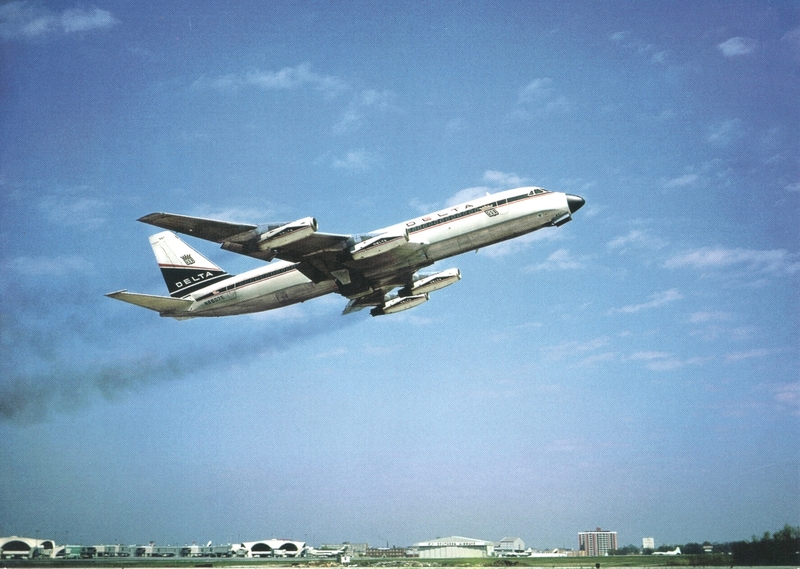 American also ordered Convair jets to its own specifications, which became the Convair CV-990, seeking an even faster transcontinental jet than the 707. However, this type’s entry into service was delayed until March 1962, and it proved less economical than the 707. American Airlines Convair CV-990A. A/I no. T-151-12B, probably 1962. 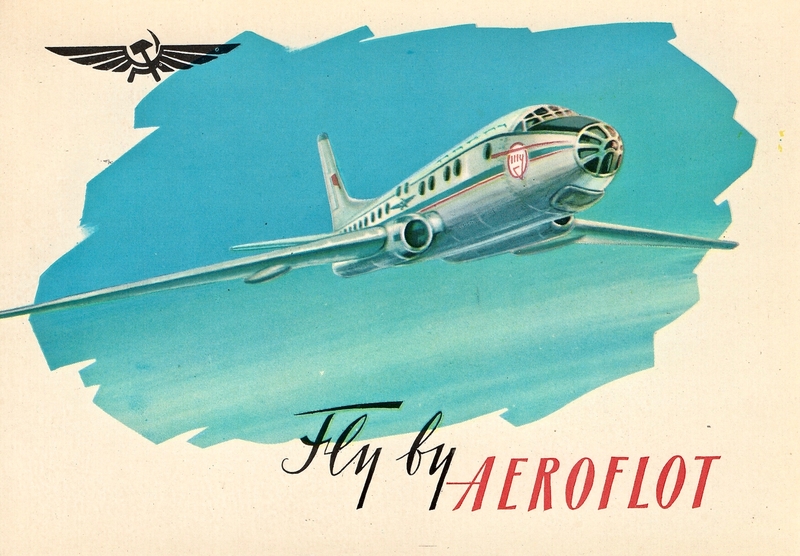 The postcard back calls the 990A ‘the most advanced jet airliner in commercial operation’. The four-engine jets were soon followed by the classic workhouse short-haul tri-jet, the Boeing 727, operated by American starting in April 1962. American Airlines Boeing 727. A/I no. T-152, probably 1962. In March 1966 American added to its fleet two-engine pure jet British Aircraft Corporation BAC 1-11-400s. Here is the front and back of an unusual postcard-sized card issued by American, apparently by its Chicago office, which has a local Chicago to St. Louis timetable on its back. American Airlines BAC 1-11-400. A/I, 1966, apparently by American’s Chicago office. Ex Deke Billings collection. 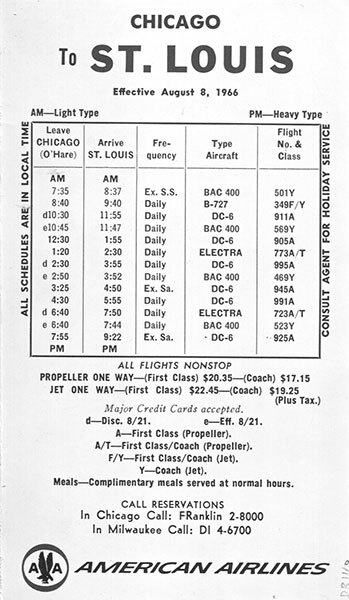 The timetable on its back shows flights between Chicago and St. Louis being operated by four different aircraft types of four different manufacturers! — Douglas DC-6, Lockheed Electra, Boeing 727, and the highlighted BAC-1-11-400s. Take your pick! Back of foregoing American Airlines BAC 1-11-400 card. In March 1970 American placed into commercial service the Boeing 747 jumbo jet, the first wide-body two-aisle aircraft. American Airlines Boeing 747-100. A/I no. T152, 1970. 12.7×25.4 cms. 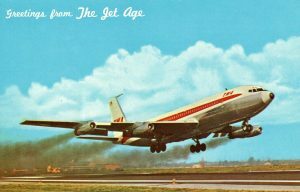 (Naturally, for a jumbo aircraft American had to issue a jumbo postcard). 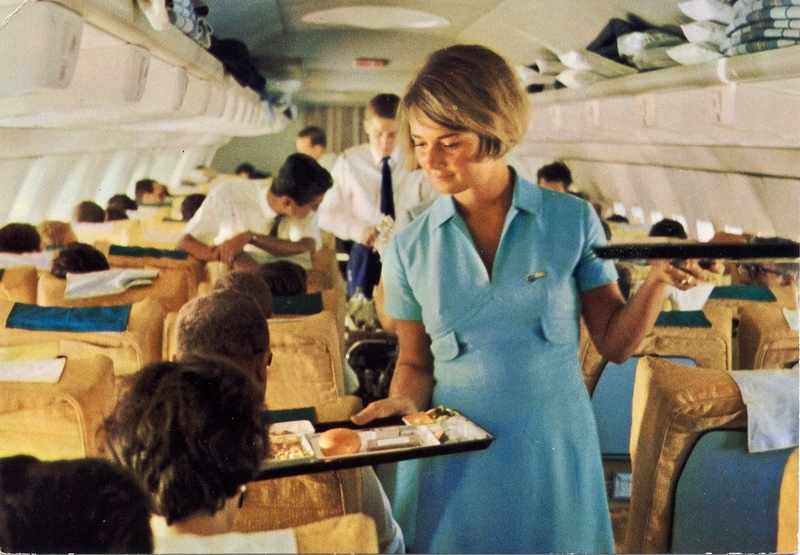 The livery shown was introduced in 1967 and continued as American’s main color scheme until 2013. Waiting at JFK Airport to board an American Airlines 707, flight 1 to Los Angeles, on 27 February 1970, I noticed a large crowd gathering at a nearby gate and gawking at the most humongous plane I had ever seen. American had parked their first brand new 747-100 so their local cabin and ground crews could practice their new work duties. That was my first actual view of a 747. Two weeks later, on my return flight ‘AA 2’ from LAX to JFK, I flew in a new American 747. 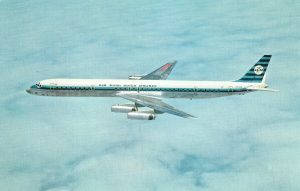 Meanwhile, Douglas Aircraft developed the wide-body tri-jet Douglas DC-10, and American became the first operator of the type, a DC-10-10, on 5 August 1971. American Airlines Douglas DC-10-10, Cutaway View. A/I, 1971. 15.2×22.8 cms. Ex Allan Van Wickler collection. Except for operating later series of the 747 and DC-10, and the MD-11, all of American’s subsequent aircraft types have been two-engine aircraft. American Airlines MD-80 series aircraft at Dallas-Fort Worth International Airport, Pub’r The Texas Postcard Co., Plano TX, no. D-150 711. For short hauls, the MD-80 series aircraft became a classic workhorse for American, and they were heavily utilized at American’s DFW Airport hub. At the southern end of DFW, in Fort Worth, Texas, American maintains its world headquarters, flight training academy, and the American Airlines C. R. Smith Museum. American Airlines Boeing 757. A/I. This card and the next are two of the relatively few postcards issued by American since 1990 that show aircraft. American Airlines 8-Airliner View Card. A/I. Part of a series of postcards issued between 1991 and 2001, at the same time as the preceding card. I do not have a postcard issued by American that shows its new aircraft livery introduced in 2013. However, for those postcard collectors who also collect airline-issue postcard-sized advertising cards, particularly those featuring aircraft, here is a beautiful American airline-issue card featuring their Boeing 777 in the new livery. The back of the card advertises American’s ‘Travel Center’ in New York City. American Airlines Boeing 777-300ER in New Livery. On 17 January 2013 American unveiled its new livery on its first Boeing 777-300ER aircraft which went into service later that month. Advertising card issued by American’s New York City Manhattan office in 2015. Over the years American Airlines has acquired several other airlines. 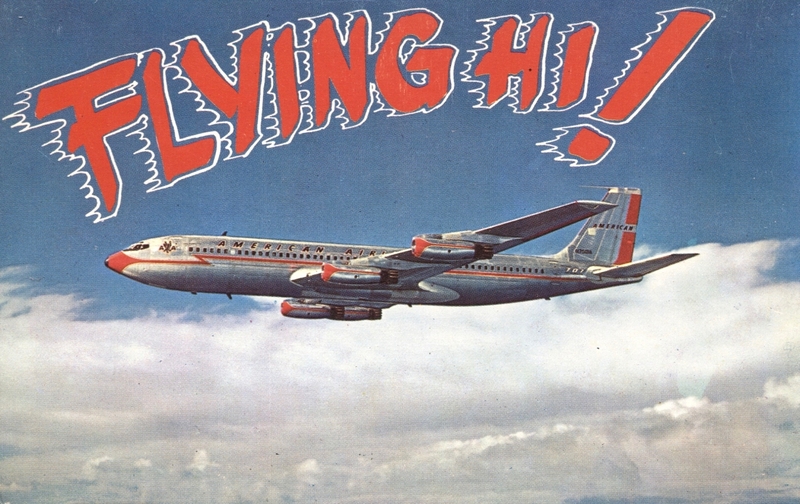 Here is a selection of postcards issued by airlines that became absorbed into the American Airlines system. In 1945 American acquired American Export Airlines and renamed it American Overseas Airlines (‘AOA’). AOA was utilized for trans-Atlantic routes to Europe, particularly London, Copenhagen and Hamburg. American Airlines eventually sold AOA to Pan Am in 1950. American Export Airlines Vought-Sikorsky VS-44 ‘Excalibur’, NX41880. Part of the LaGuardia Airport series of 21 cards issued in 1944 or 1945. Pub’r Harry H. Baumann, New York NY, no. E-6202. ‘Linen’ finish. A companion card with a different VS-44 view is also part of the set as no. E-6203. 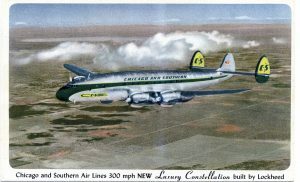 Noted airline postcard collector Doug Bastin of Chester, England, sent to me scans of several rare American Overseas Airlines postcards from his collection for possible use in this article. Here are three of them. American Overseas Airlines Lockheed Constellation at London Heathrow at the original temporary hutted terminal, viewed from the first public viewing facility. (Now, how’s that for a great plane spotter’s view?). Pub’r E A Wilson. Doug Bastin collection. American Overseas Airlines Douglas DC-4 at Copenhagen. Pub’r F. Munthe no. 5572. Doug Bastin collection. According to Doug, there is a companion card, no. 5573, showing AOA DC-4 N90906, Flagship Copenhagen’ with AOA titles, being refueled at Copenhagen, and it’s possible the titles were removed from this no. 5572 postcard image following the sale of AOA to Pan Am. American Overseas Airlines Boeing B-377 Stratocruiser, N90941 Flagship Great Britain, at Zurich. Swissair Photo no. 5199. Doug Bastin collection. According to Doug, the image clearly shows the Curtiss propellers unique to the AOA and United Airlines fleets. A companion card, no. 5200, shows a different view of this aircraft in Zurich, apparently taken at the same time. Bruce Charkow’s original of that companion card appears in the postcard column of The Captain’s Log ‘Majestic Propliners’ issue, Spring 2013. Other significant airlines acquired by American Airlines from the 1970s to the present include Trans Caribbean Airways, Air California, Reno Air, TWA and US Airways. Here is a postcard selection. Trans Caribbean Airways Douglas DC-8. A/I. Trans Caribbean operated mainly from New York, and also from Washington DC, to Caribbean destinations. Trans Caribbean merged into American Airlines in 1971. Air California Boeing 737-200, N463GB, in fleet 1968-72. A/I no. 160578, postmarked 14 January 1970. Ex Deke Billings collection. Air California was founded in 1967, initially to operate flights within California out of Orange County airport. It changed its name to AirCal in 1981, and was acquired by American Airlines in 1987. Reno Air McDonnell Douglas MD-80 series. A/I. Reno Air operated from 1992 until 1999 when it was acquired by American Airlines. Trans World Airlines (TWA) Boeing 767-200 in the airline’s last color scheme before being acquired by American Airlines. A/I. Printer, Platz Press. 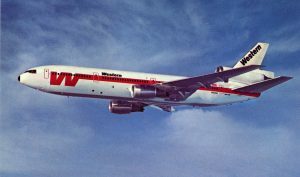 TWA was one of the most noted airlines in aviation history. It operated from 1925 until 2001 when it was merged into American. TWA was featured in issue 26-1 of The Captain’s Log (2001). US Airways Airbus A330-300. A/I. US Airways traces its history back to 1937. 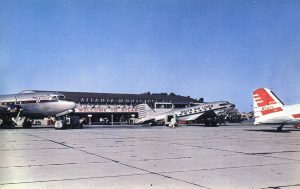 Predecessor airlines include Allegheny (name changed from All American Airways), Lake Central, Mohawk, Pacific Southwest (PSA), Piedmont and American West. In 1979 the airline adopted the name ‘US Air’ and then changed it in early 1997 to ‘US Airways’. The lengthy merger process of US Airways into American Airlines was completed in 2015. The Captain’s Log issue of 26-2 (2001) featured US Airways. ‘American Eagle’ is a brand name started by American Airlines in 1984 as a means of partnering with small regional airlines, with coordination of regional flights to feed into American’s network. Aircraft would be painted in an American Eagle livery, but be operated by one of several regional airlines. During 1987-89 American Airlines acquired most of its partner feeder airlines. However, starting in 2012 American Airlines started contracting out its ‘American Eagle’ brand to increasing numbers of independently owned regional airlines. Here is just one sample postcard of the many airlines that have flown under the ‘American Eagle’ brand. American Eagle Embraer 120 Brasilia, N124AM of Air Midwest at Wichita, Kansas, August 1986. BUCHairCARD 8736. Air Midwest operated from 1985 to 1988 when its assets were acquired by AMR, American Airlines’ holding company. Notes: Except as noted, all postcards shown are standard or continental size and from the author’s collection. I estimate their rarity as follows: Rare: the Colonial and American Airways cards, the American Airlines Curtiss Condor, Vultee, DC-2 and BAC 1-11-400 cards, and the American Overseas Airlines Constellation and B-377 Stratocruiser cards; Uncommon: the American Airlines two DC-3 DST cards and the DC-6, DC-7, Convair 240, Electra, 747-100 and DC-10-10 cards, and the American Export Airlines VS-44 and American Overseas Airlines DC-4 card; the rest are fairly common. Airliners International 2016 New Orleans — Postcard Contest. Many thanks to all who submitted the beautiful entries in the AI 2016 postcard contest. 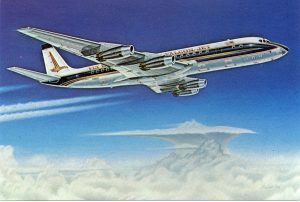 Congratulations to the prize winners: 1st place, William Demarest, ‘Unusual Boeing 727-100 Postcards’; 2d place, John Bretch, ‘Convair 880/990’, and 3d place, William Baird, ‘Fokker F27’. Thanks also to the three postcard contest judges, Armen Avakian, Rick Neyland, and Peter Winck. The AI 2017 show in Denver will also have a Postcard Contest. You are invited to submit an entry–it’s fun and also promotes our airline postcard collecting passion. The contest rules are posted on the AI 2017 website. Davies, R.E.G. Airlines of the United States since 1914, Smithsonian Press (1972), and Airlines of the Jet Age, Smithsonian (2011). Bedwell, Don. Silverbird: The American Airlines Story. Airways International (1999). American Airlines website, aa.com, links at ‘About us’, ‘History of American Airlines’ (2016). Wikipedia online articles on American Airlines and its predecessors and affiliates.